this my 20th friday breakfast community meal at teban gardens community service centre. 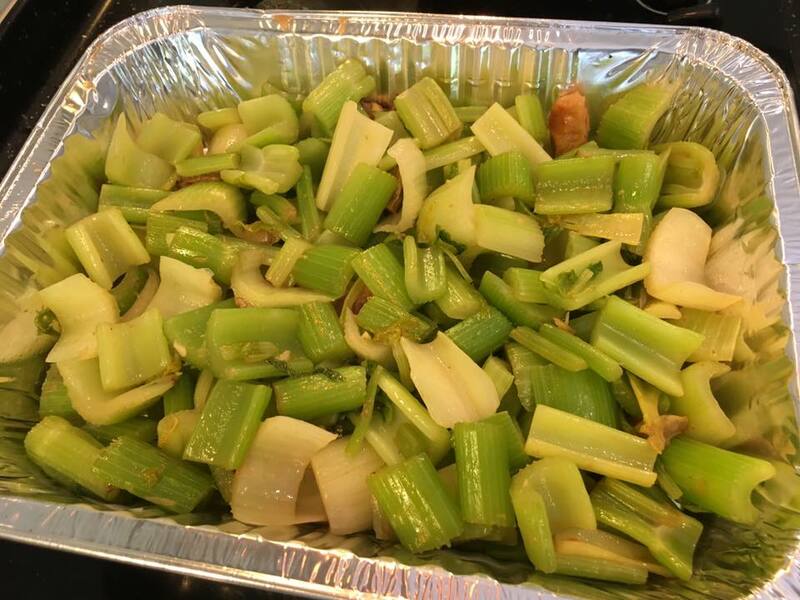 i cooked the celery & the pork collar separately. 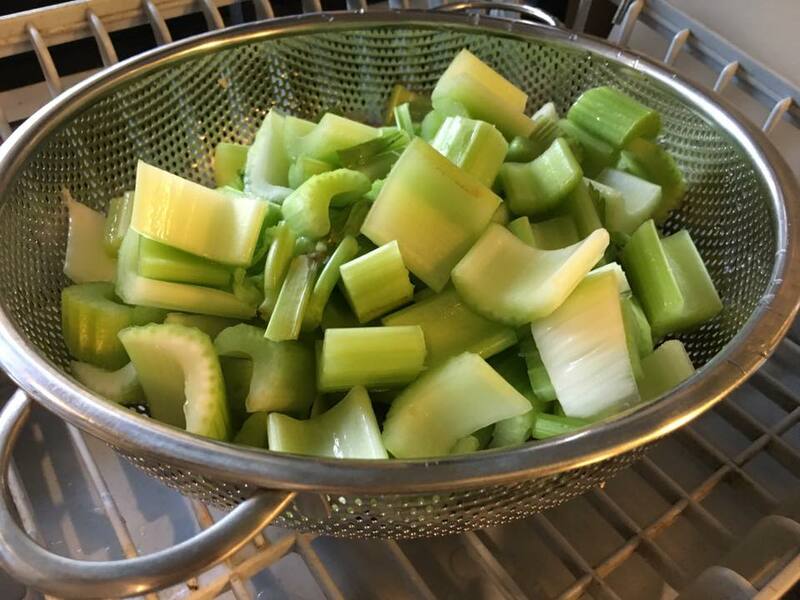 placed the celery in the aluminium tray. then topped with the pork collar. 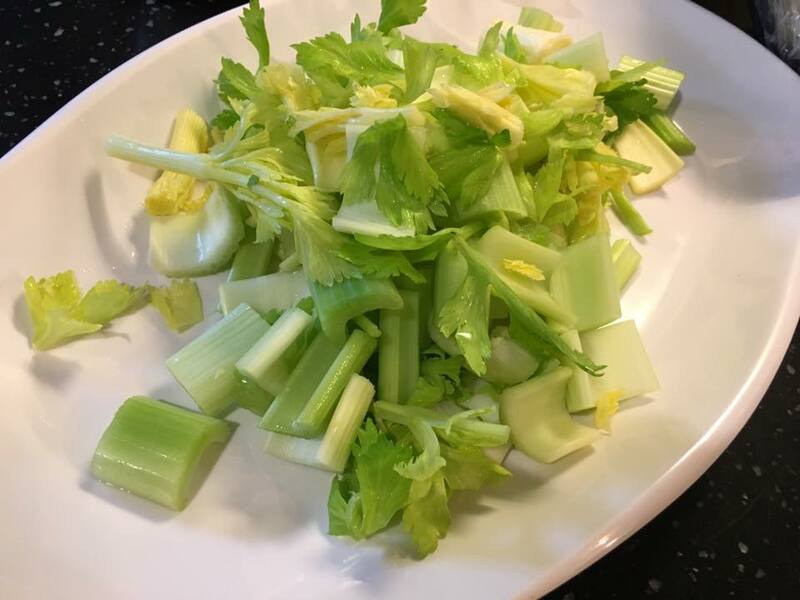 i cooked the celery first. 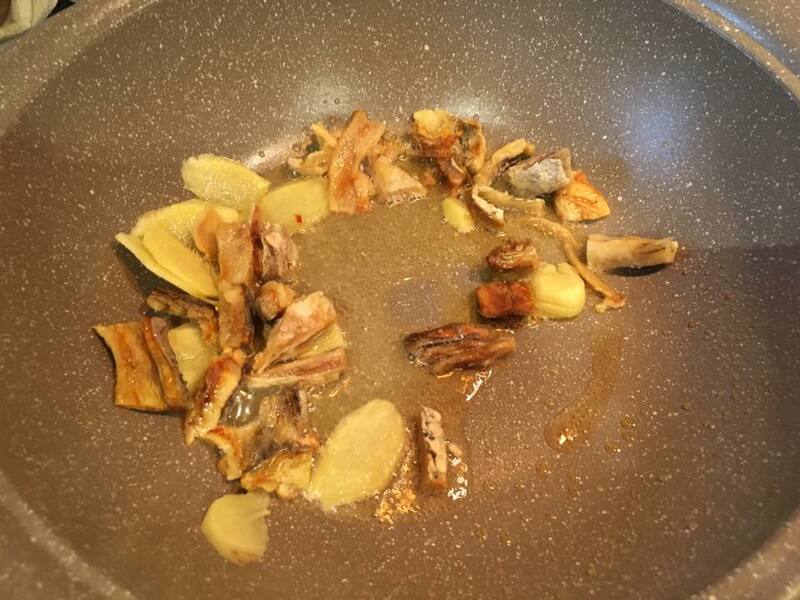 fried the sliced ginger & & salted fish first. added garlic fried till fragrant & not burnt. 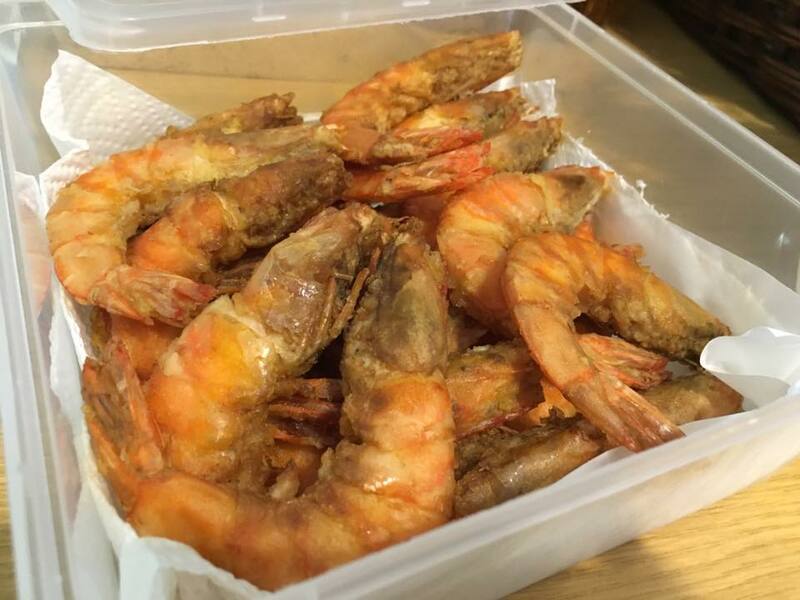 the salted fish i used a cheap treadfin packet – S$2.80 for about 300g? i like the flavour. it is cheap but good. 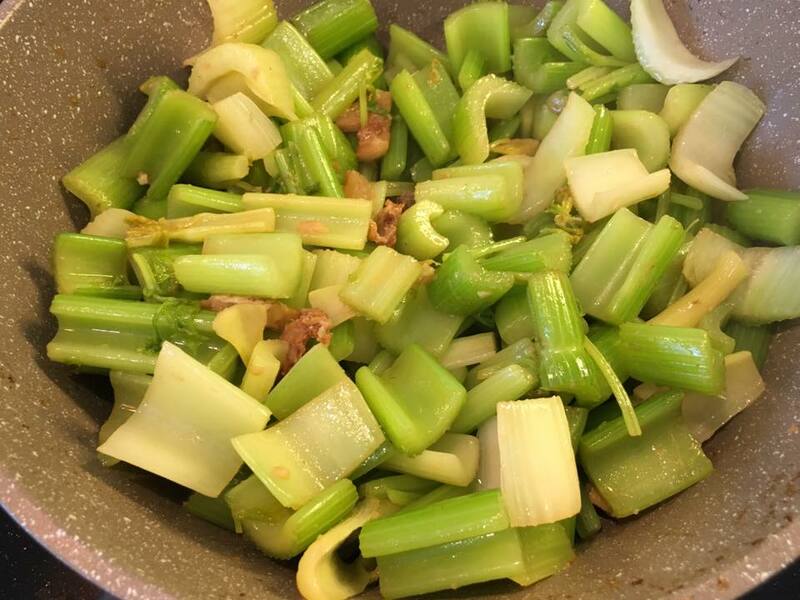 then added the celery stalks, fried & covered for few minutes, then added the tender shoots. 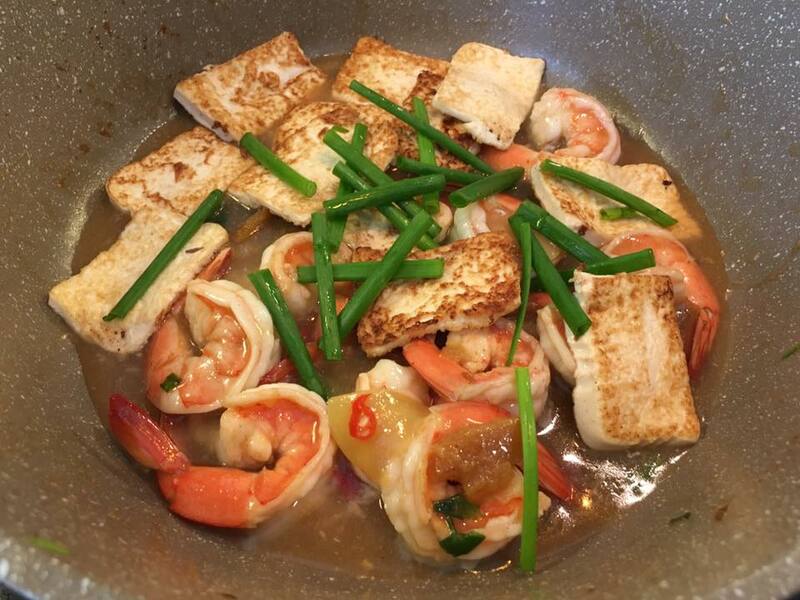 i tasted & decided to add some oyster sauce, about 1 heap tbsp. 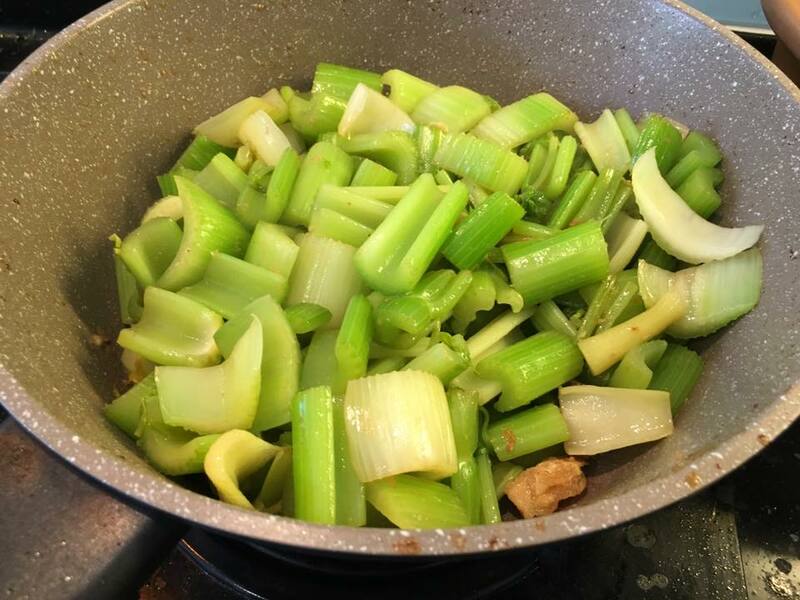 i cooked 2 whole celery, so about almost 3kg, maybe 2.5kg, quite a bit anyway. 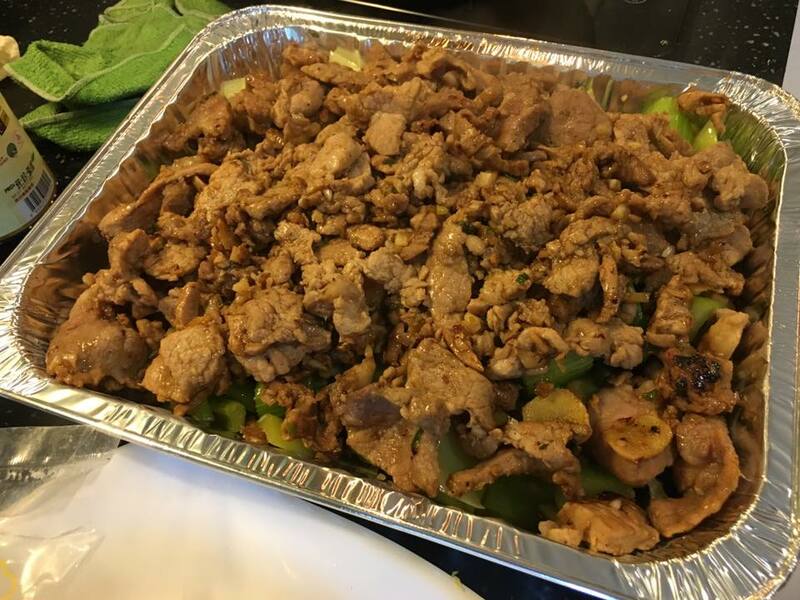 this a vietnamese chargrilled pork recipe. this time i had 1.3kg NOT 300g, but this for older folks. i didn’t want it too salty or sweet, so adjusted the marinade a bit. there were too much pork not easy to chargrill & caramelise. i separated into 2 lots, but still too much, so the first about 800g lot not much chargrilled. looking at the vietnamese chargrilled pork collar in my recipe, you can see it was a lot more browned & intense c/w this batch. 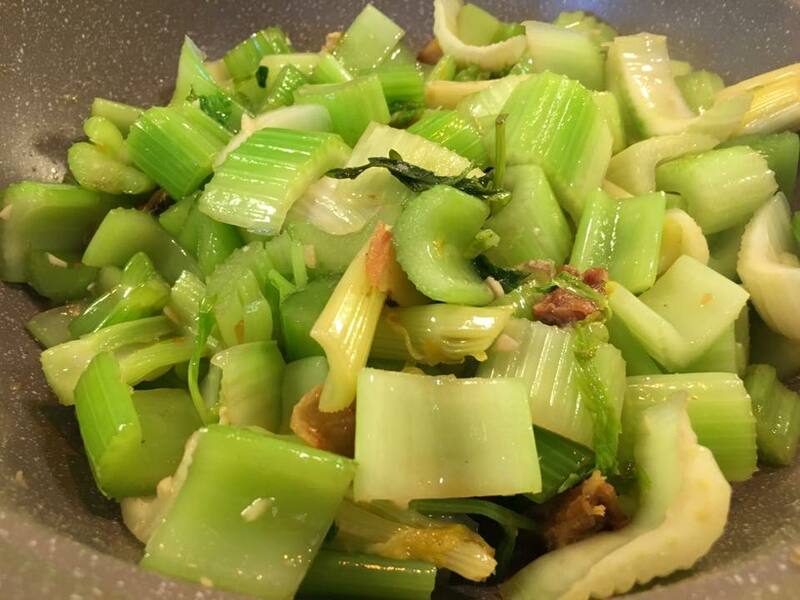 still i tasted both the pork & the celery. today, teban gardens arranged for a testimony by sam (top photo also). sam is afflicted with stage 4 cancer( that already metatasized & spreaded so he had multiple operations & also remove parts of the large intestines, stomach, bile), 2 heart attacks/4 stents & diabetes. he is currently on chemo but somehow doesn’t show. his father was上官流雲, a very famous singer, actor, composer in the 40s, 50s. it was inspiring listening to his story, the resilience of life, the love for life! 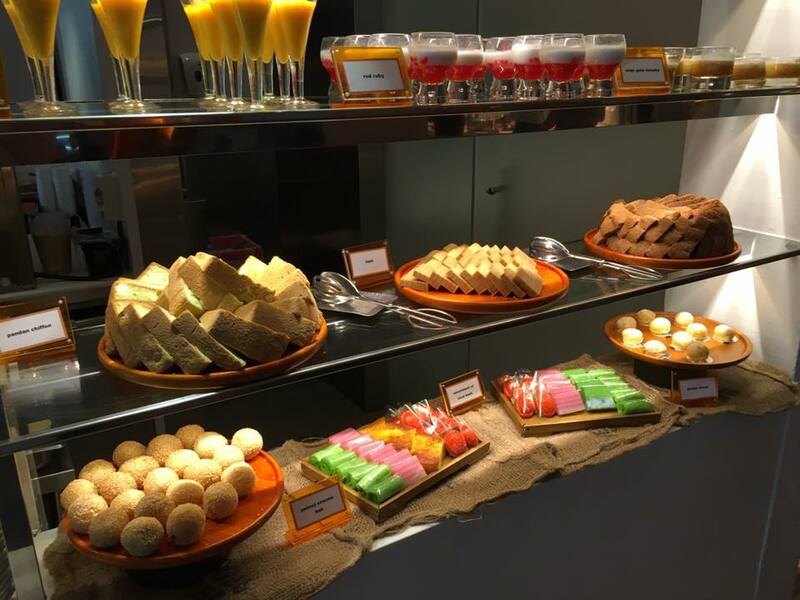 the line is a new inclusion in amex lovedining, so we have 50% discounts for 2pax for the S$62pax buffet lunch. this maybe the second time i came here. the first time probably like maybe 5yrs ago when there was also some 50% discounts. didn’t leave an impression then, didn’t leave an impression this time round too. the cold appetizer station quite limited oysters, mussels, clams, prawns. 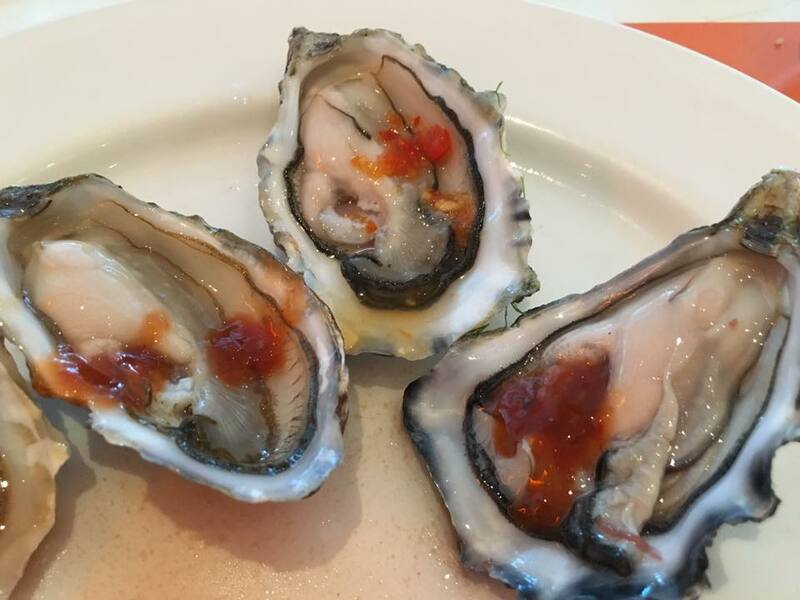 oysters freshly shucked, sweet, plump but left a bit metallic taste on the palate. prawns were good, like most buffets. 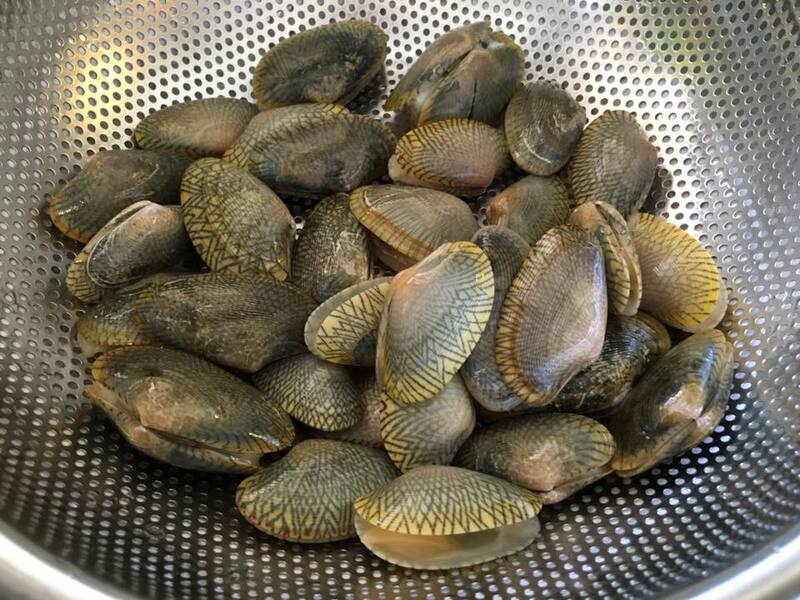 mussels, clams can do without. 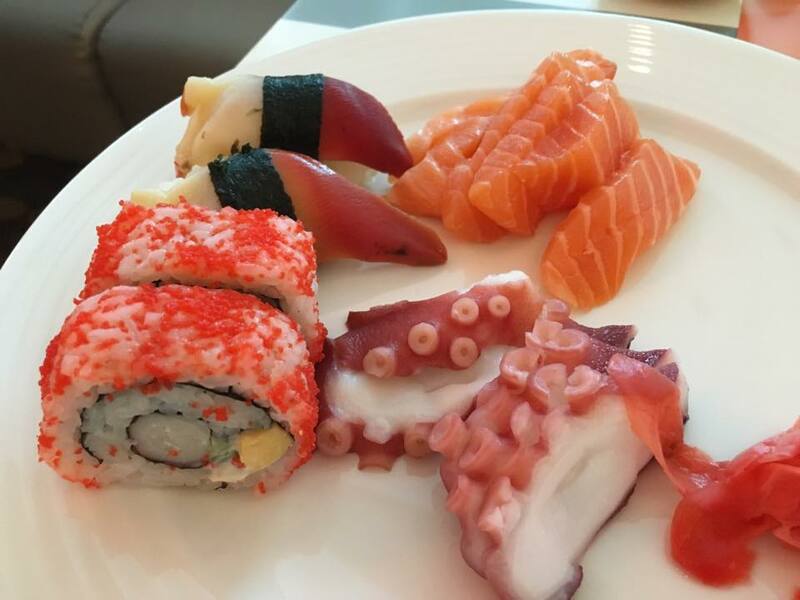 there’s only salmon, maguro (tuna) & tako (octopus) at the sashimi station. 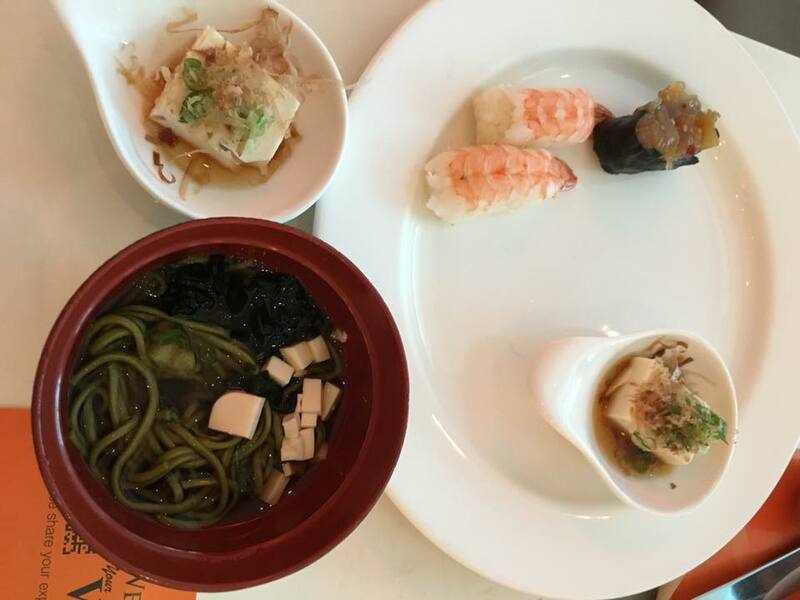 & sushi no attraction for me, so i just took the atlantic surf clam & the reverse maki, ignored the scallop entrails & seaweed, no unagi sushi. the salmon belly sashimi was very good though, very fresh, nice cut, sweet. 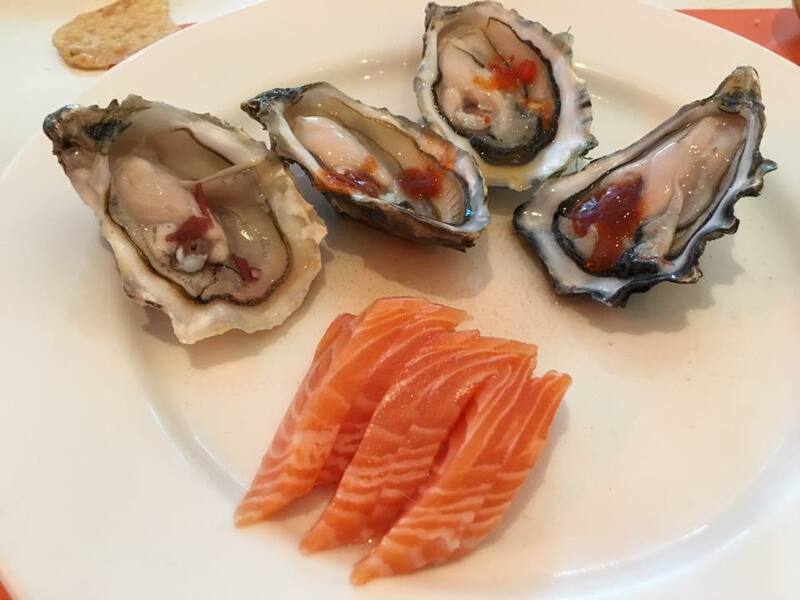 i had a second helping of oysters & salmon belly. ebi sushi no attraction for me. adegashi tofu mediocre, cha soba poor. the roasted lamb was tender & moist, should be quite good, but i forgot to get sauce & did not bother to go back for it, so taste quite bland. baked salmon quite ok. took just tiny bits to try. 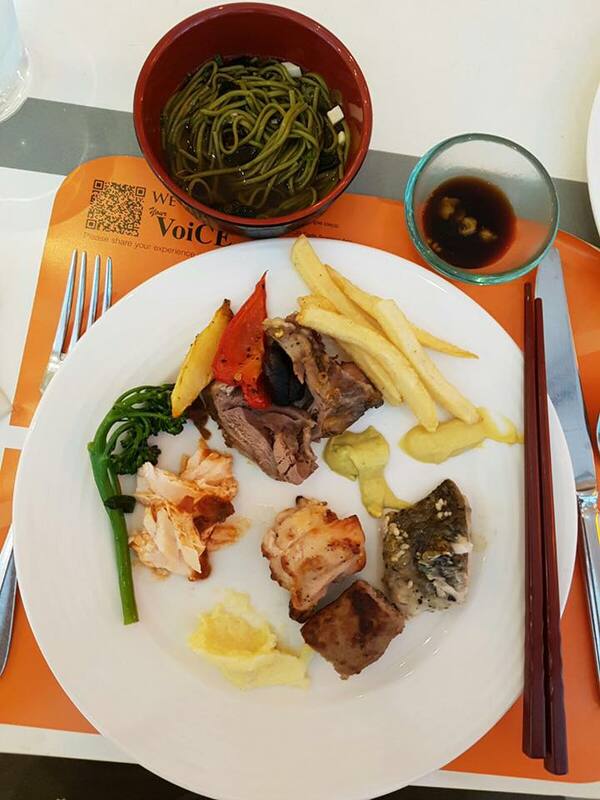 the grilled vegetables were good, reminded me of pontini eons ago. 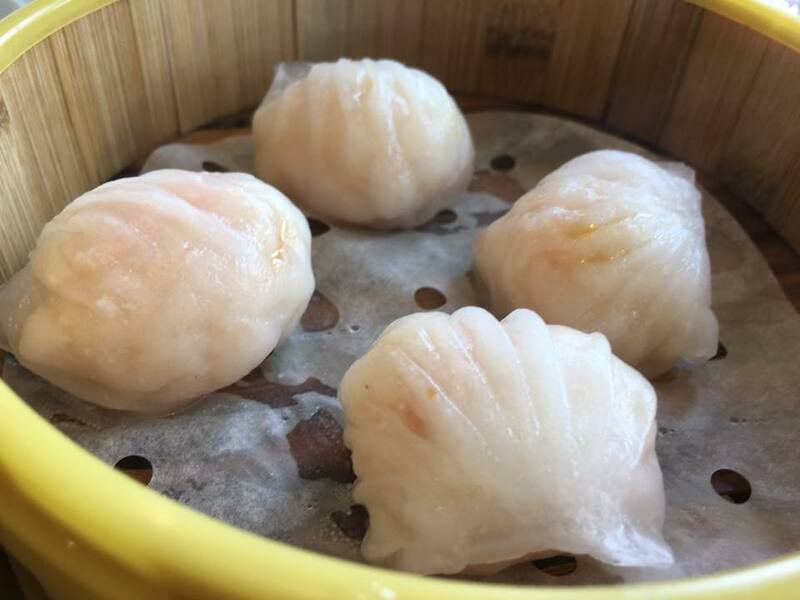 my friend took the siew mai. i tried abit. it was good. 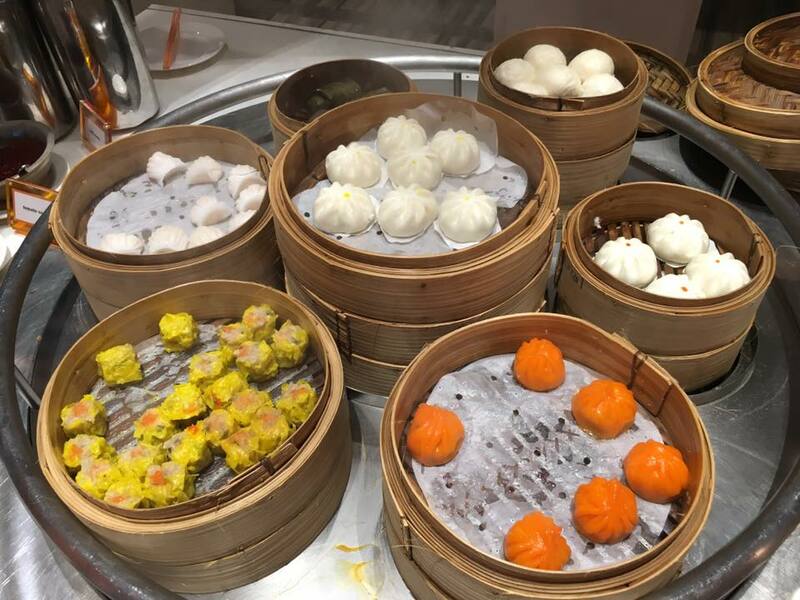 i took the orange skin dumpling. this was quite poor not worth trying, skin was thick & fillings were not tasty. satay was good. 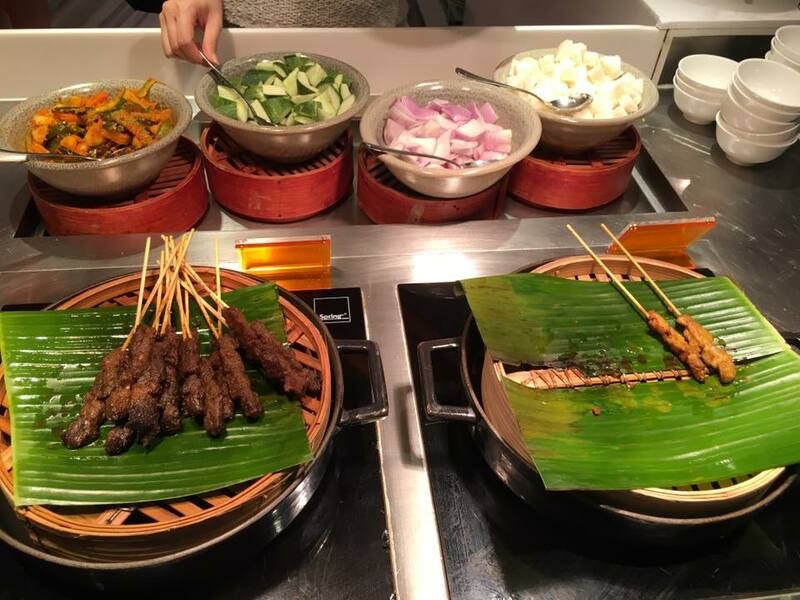 i took only 1 chicken satay. 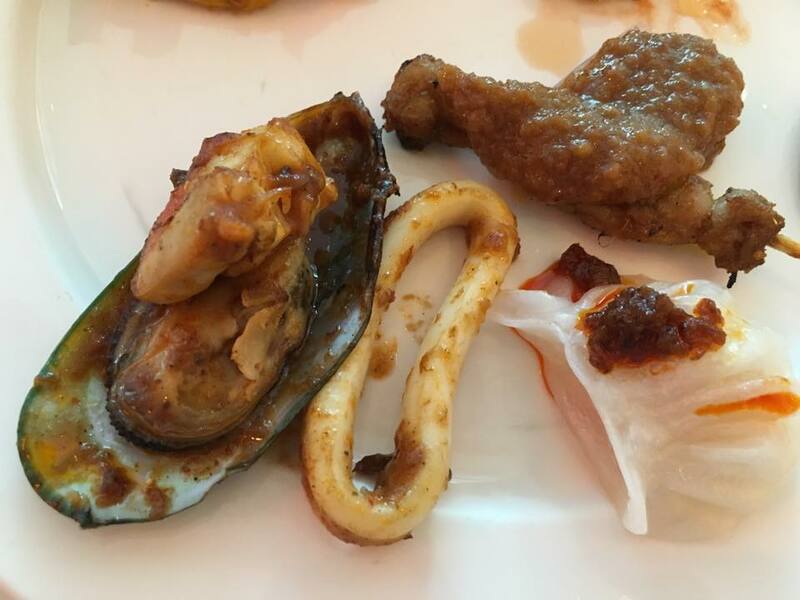 tried the sambal seafood items. 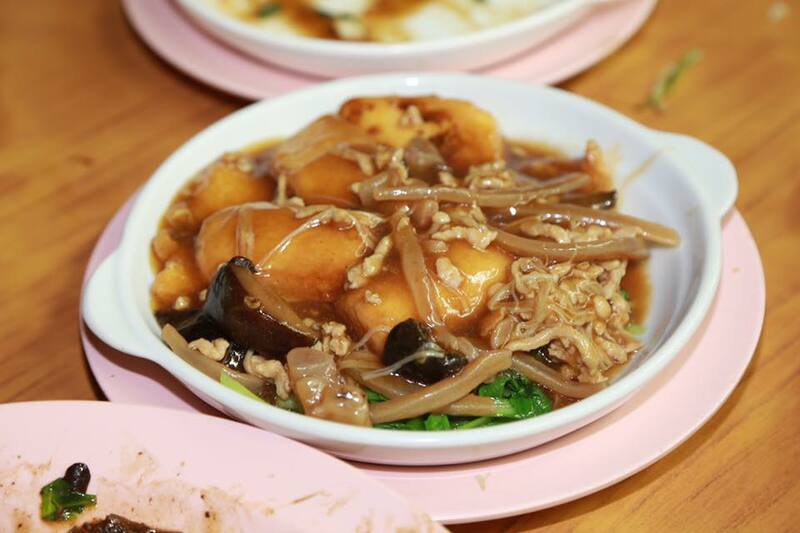 good tasty if robust dish. a competent dish quite ok if no other food. indian station probably the best food. 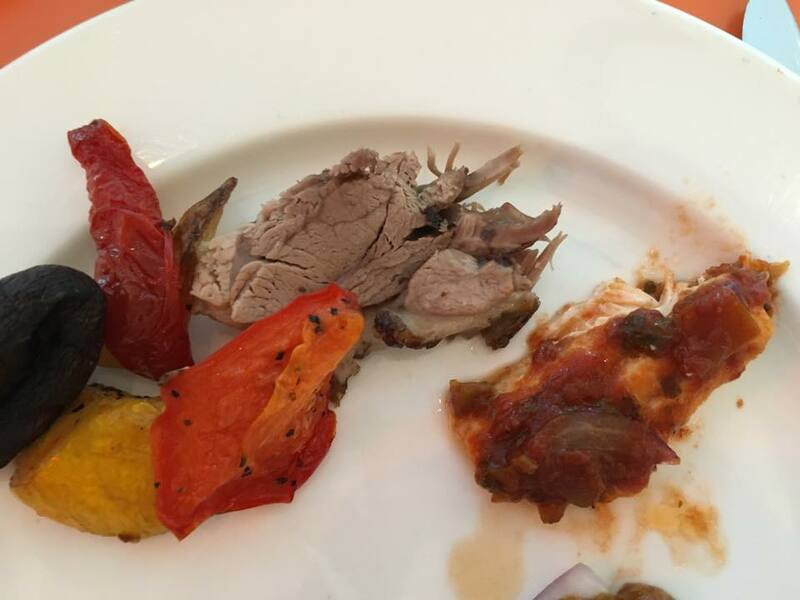 lamb was especially good. 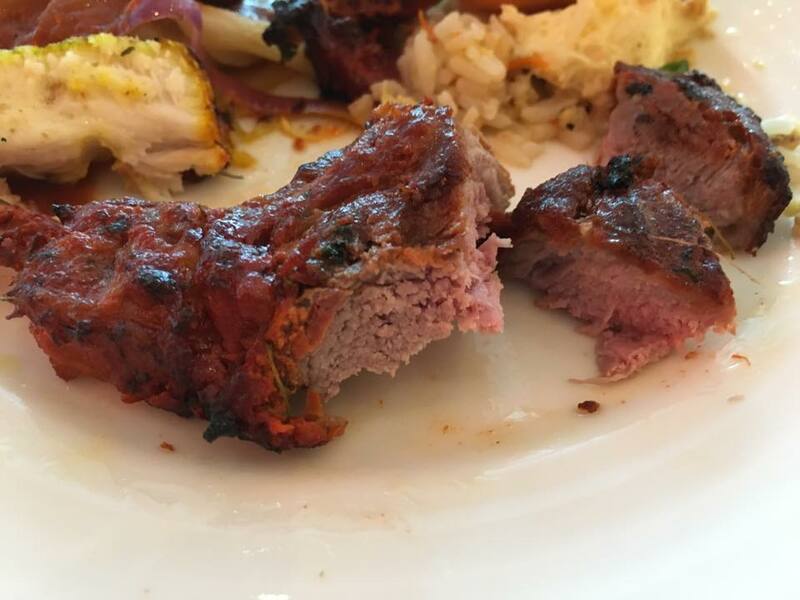 very well marinated & properly chargrilled, very flavourful. i took a bit of paneer (cottage cheese), always good, a prata with dahl & chicken curry. 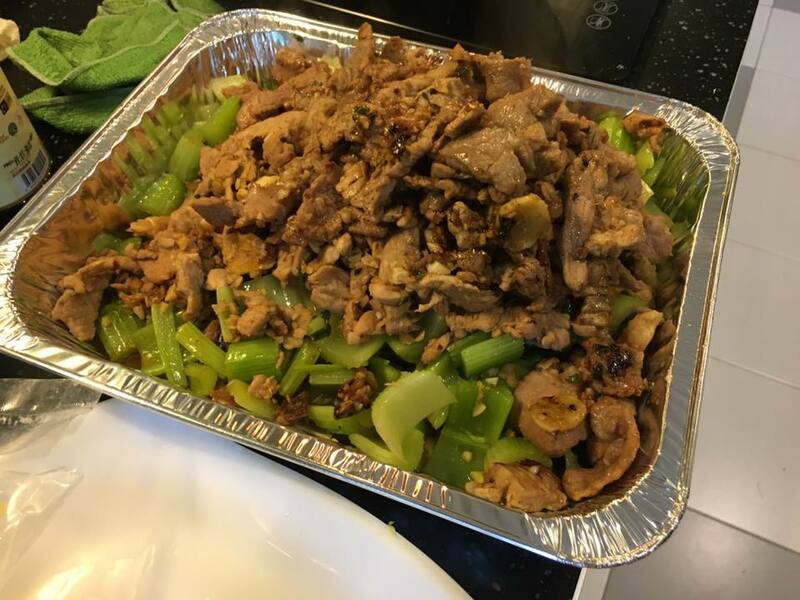 and so no comparison with (a) canton paradise, (b) house of roasted duck or (c) tunglok signature etc…. 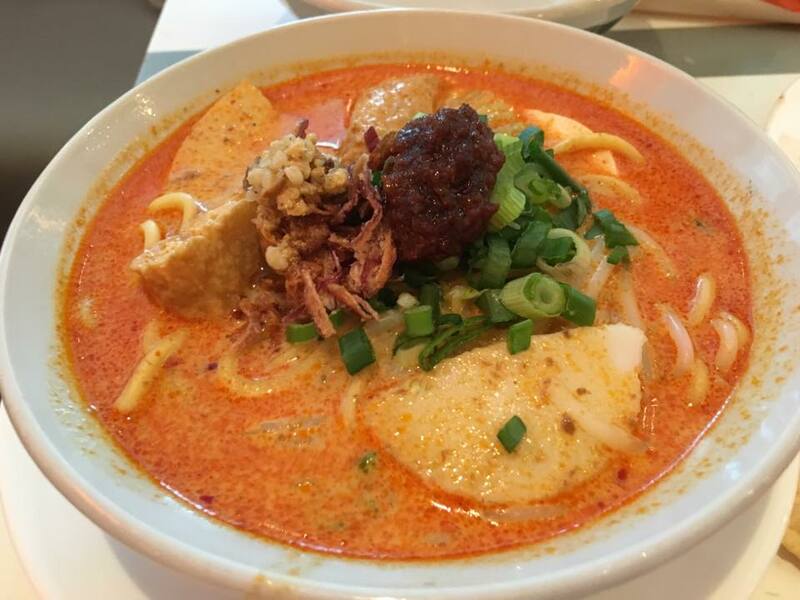 laksa also poor. & too sweet. prima laksa sauce standard or poorer. skin was good, thin, firm, not broken up. good chilli, nice wrapping & cutting (inconsistent, some i saw were quite poor). 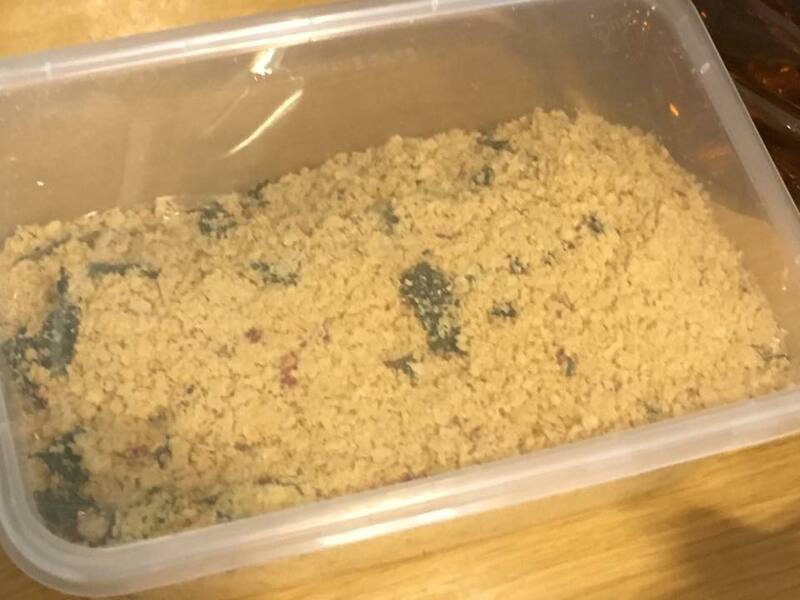 the trick is to ask for smaller amount of ingredients. then it will be manageable, neat & tidy. cheese was ok not fantastic. 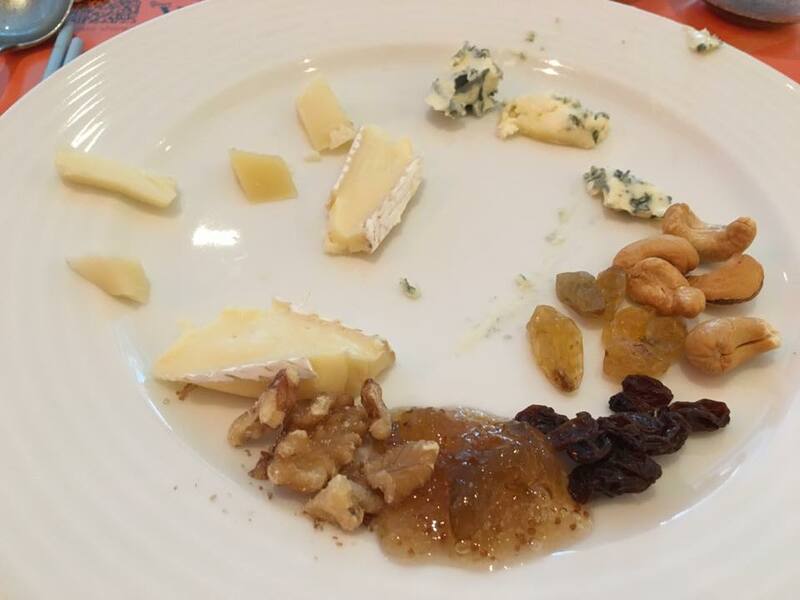 i had the brie, english blue stilton, nuts, jam/compotes, dried fruits. small amounts. 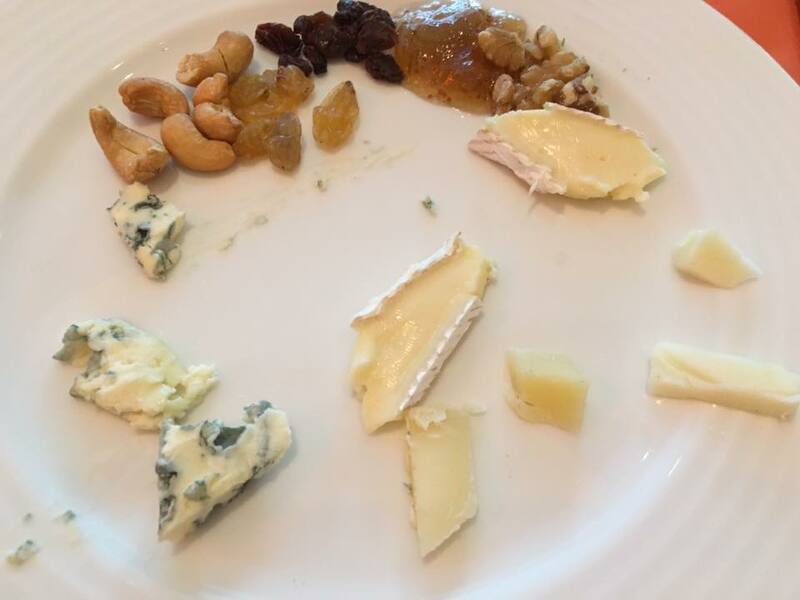 i like cheese, this nothing too great but i enjoyed it nonetheless. 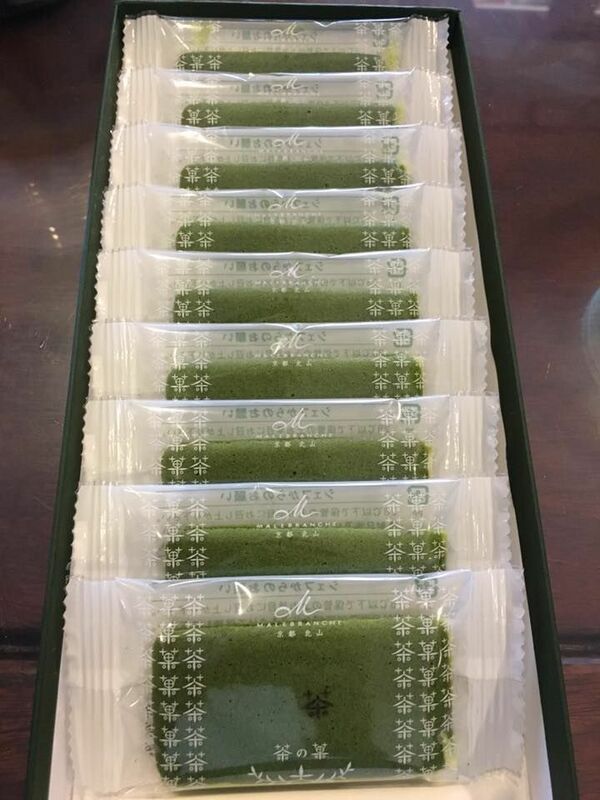 i took only the lapis sagu. ignore the cakes. my friend took the chocolate mousse. i tried a bit it was good. 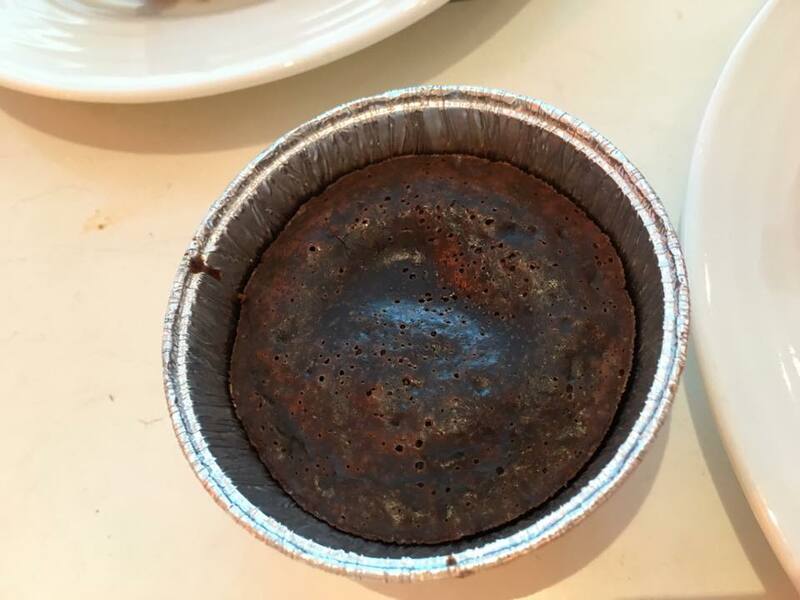 & i had to try the choc lava cake. very ordinary, nothing to look at, good chocolate taste, no much lava so not that exciting. soft yogurt ice cream ok, not my favourite. 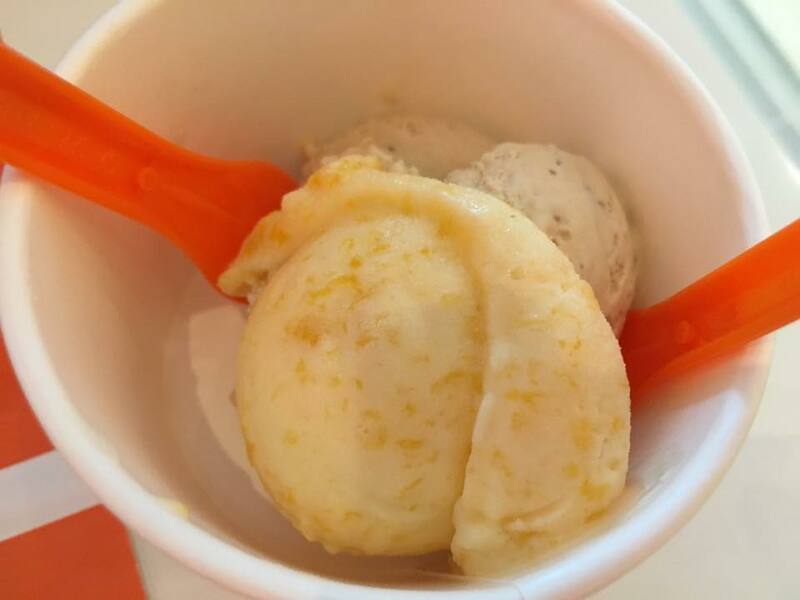 we had 3 flavours ofice cream, mango sherbert, sallted caramel (the best!!) & a pecan one. 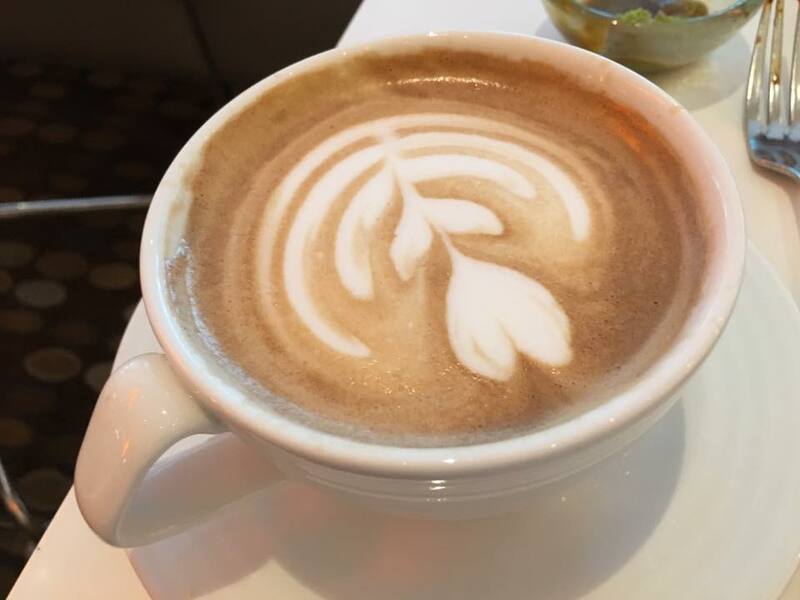 & rounded off with a nice creamy cappuccino. 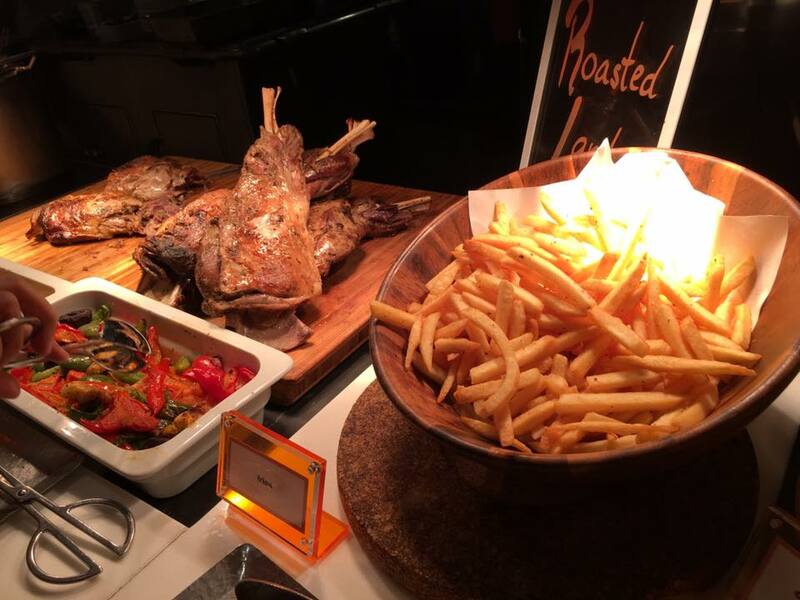 overall for me the buffet was quite mediocre, nothing that attracts me. likely even at 50% discounts=S$31++pax, i still would not be interested to come back. i guess that applies to most buffets for me. i used to quite like equinox. 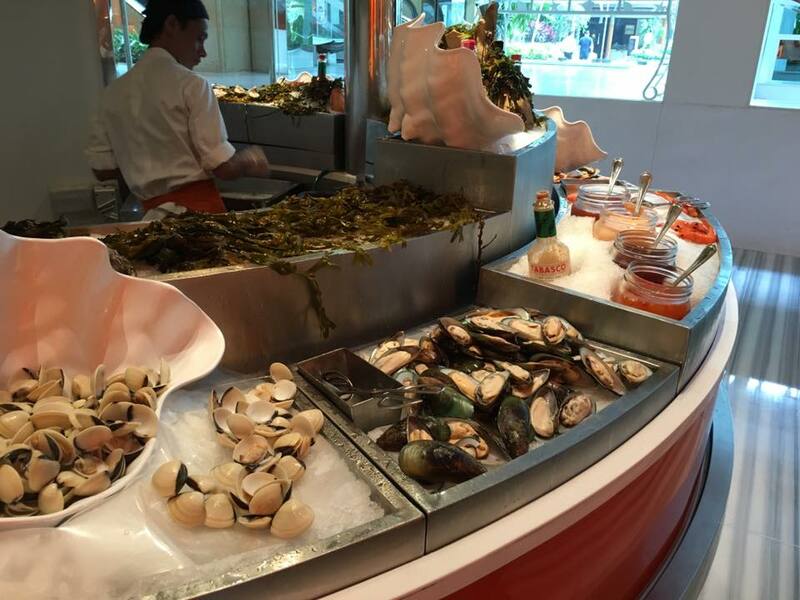 but now the buffet like reduced 1/2 in size at the same price (S$59pax 50% discounts for 2pax). 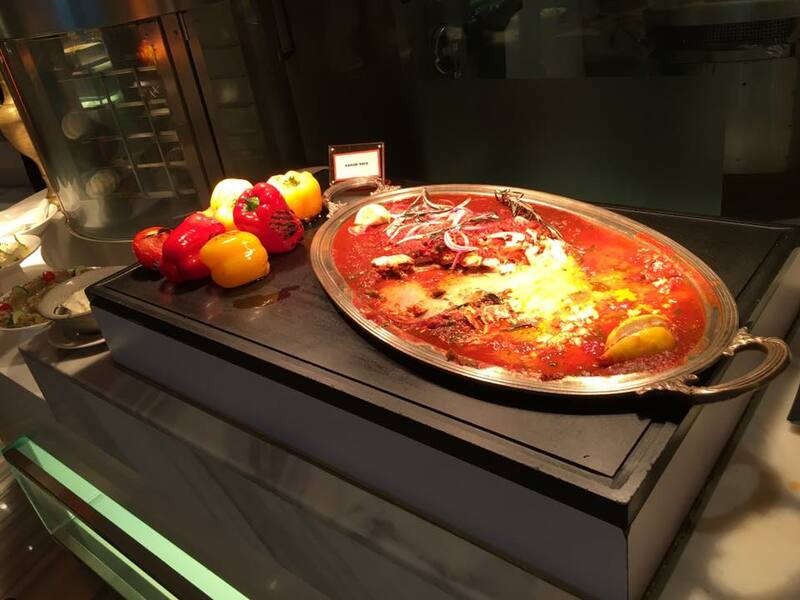 the only attraction for equinox is it is a semi-buffet, meaning you order a fine dining main course dish. 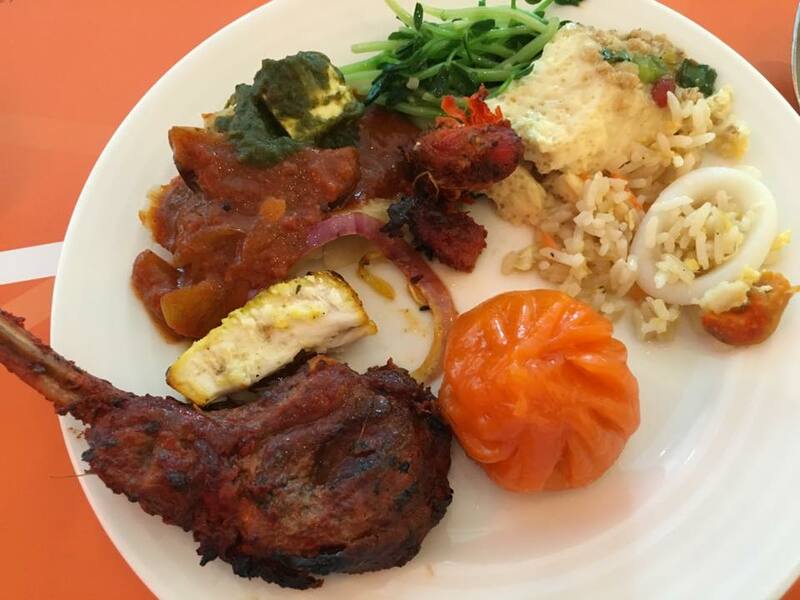 here at the same, there is hardly any good standard main course except the indian station. the point, 2 of us were saying, is that it is not that the standard of dishes here are poor, but they are mostly mediocre. 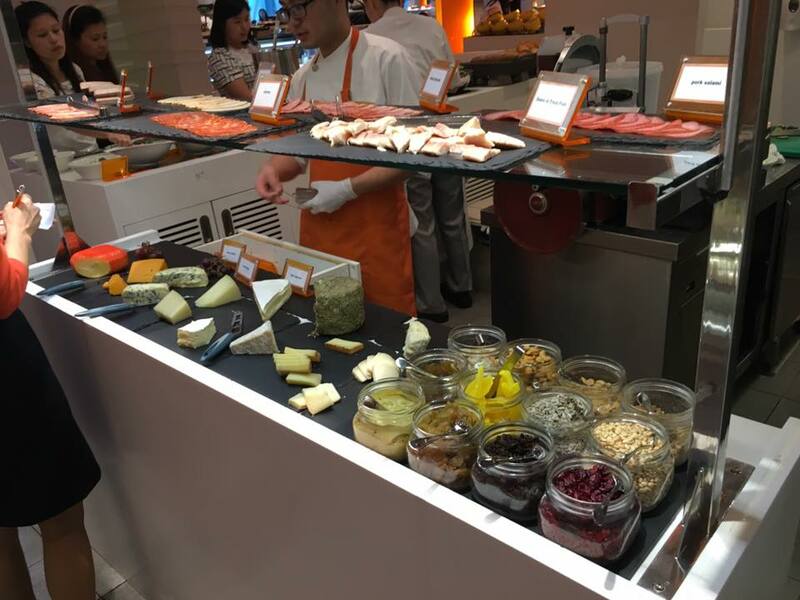 so if i rather go to eat good/top quality sashimi or pasta or roast duck or laksa or western main courses in small amount than to eat a lot of mediocre food here, & some poor ones like the roast duck & laksa. not sure i would come back at all. 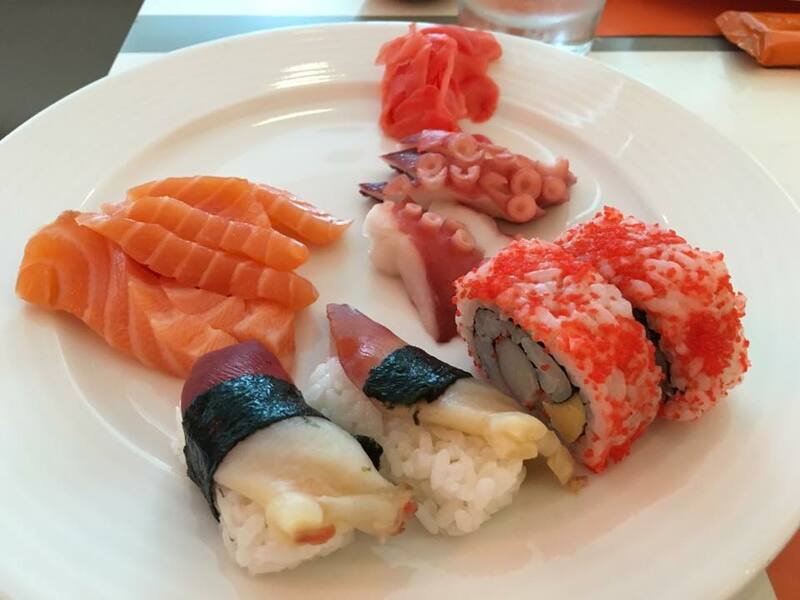 if i do i will just do a bit oyster, sashimi, indian food, a bit dimsum, cheese & enjoyed the few i like. we had a lot less RI G20 makans this year. 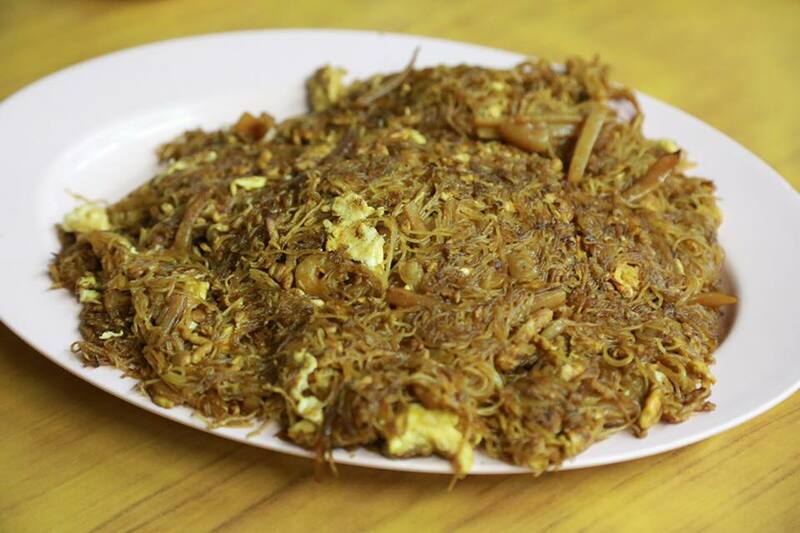 recently michelin released a list of bob gourmand eateries in singapore & JB Ah Meng is one. great! i have been wanting to try this place since lately my OPS friends have been introducing me to 三楼米粉. a vegetarian friend joined us later after dinner. he always made an effort to join us after our makan if he can. 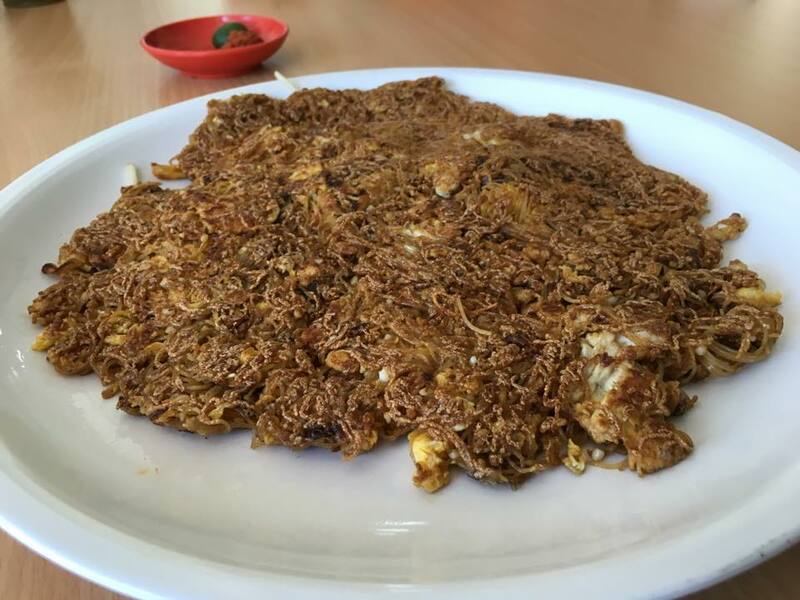 JB Ah Meng is located between lor 23 & aljunied road. i turned around couple times but unable to get street parking, so parked at KH Plaza along aljunied road. 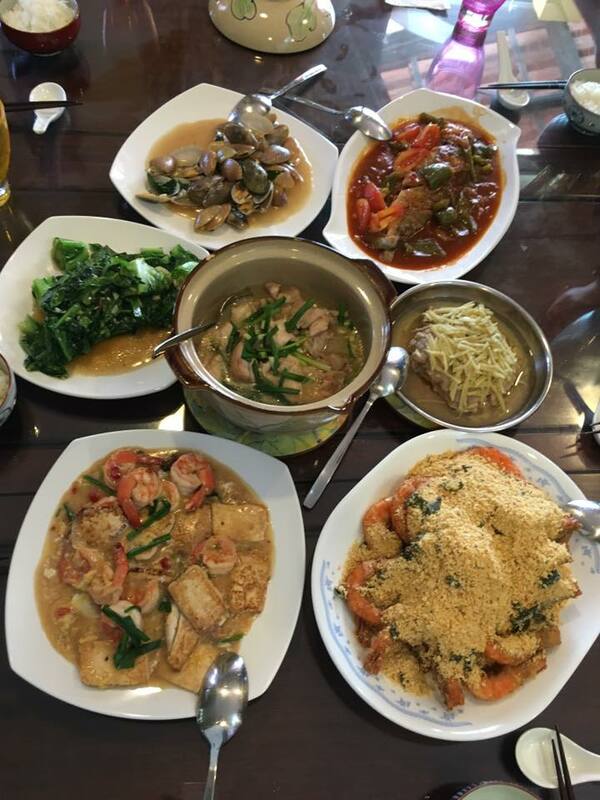 i was a bit cautious, ordered only 8 dishes & medium serving. 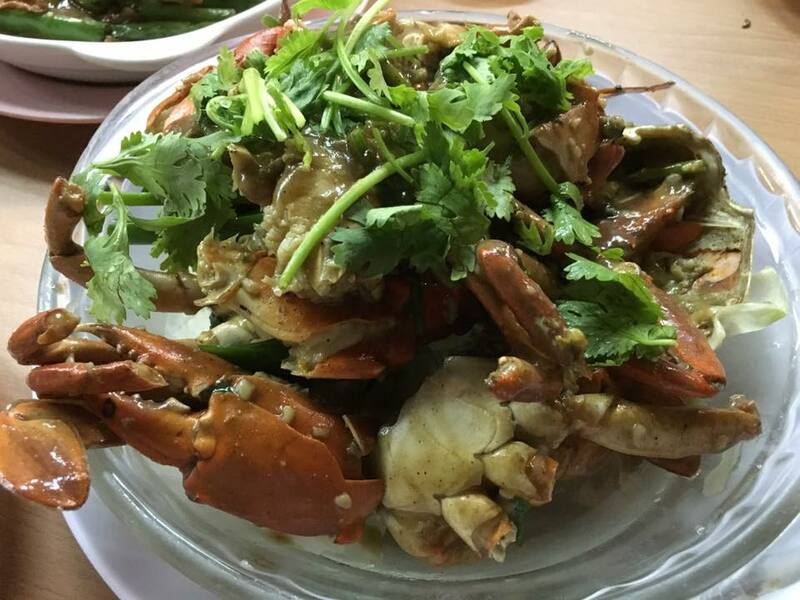 white pepper crabs was done well, sweet, tasty. crabs were ok not super. the signature 三楼米粉 was excellent! 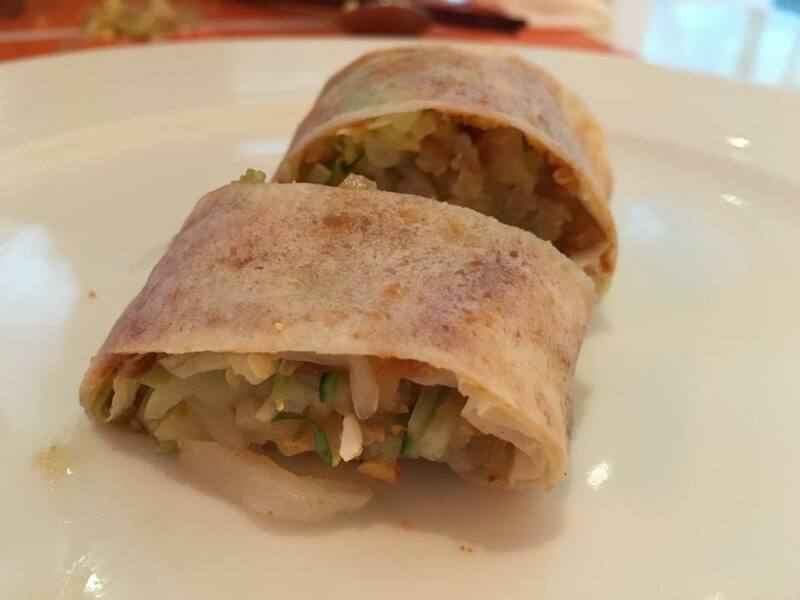 it was not the most crispy version but it was tasty, moist, flavourful, a wonderful dish. the potato dish recommended by a few reviewers was good. & in fact most of the dishes were done well & tasty even though not much special. 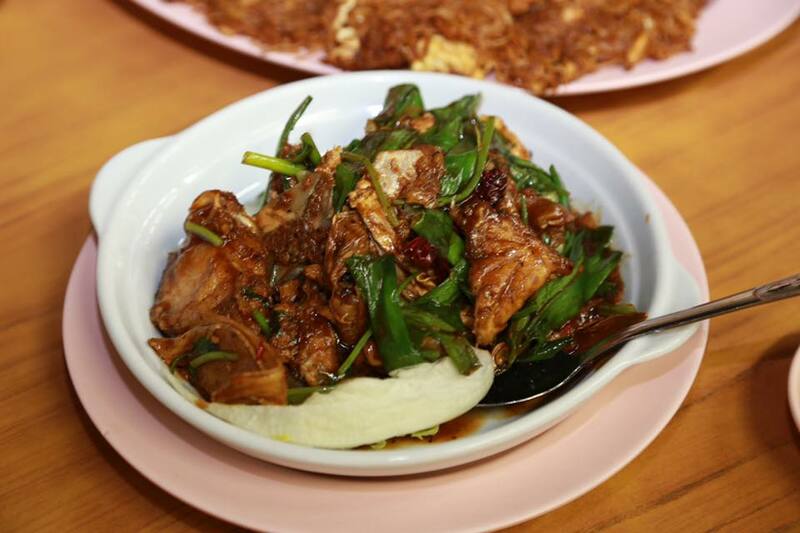 kampung chicken also good taste. serving small, bony & not that much meat. 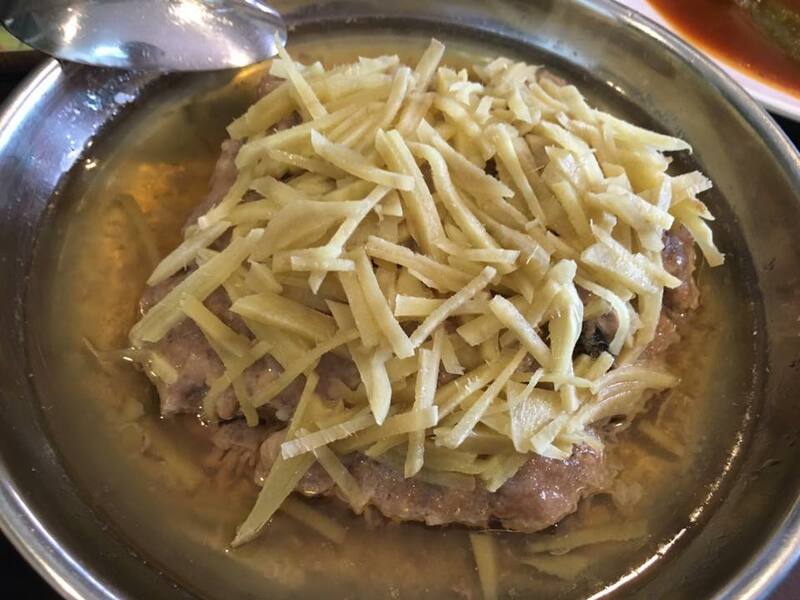 金香鱼头 also small serving & mostly bones. quite ex for me at S$24. 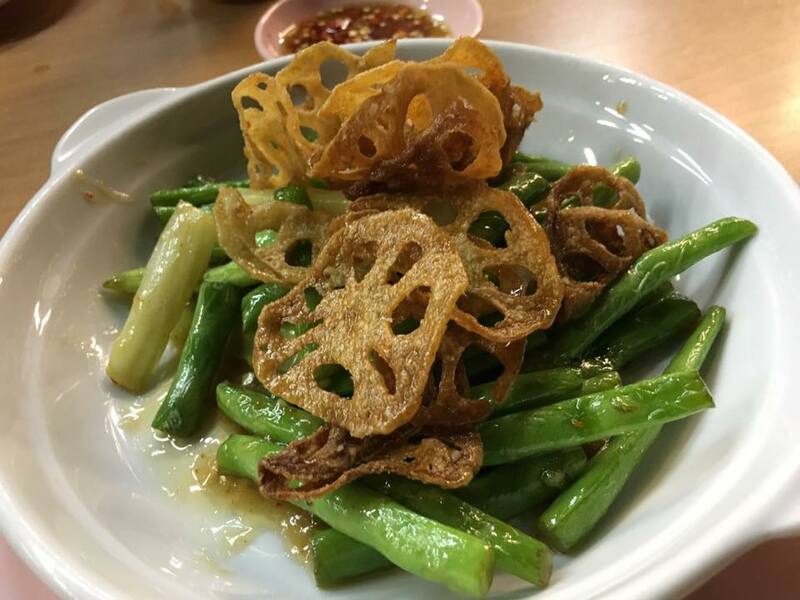 crispy caramelised lotus roots good too! 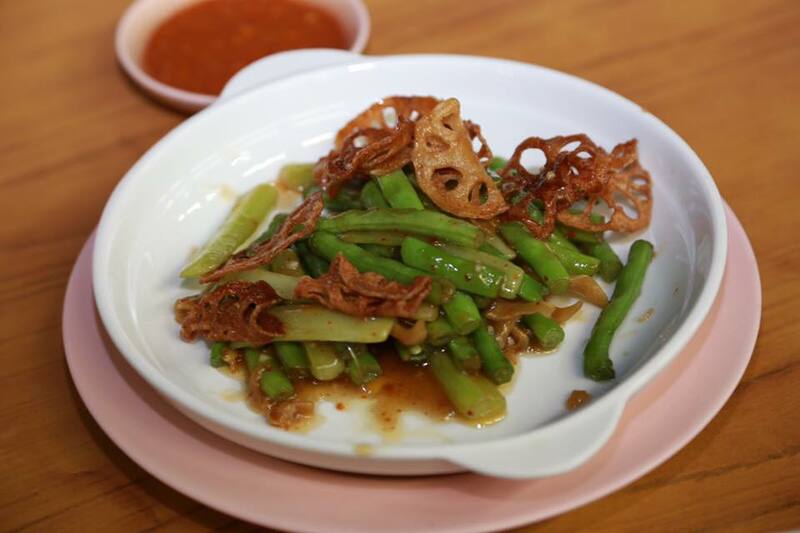 accompanied by snake beans, crunchy & fresh. 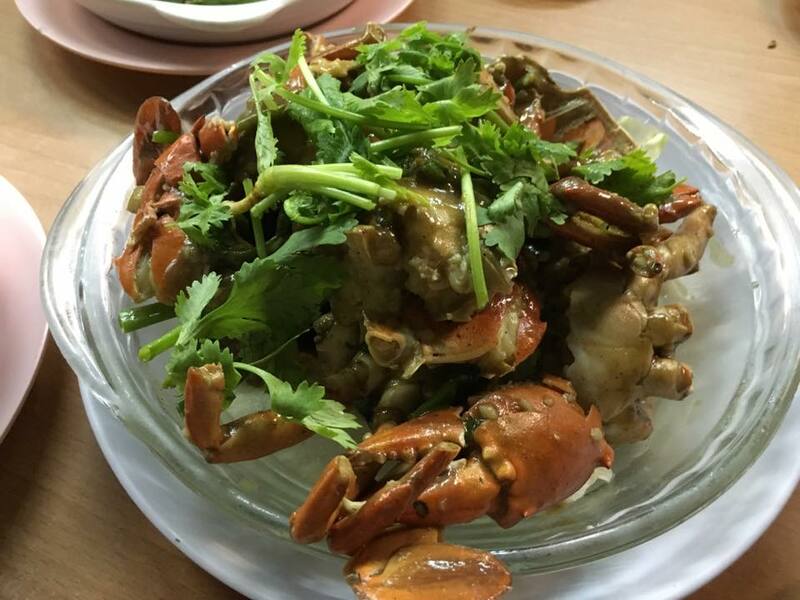 quite a good dish, not so common & nice to try. 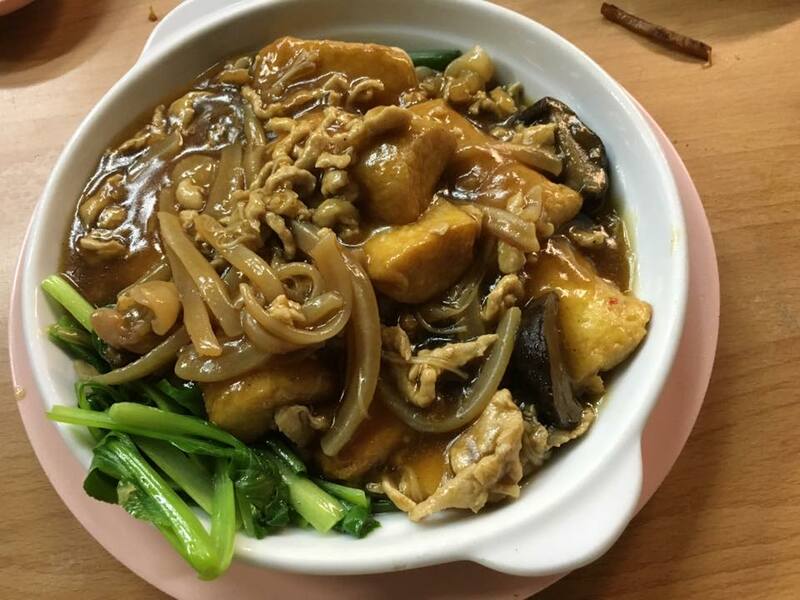 3 mushrooms beancurd was quite ordinary. for me the poorest of the dishes. 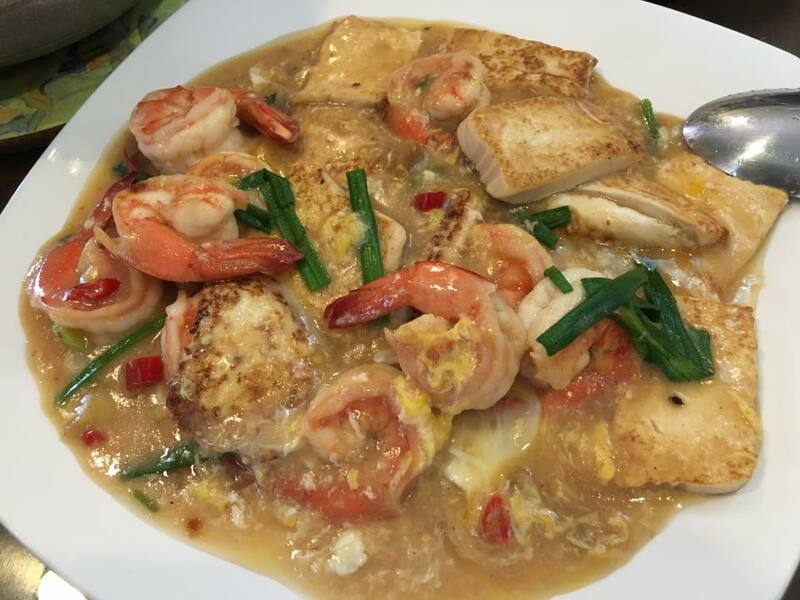 or the tofu prawn dish at sik bao sin. (both are also bib gourmand eateries now). 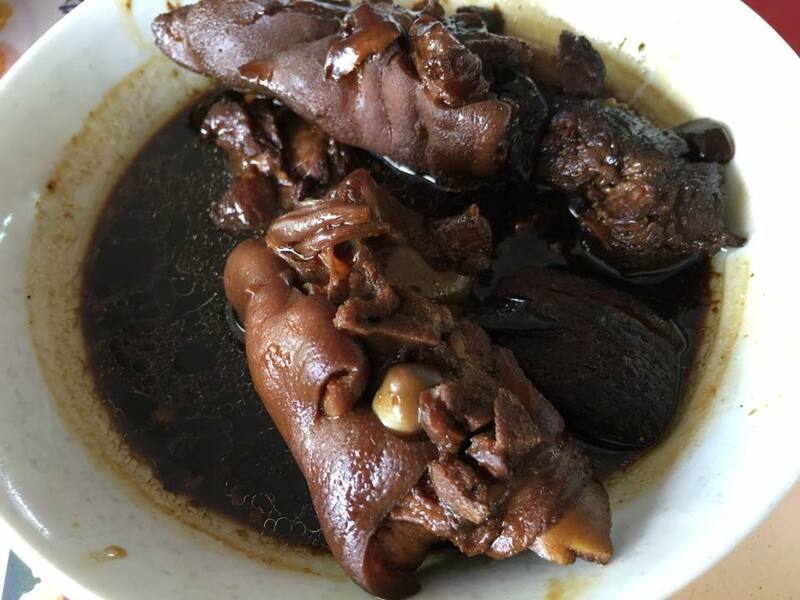 a friend wanted the 青龙菜. it was good, like chives & tender. & good wok hae! 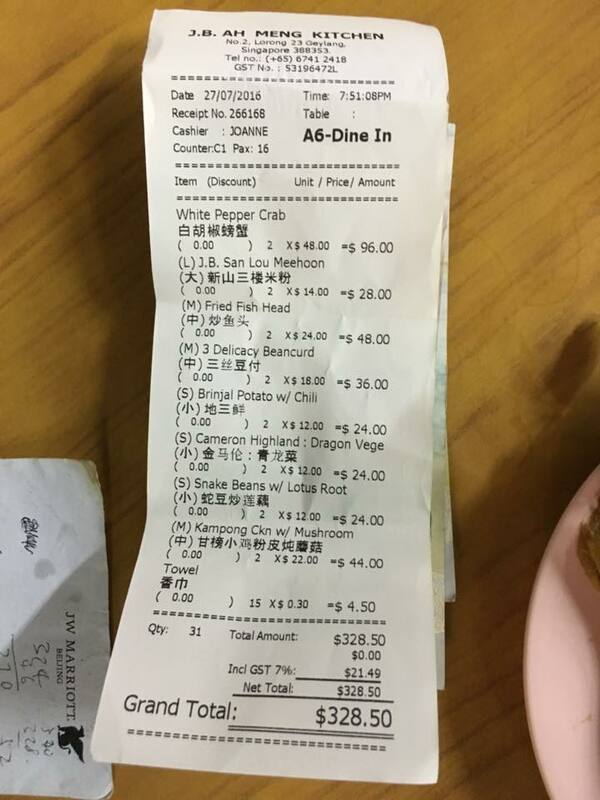 so done quite well la..
dinner was S$328 for 16pac which was just like S$20.50pax nett so overall price was ok.
if i had ordered a bit more dishes of larger dishes, probably say S$30pax, not really like cheap for zi char but quite ok la i guess. we were seated 8pax on 2 tables. nice food & good time together with friends. 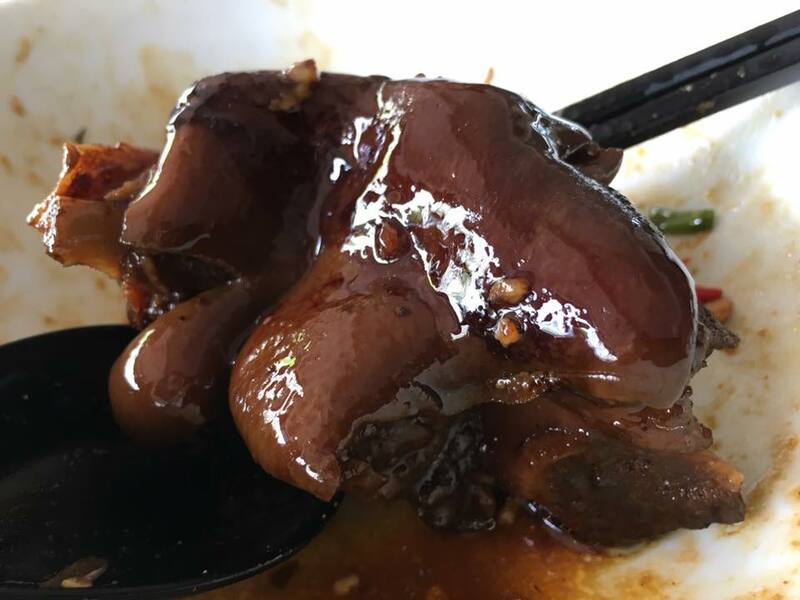 so we had a 5pax family lunch outing at holland drive food centre this morning on 25.9.2016.
we shared what i thought was expensive not great kueh chap & braised duck at cheng heng. & daughter ordered 2 bowls of ytf at hakka noodles. 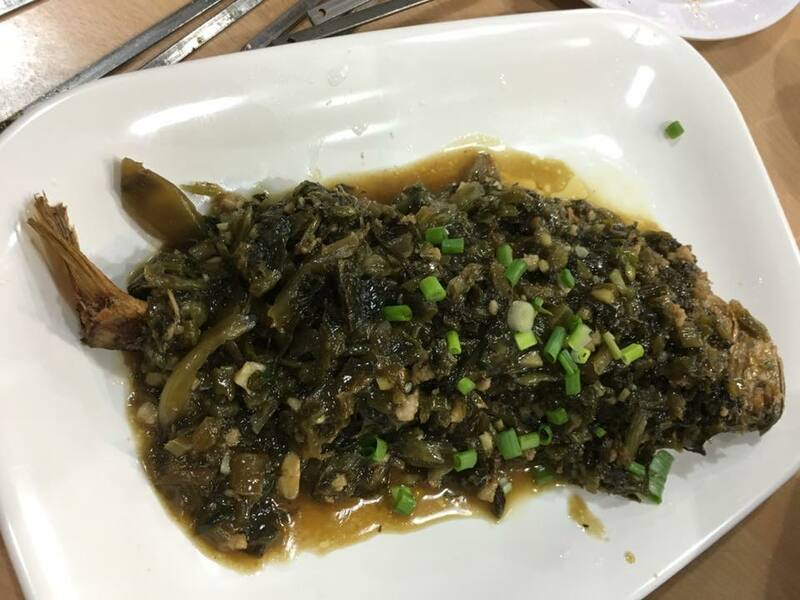 name is hakka but it felt more like hock chew? 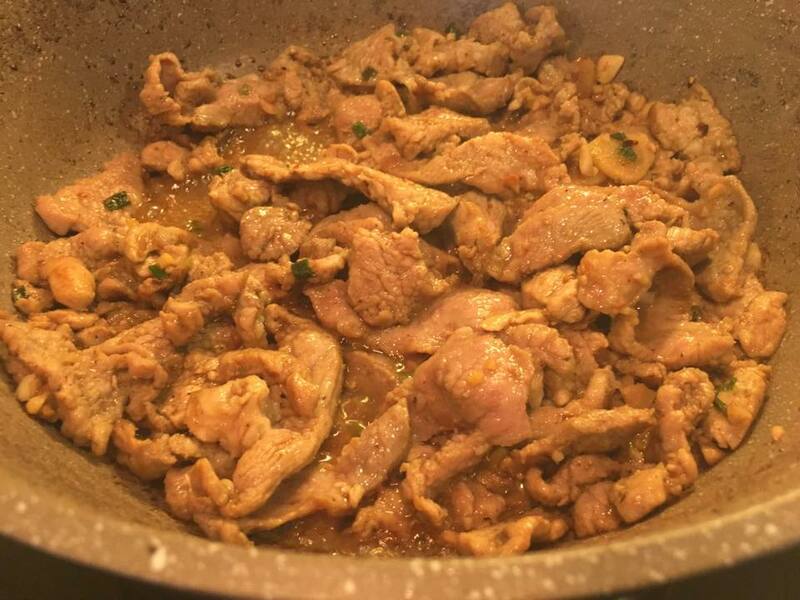 the 釀 meat fillings were pork & not fish meat?? wife & daughter didn’t like it much. soup was ok. ytf was non-descript. we left about 4 pieces uneaten. i did not mind the noodles & chilli with some ikan bilis. but far from anything worth eating la. 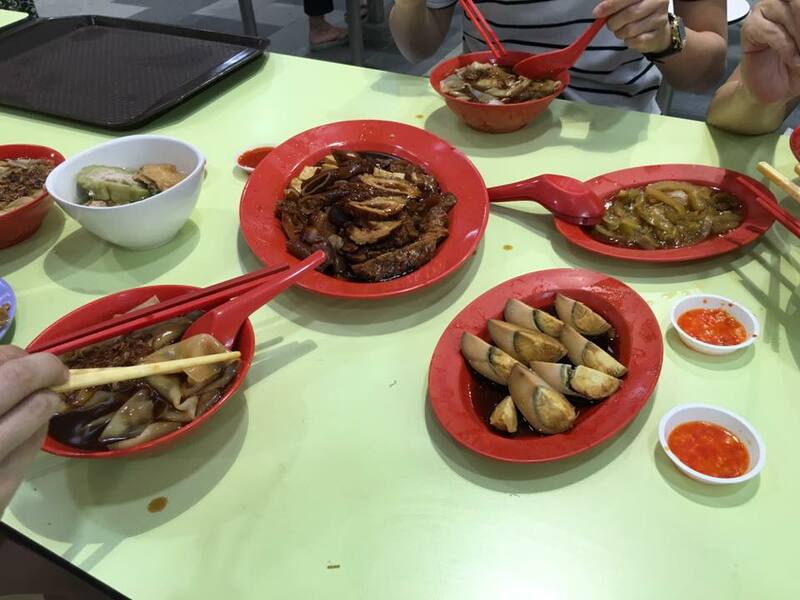 today we shared some duck & kueh chap. 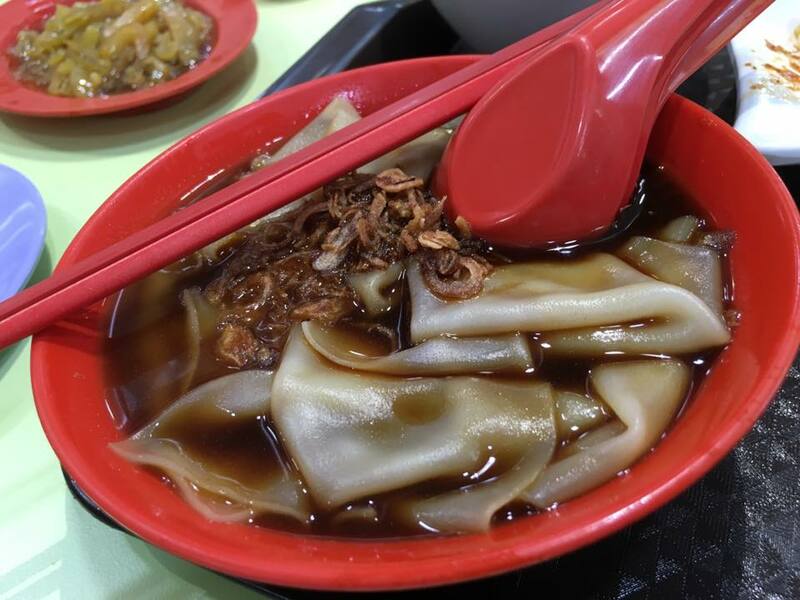 and daughter ordered 2 yong tau foo from hakka noodles. 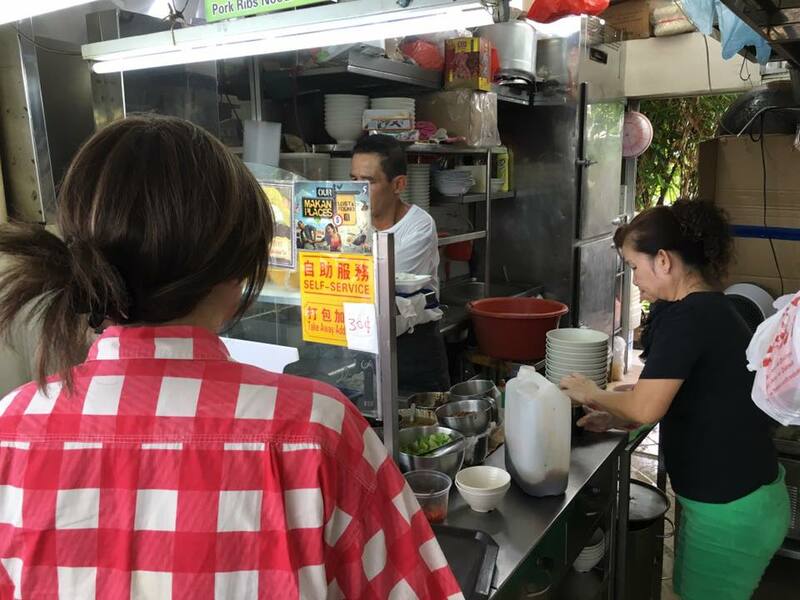 cheng heng kueh chap is a popular stall here. i wonder why after trying the food? but there’s always a reason. so i guess most people actually like the food. & in the end things are relative, just a matter of comparison. the kueh was ok, soft. the gravy/sauce though not so tasty. 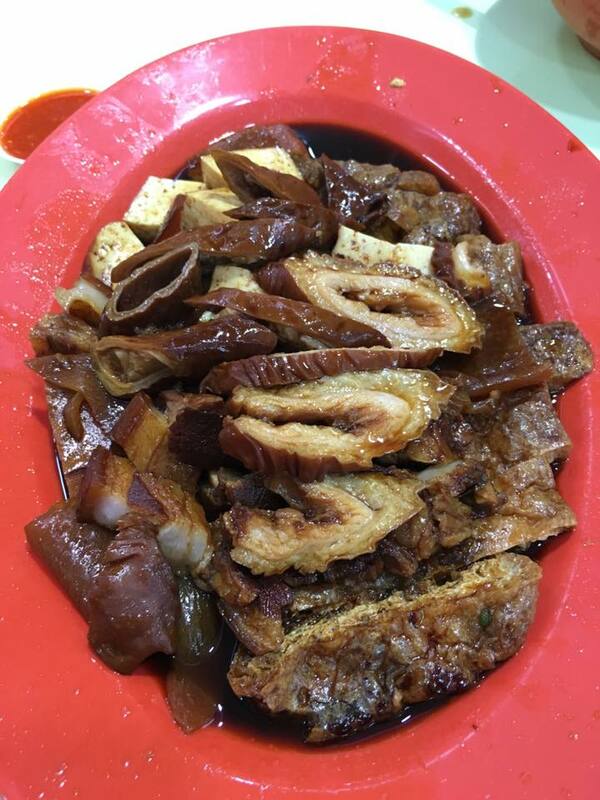 the intestines & pig skin were good, texture & taste, tau kua also good, taupok so so not soft enough not well infused yet, kong bak too fatty. 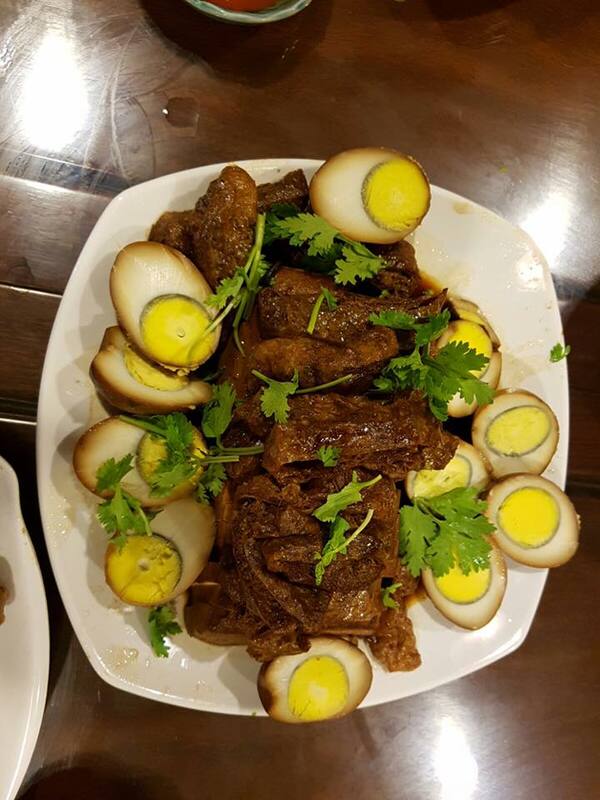 lor nerng (braised egg) was good. chai buay was not. not tasty like those teochew muay ones. the duck was the poorest of the lot. duck not “pang” (flavourful) at all, meat too soft.. i forgot to take photo as it came last. 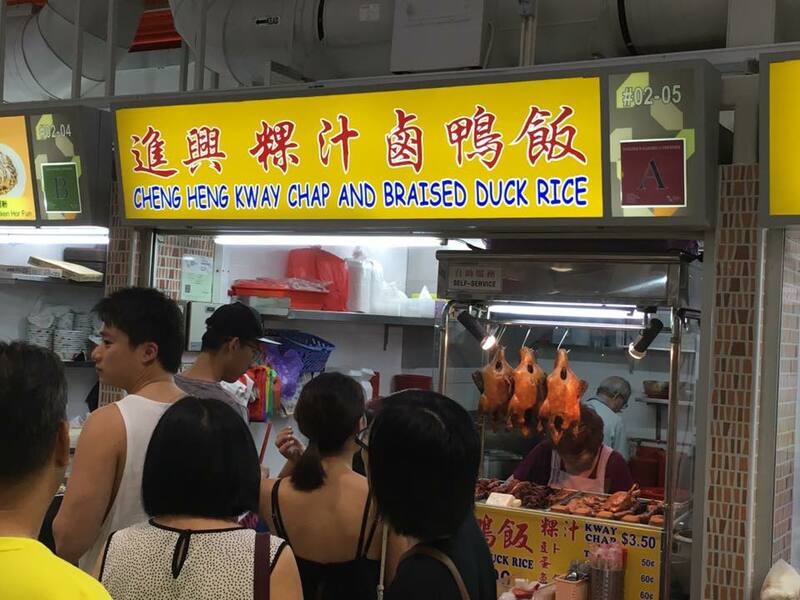 (cheng heng’s duck was like less than 1/2 the serving of happy duck’s 1/2 duck for S$18 in the photo below). 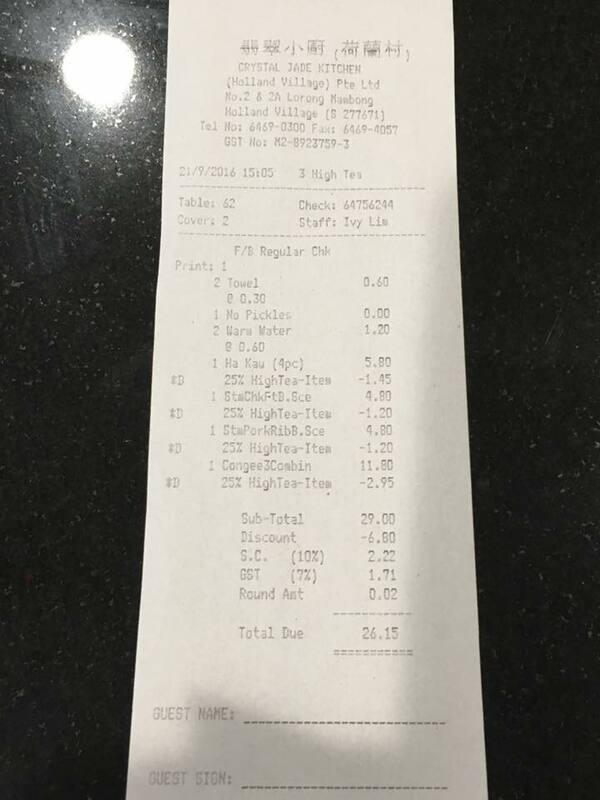 & it was S$26 for very little food. so as i said everything just a matter of comparison. 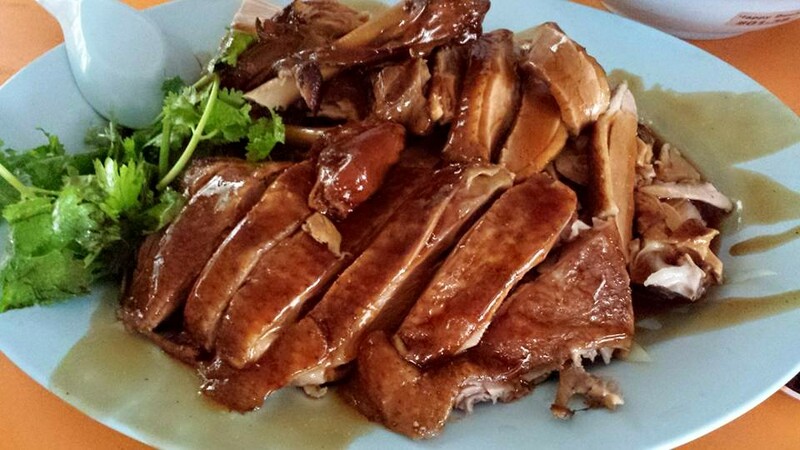 c/w the S$30 duck & kueh chap lunch for 5pax guys i had at happy duck bukit merah view food centre on 16.6.2015? for me, actually simply no comparison la..how to compare??? 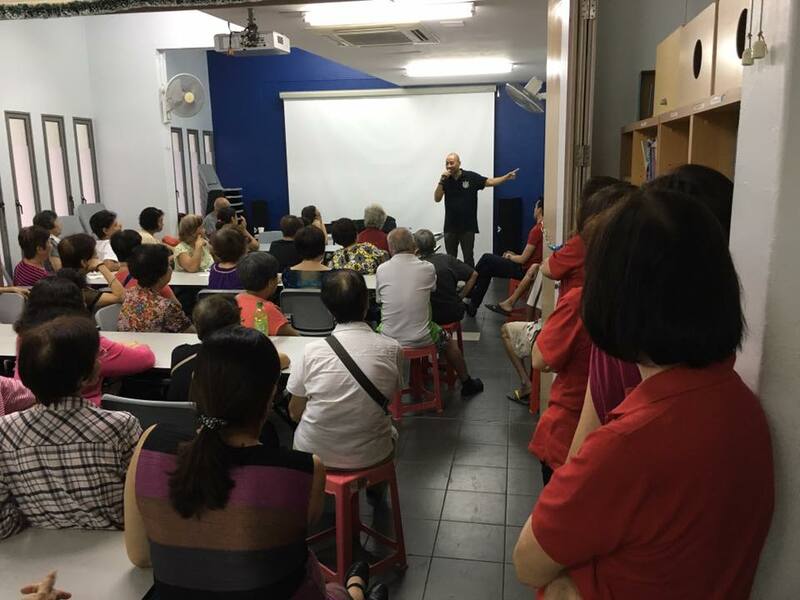 & if it was just a matter if taste & not price, then my own lor arh would be just a lot better lor..
many of our good friends are away “reprising” the silk road journey to the west. 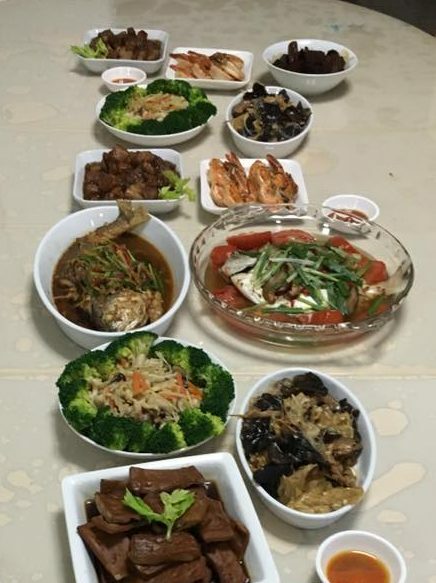 so this was an eat together for the folks left behind, lol! 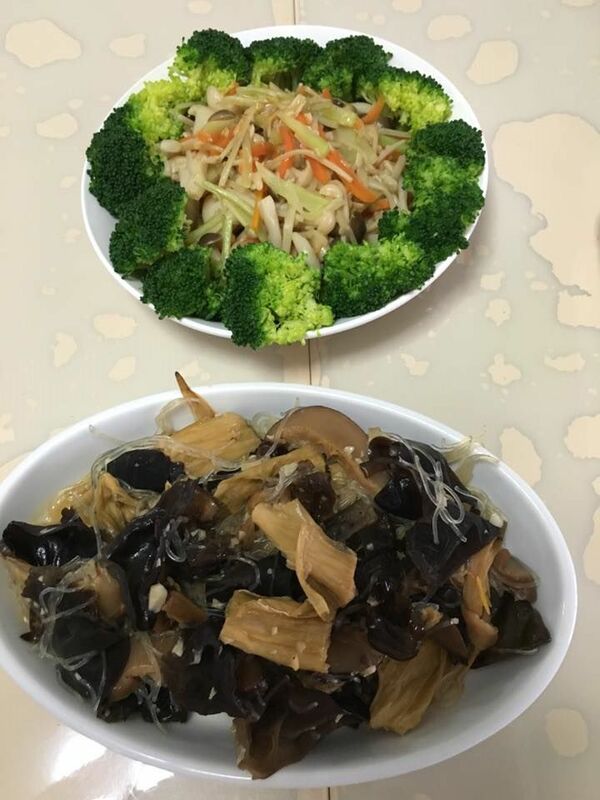 i made 6 dishes + simple cheng chow dessert. 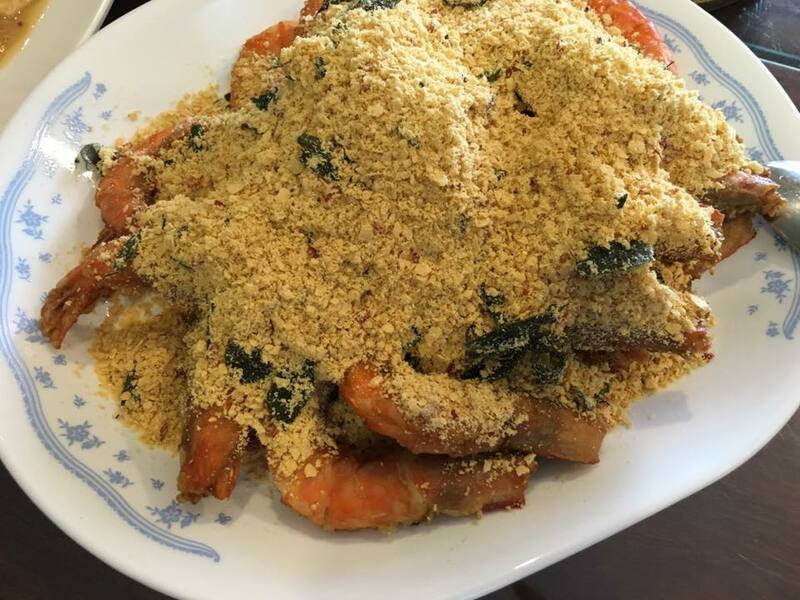 excellent cereal prawns this, as good as the good zi char restaurants outside. 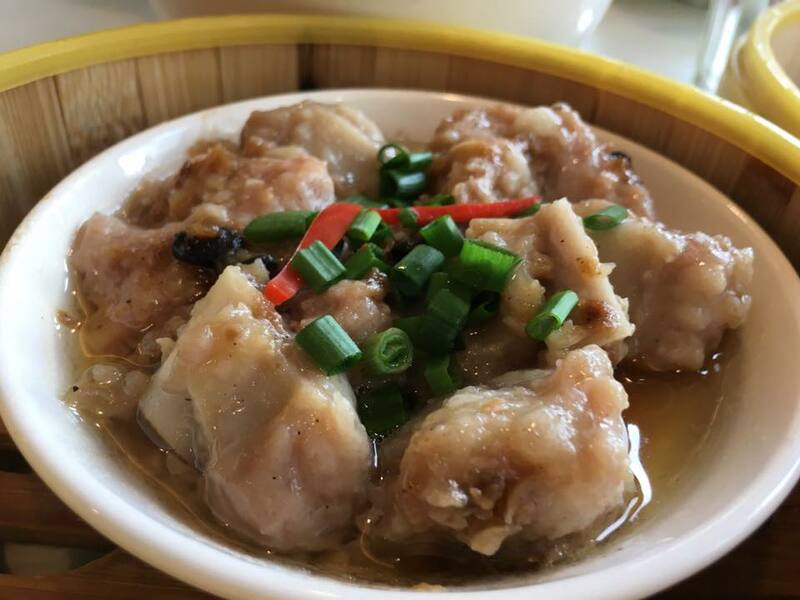 this guy CTHD (crouching tiger hidden dragon), his roast pork also very good…so roast pork & cereal prawn dishes, i no need to learn…see the sio bak dish at our teochew muay lunch on 28.10.2015! 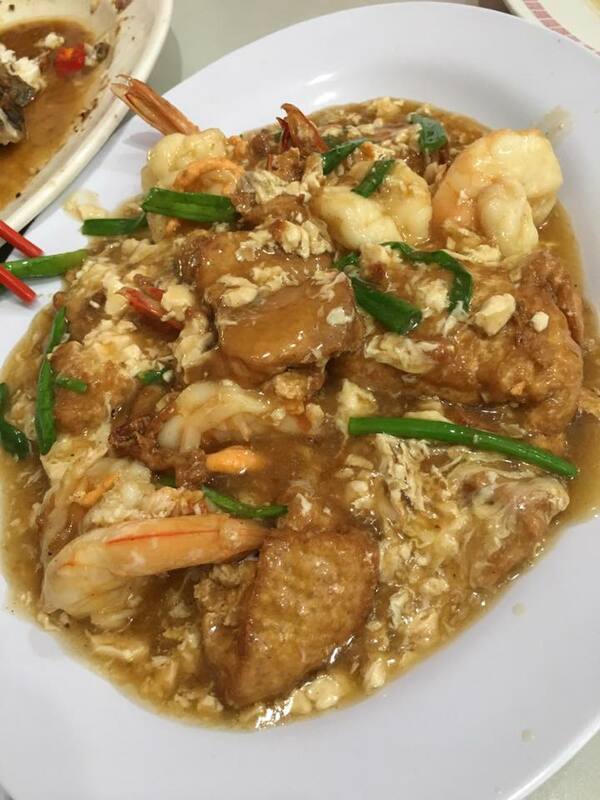 luckily my tofu prawn dish also quite good today. 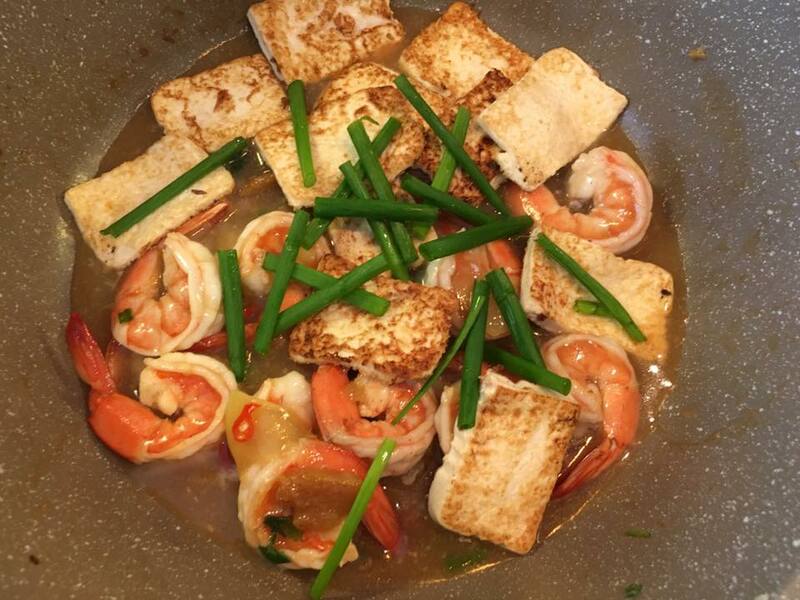 i was recreating sik bao sin’s tofu prawn dish (above photo). 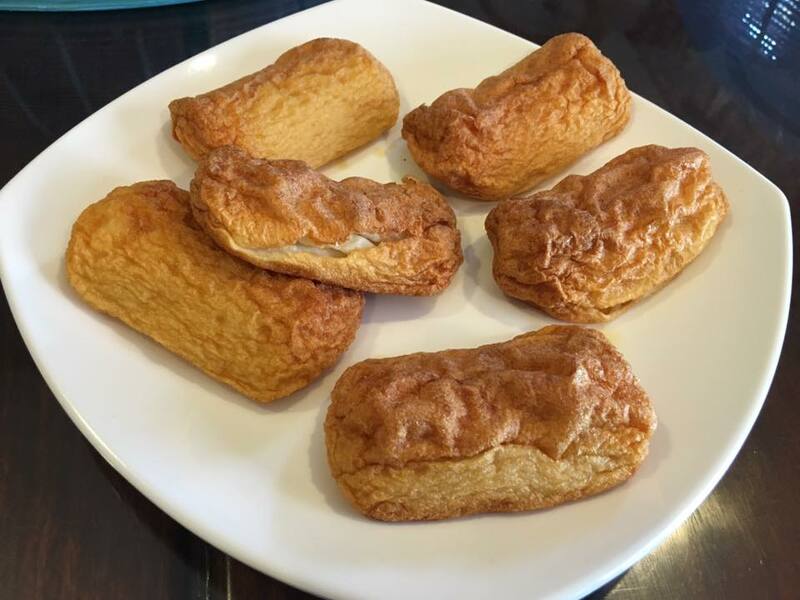 i guess egg tofu would be better but i wanted to use the silken tofu in the fridge, which were soften & harder to fry. but they came out very good today. add smoothness to the sauce & looked pretty! 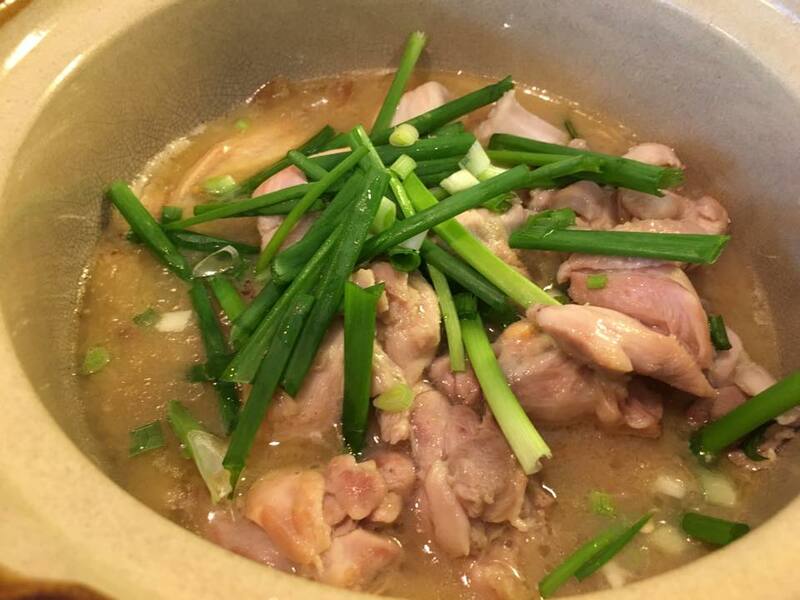 i was modelling after JB shoon huat bakuteh’s claypot chicken. 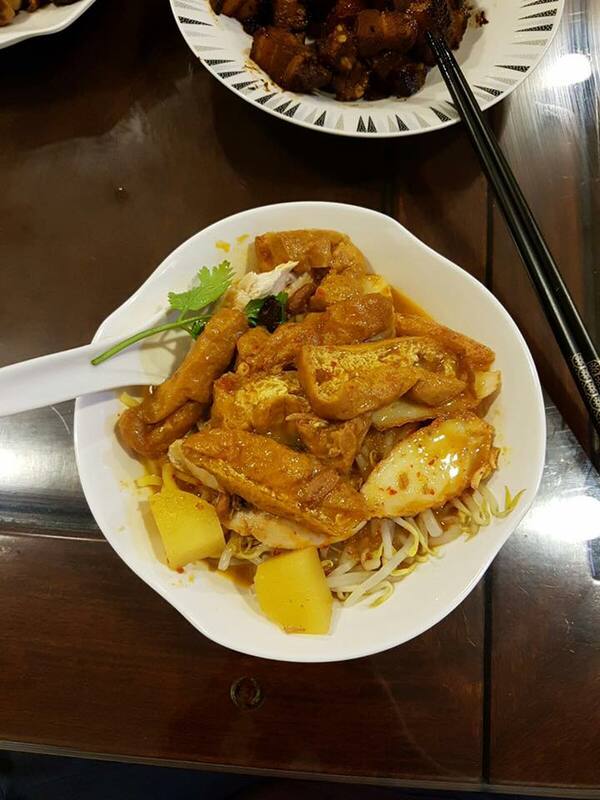 my sauce was very tasty, & chicken very tender not overcooked or “old”, which is the usual problems with chicken dishes outside, but next time i would reduce the sauce a bit more so chicken would be more tasty. 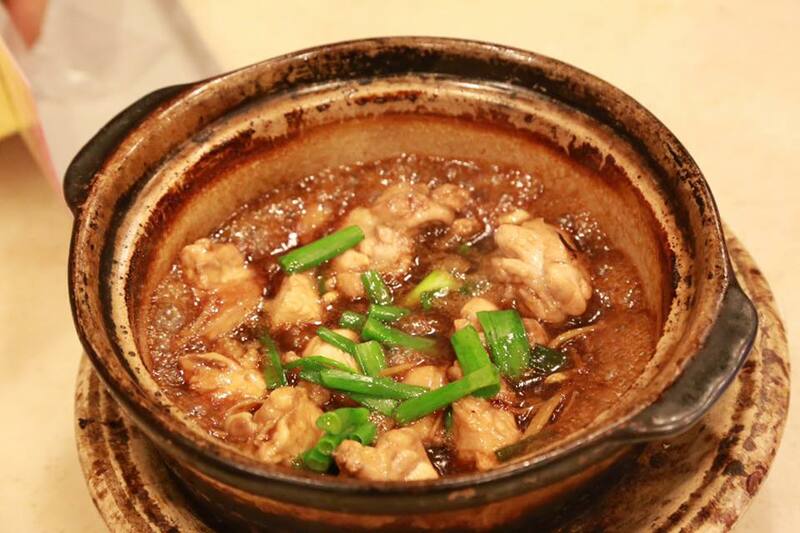 JB shoon huat’s claypot sesame chicken one of the better ones i tried. 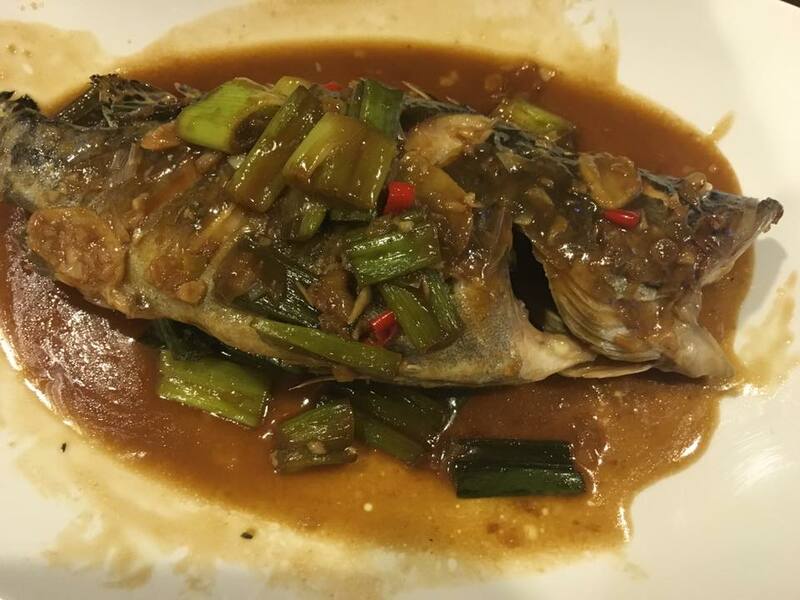 i did a braised yellow croaker 红烧小黄鱼. 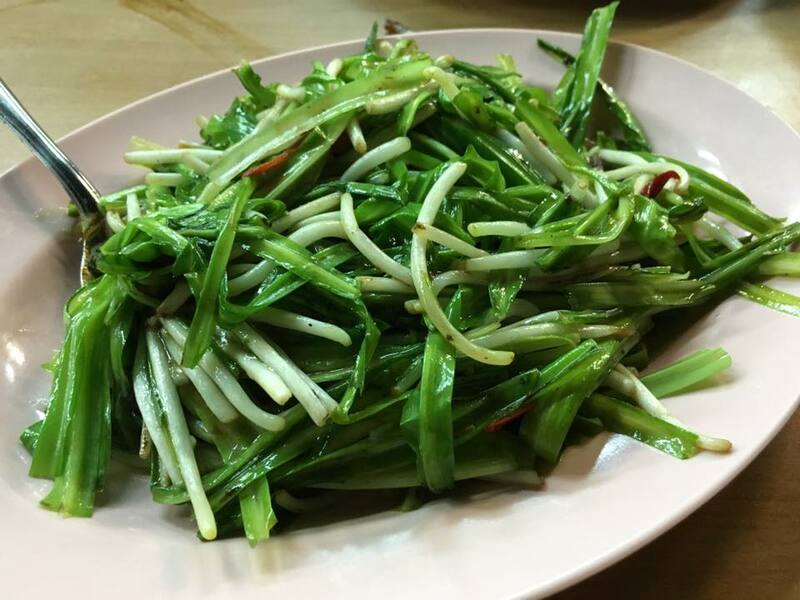 this the teochew 半煎煮style. fish was ok. “pang” from the frying, texture was good. fish was fresh & tasty. but sauce need to be improved. i don’t make it often myself, as my helper does it very well. 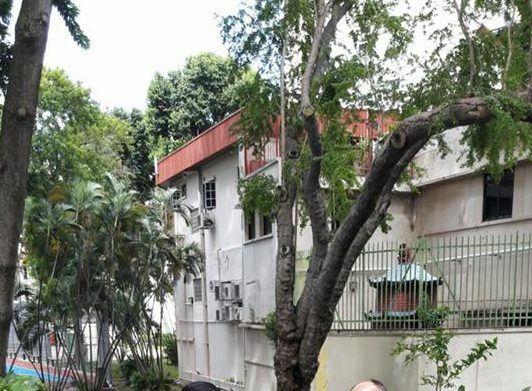 today very nice, we sapu everything la…. 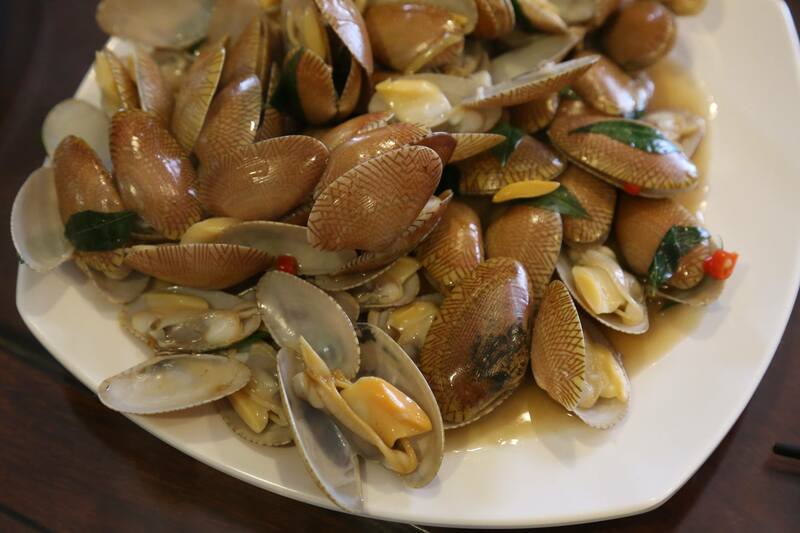 i think only dish today NOT so great was the manila clams. 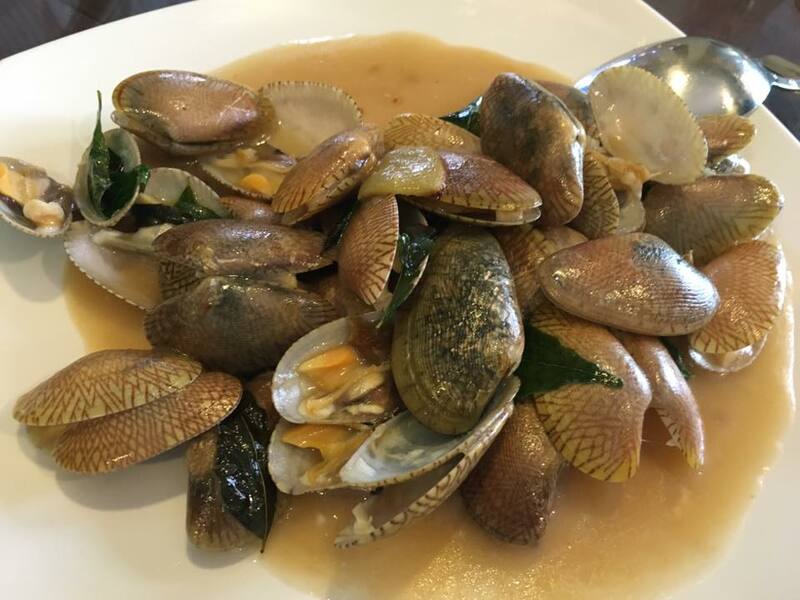 i did an almost perfect manila clams for my friends previously for a memorable 15 dishes teochew muay lunch on 28.0.2015.
this time i bought the clams the day before, and kept in the fridge in water with ice overnight, and drain the clams before cooking. 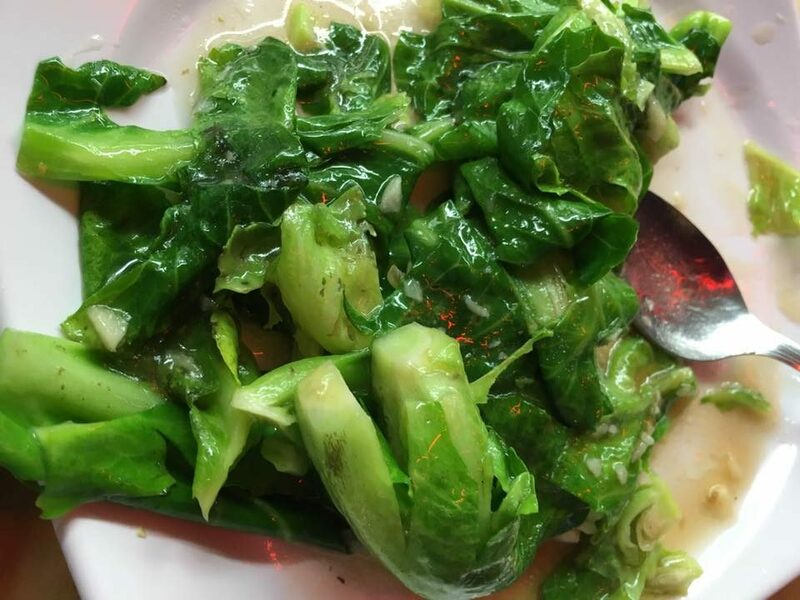 the romaine lettuce 油麦菜 was ok, quite nice, but maybe as my friend said, a dry garlic 清炒might be better still. 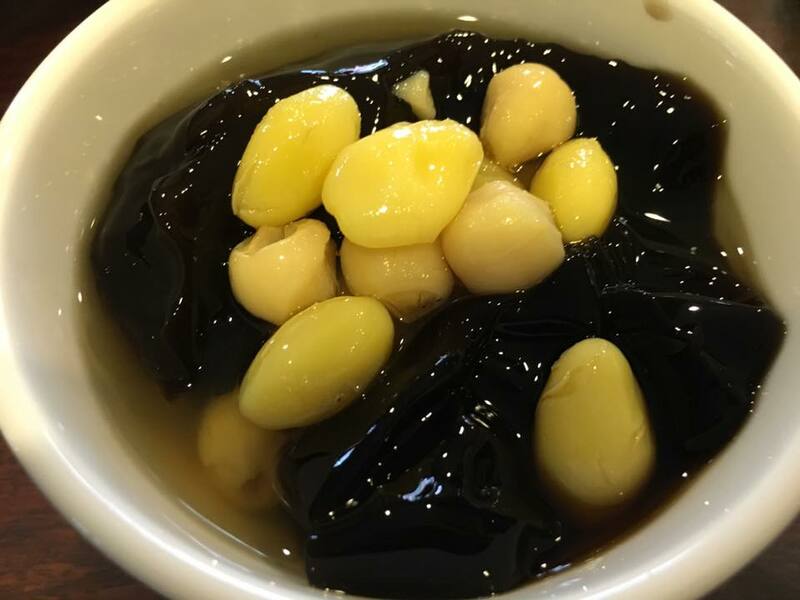 very refreshing & nice dessert, easy to make la…. 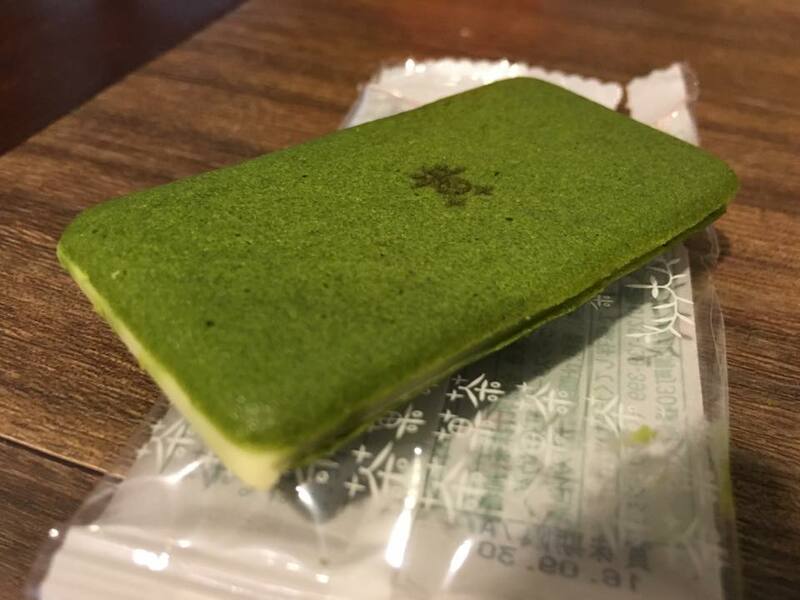 a friend brought nice jap greentea biscuits. this another very enjoyable lunch. dishes quite easy to make & nice. wife having dinner with her friends. children eating out. good timing to do some errands & got a seat at the restaurant at 3pm. restaurant was quite empty at this hour. 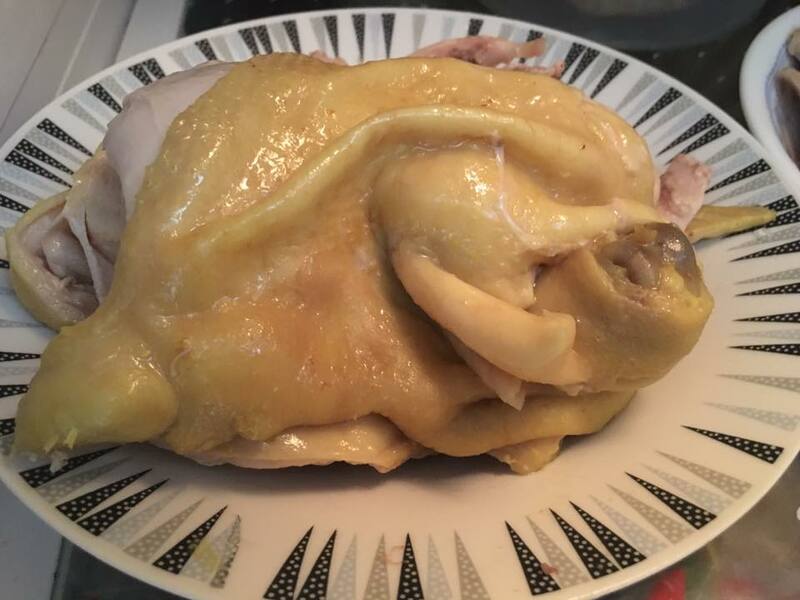 skin breaking up a bit but skin & fillings both tasty. i took with some chilli, quite enjoy it. 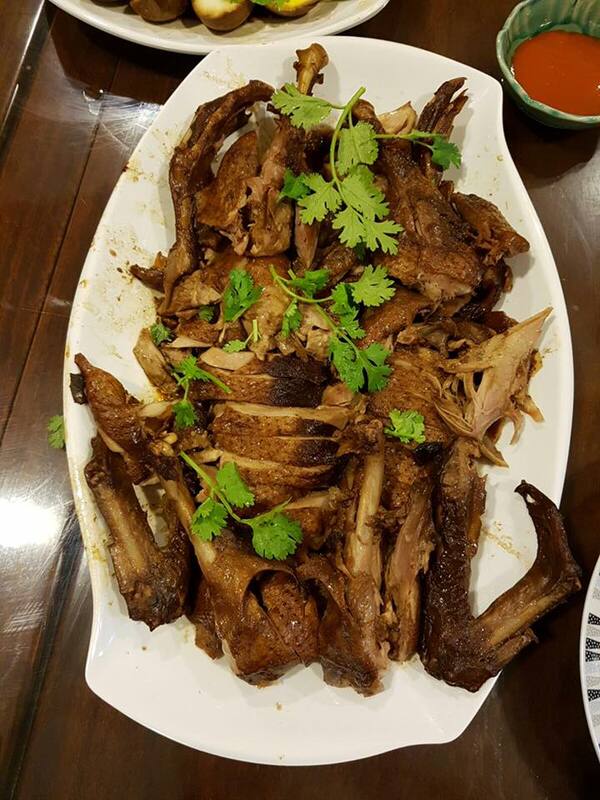 steamed pork ribs were good. 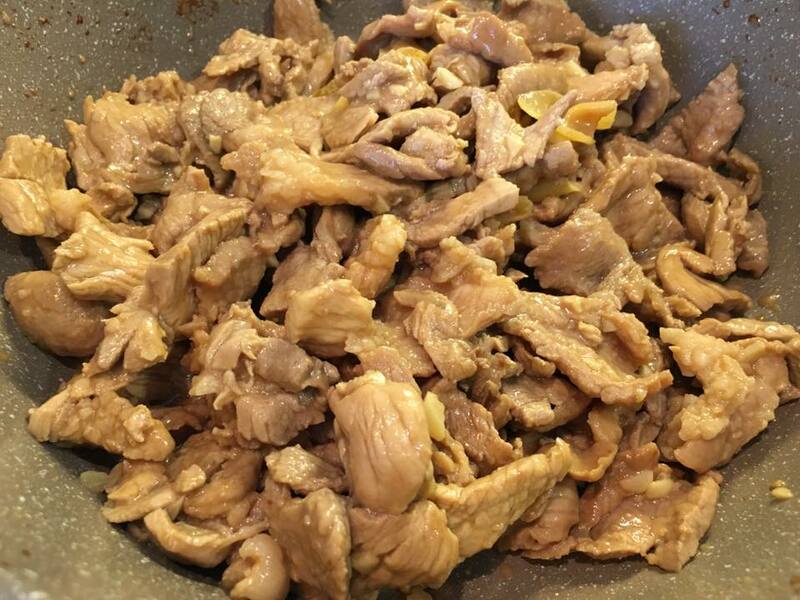 tasty, and good amount of meat. tender too. good standard this. 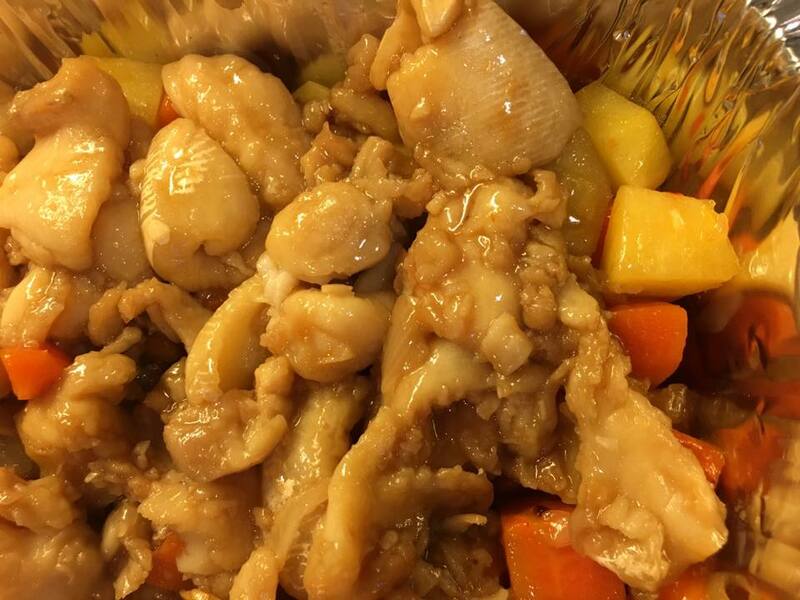 & the steamed chicken feet (top photos). good too. 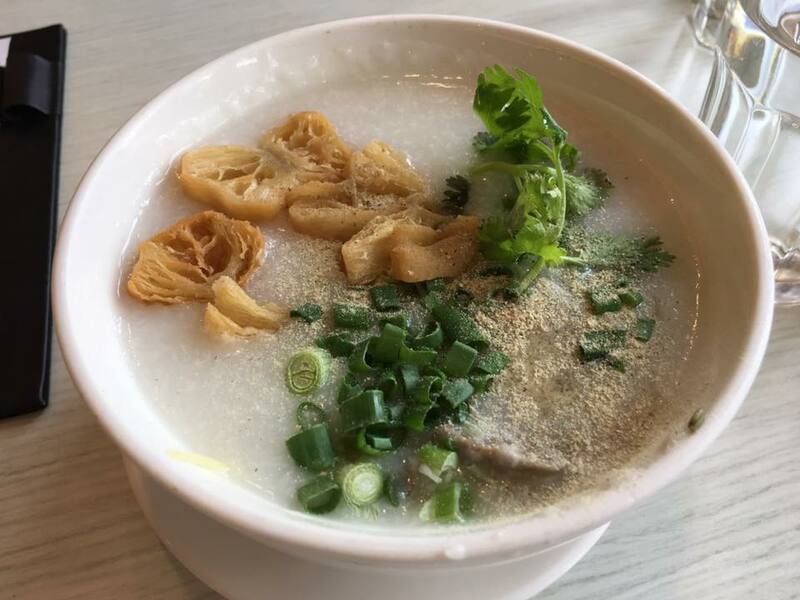 & we always like the porridge (or congee) here. we ordered the 3-combo, with liver, kidney & meat balls. porridg very smooth 滑, very good standard. 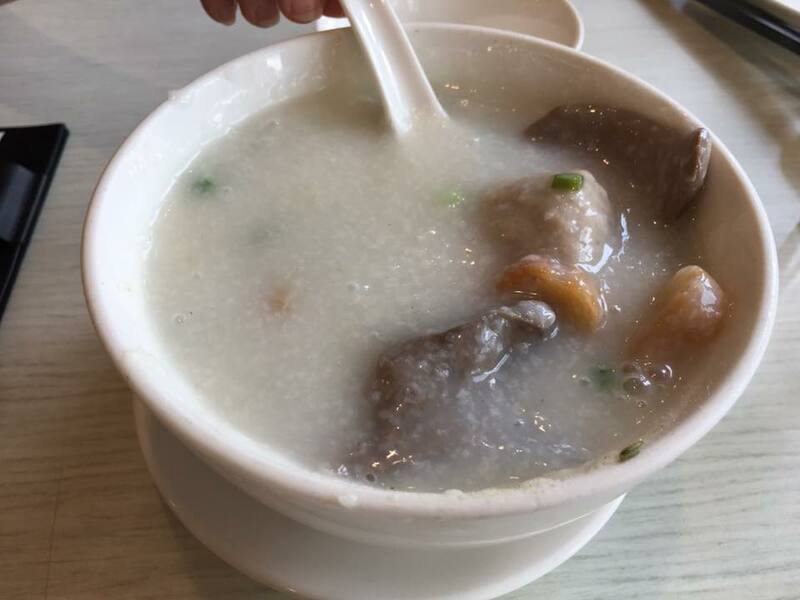 basically this standard of dimsum & porridge is HK standard. maybe a bit more than HK prices. 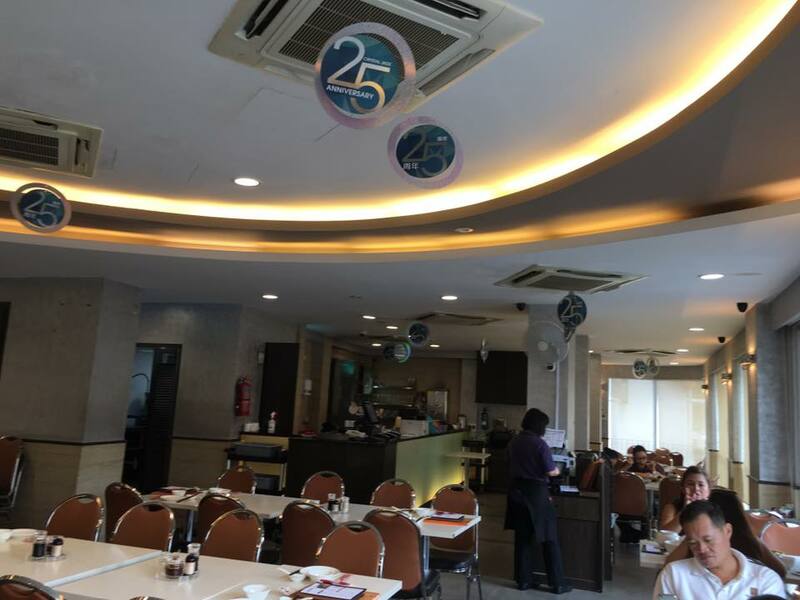 with 25% discounts it was ok at S$26nett. maybe still more ex than HK. pinnacle just outside CBD, so cheap parking just S$1 per hour. 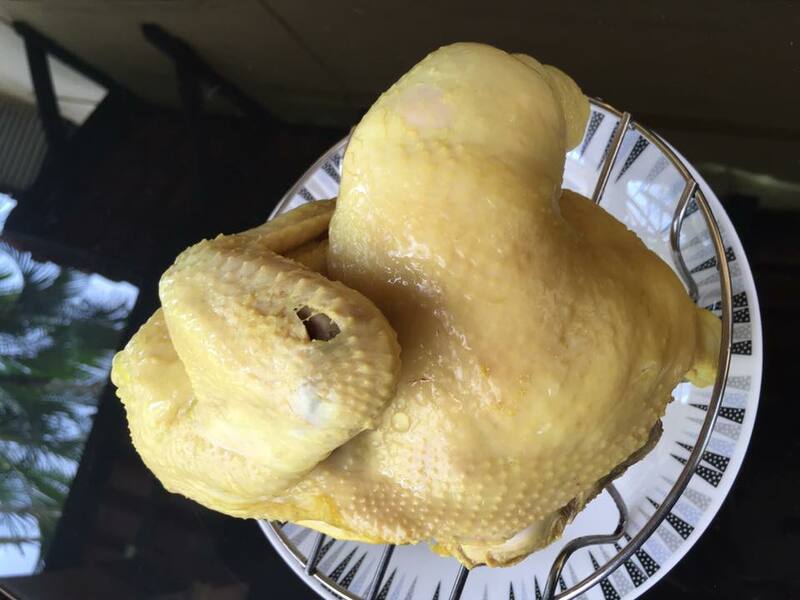 and you can just walk down to tanjong pagar market, where my OPS friend has a stall selling chickens. i bought some apples, pears, spanish melon from a fruit stall there. 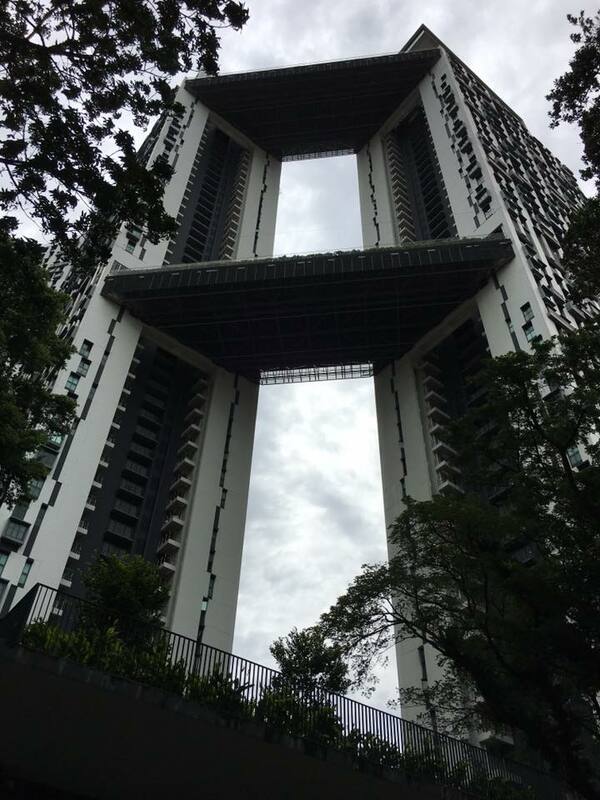 such a wonderfully designed HDB skyscraper. 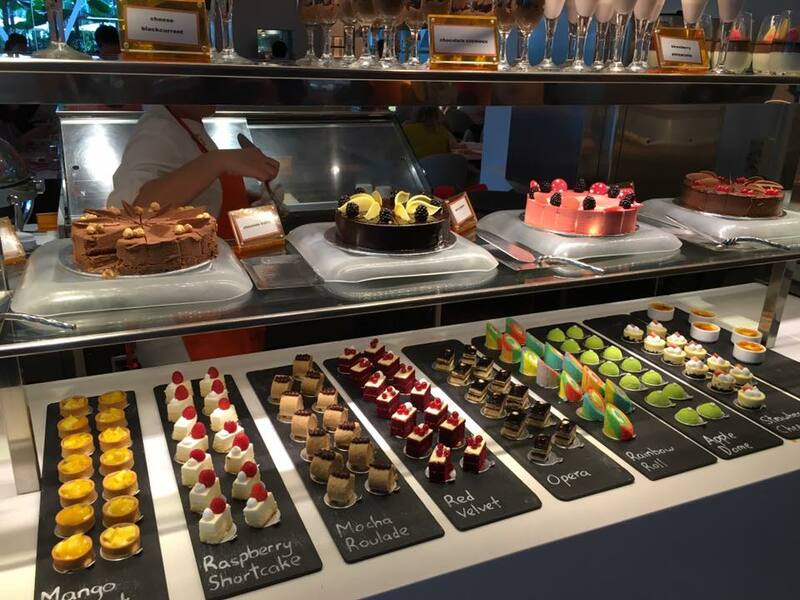 nice cafe. there is nice seating indoors. also nice wooden tables & chairs outside. view of the buildings from the outside patio. 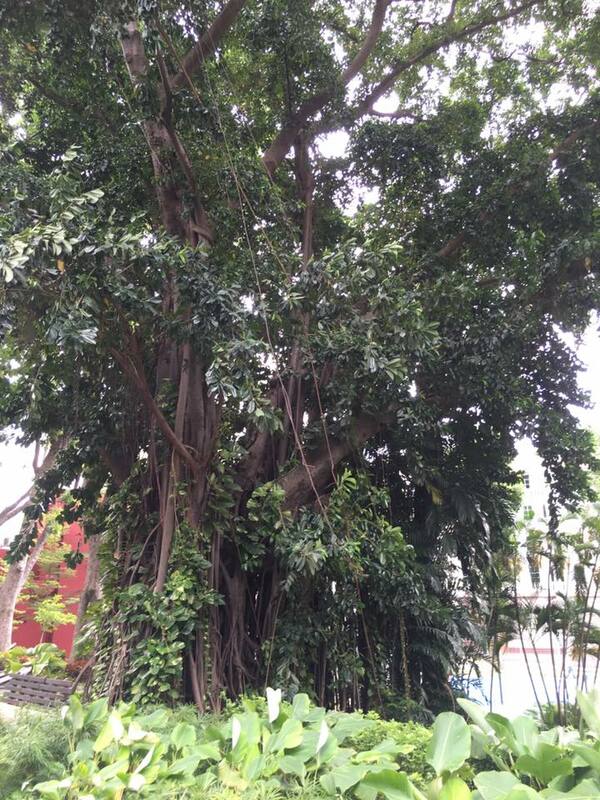 & the ancient tree outside. i had a cappuccinoS$2.40. the long black were similarly priced. it was average, not great, but quite a lot lower price for brewed coffee. 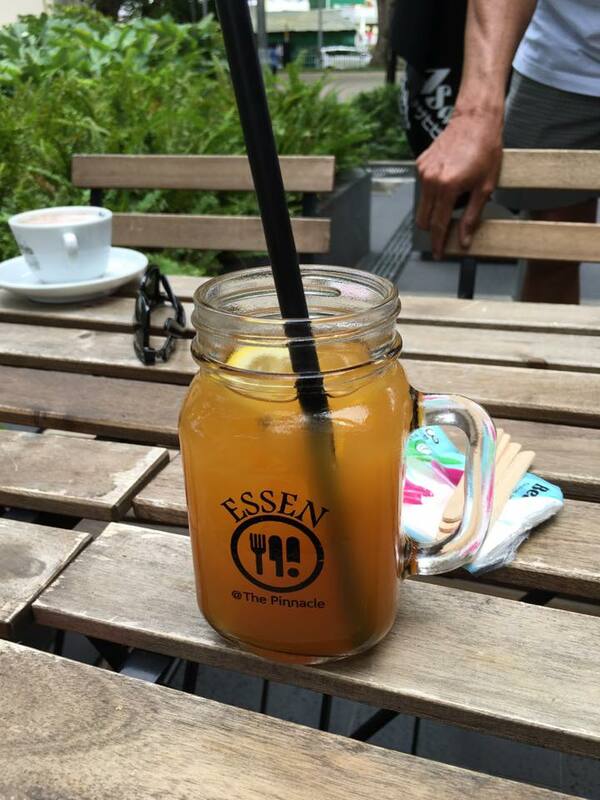 the i had another drink – an iced lemon tea. this was very good. not like just tea with a lemon slice, but nice strong lemon drink with tea flavours. very good. not too sweet also. 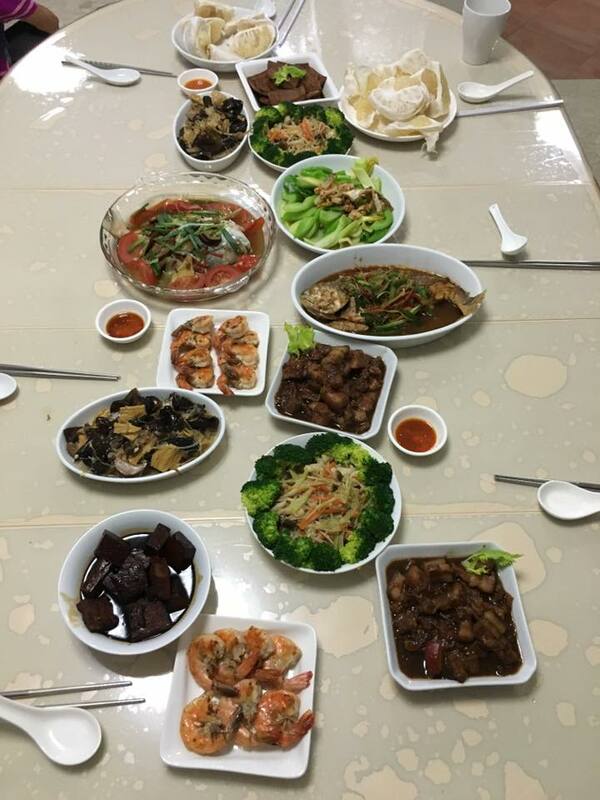 we had 7pax dinner here last month on 16.8.2016.
food was ok for me and there were a few dishes i liked especially the trotters, duck soup, & the 百叶fried bean curd puff dishes. 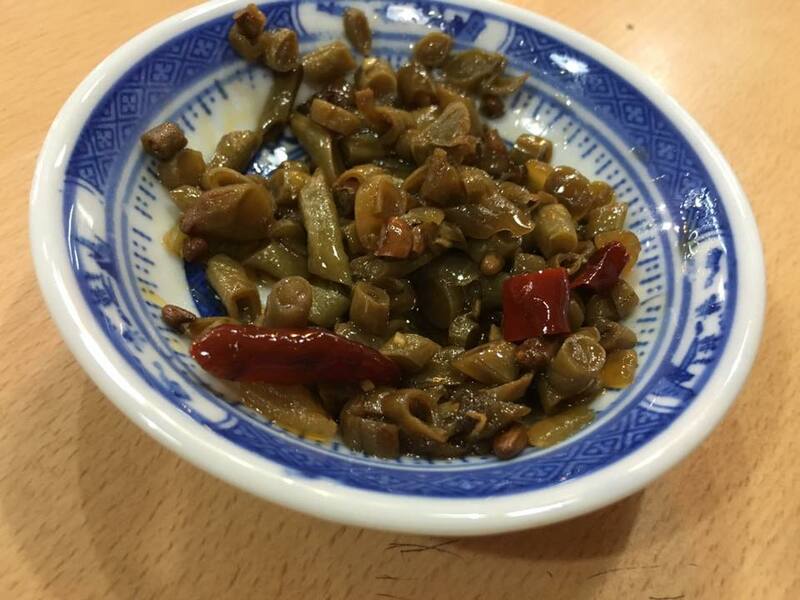 we had chinese tea & appetizer, a spicy bean thing, slightly salty. 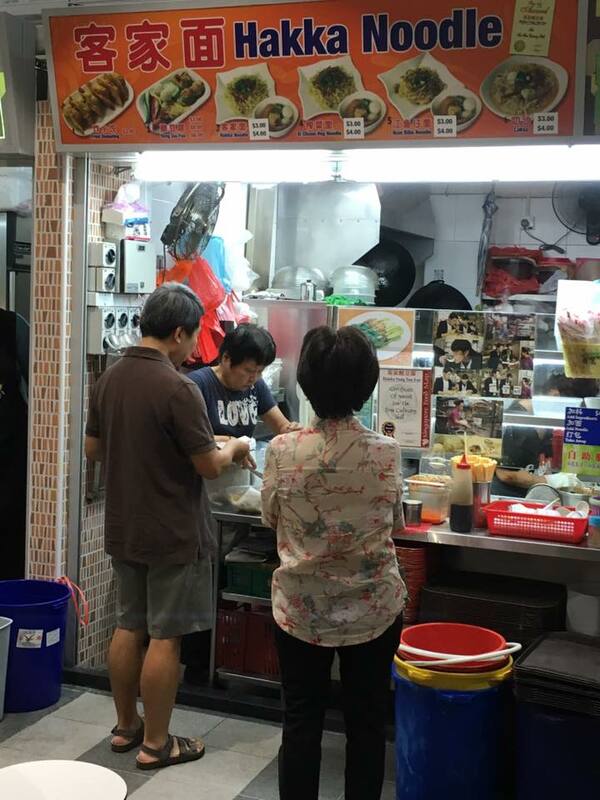 i saw on the bill (bottom photo) that they charged S$1pax, pretty ok.
my 2 OPS friends ordered the dishes. & they were a lot better than the last time. 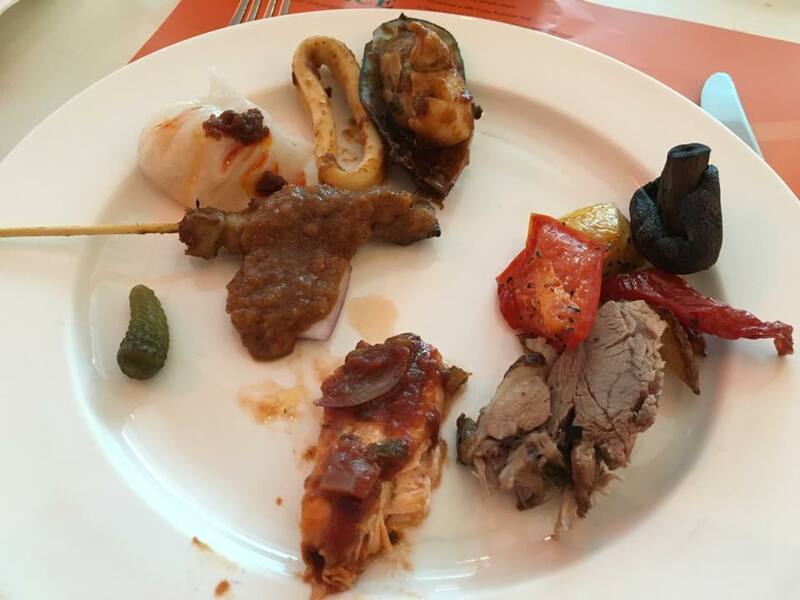 we had jelly fish, refreshing, quite standard, pretty ok.
we had 10 skewers – lamb, pork chicken. 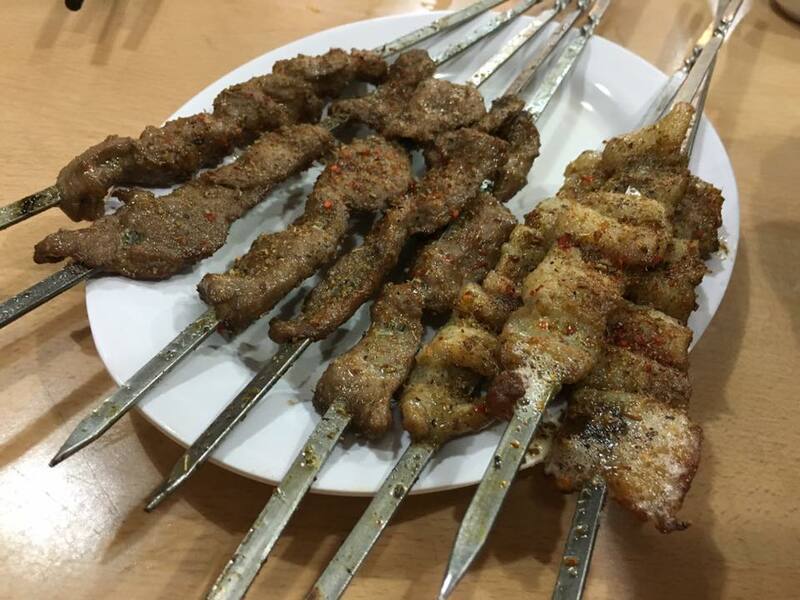 seasoning ok the peppery 羊肉串flavours but the not well bbq, don’t have the bbq flavours. frog was poor the last time. 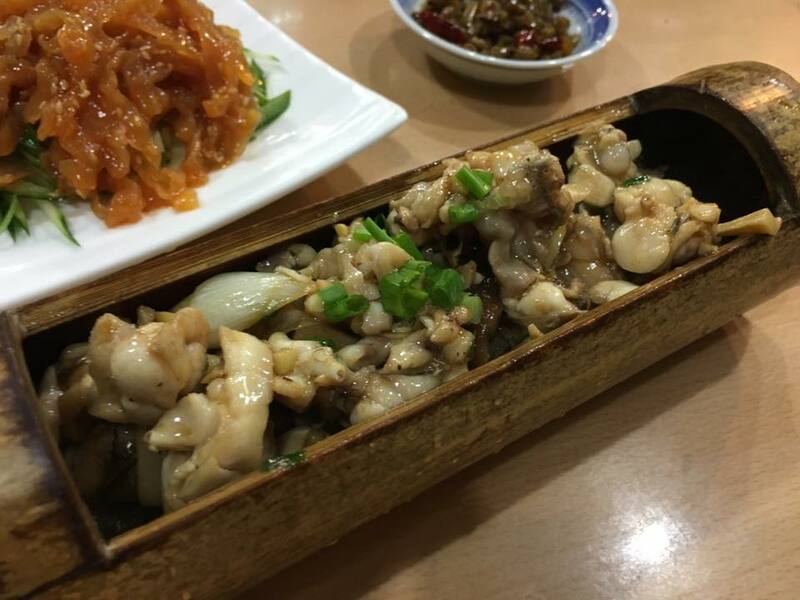 but this frog in bamboo 竹筒牛蛙 quite tasty, especially with the sauce at the bottom. 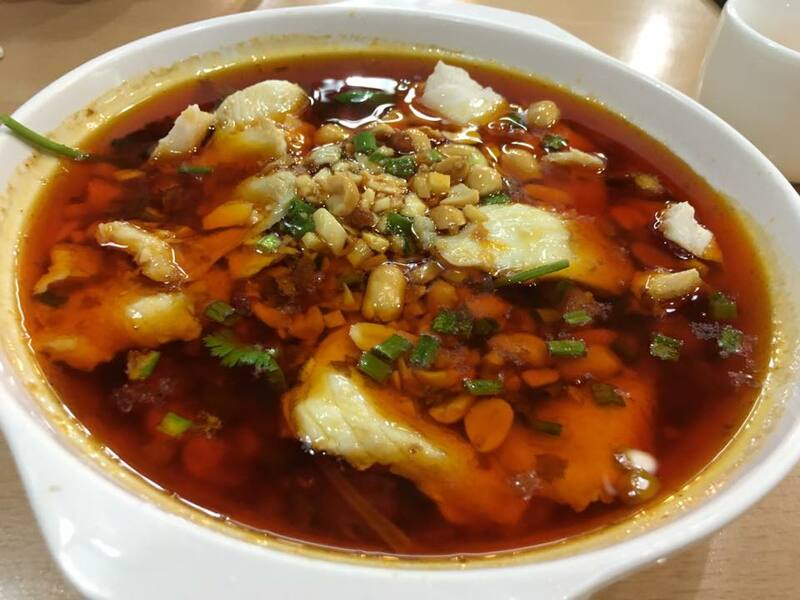 the spicy fish 口水鱼 looked wonderful, not quite the usual 水煮鱼standard. 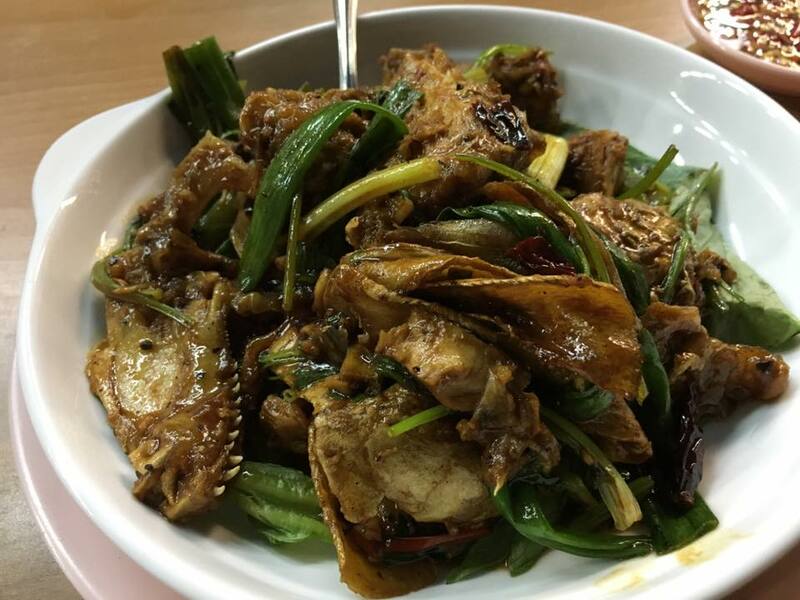 the spices were actually quite good, flavourful, but the fish slices not great, not sweet, texture not great, not sure what fish this. 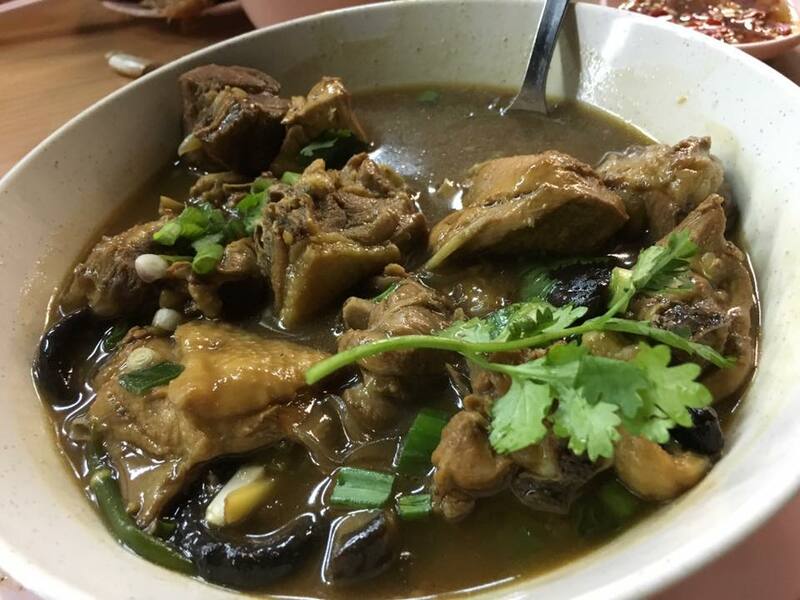 the stewed chicken with mushroom dish was very tasty. the soup was excellent though slightly salty, still drinkable. 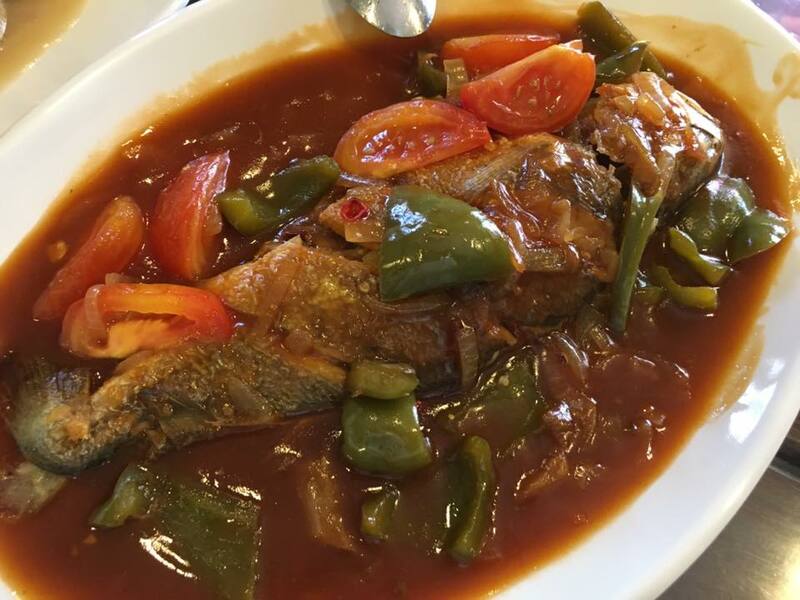 the 红烧雪菜小黄鱼braised yellow croaker with salted veg was excellent. 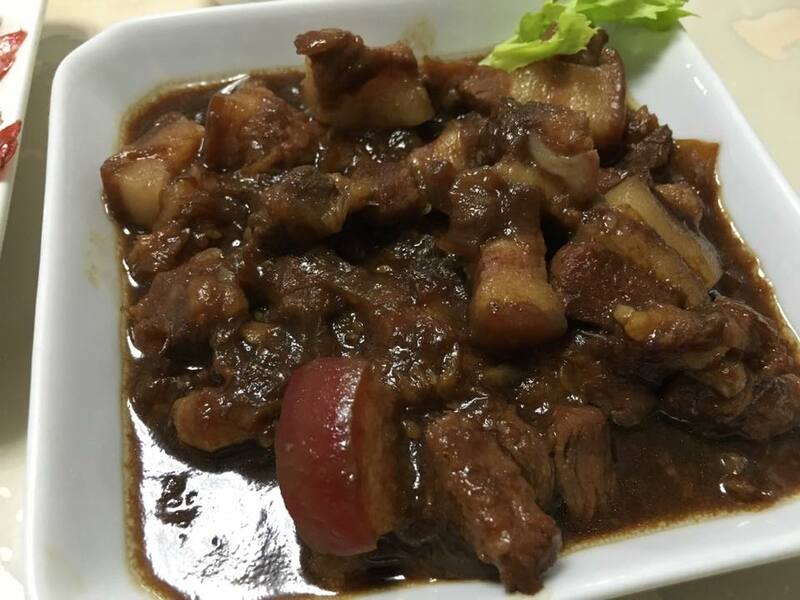 the frying 煎made it very “pang” & the braising 红烧gave it the sauce flavours & moist texture, excellent 半煎煮preparation. 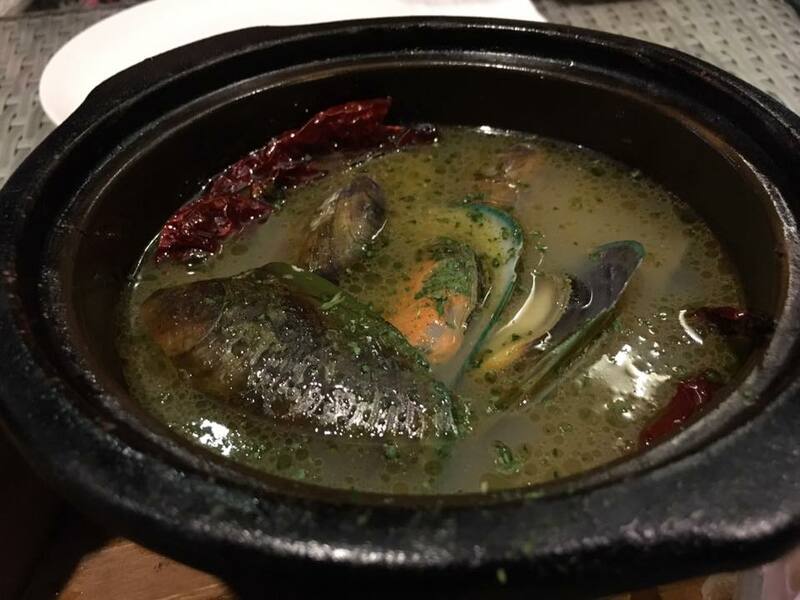 for me the chicken soup & the 红烧雪菜小黄鱼braised yellow croaker were the 2 best dishes for lunch today. 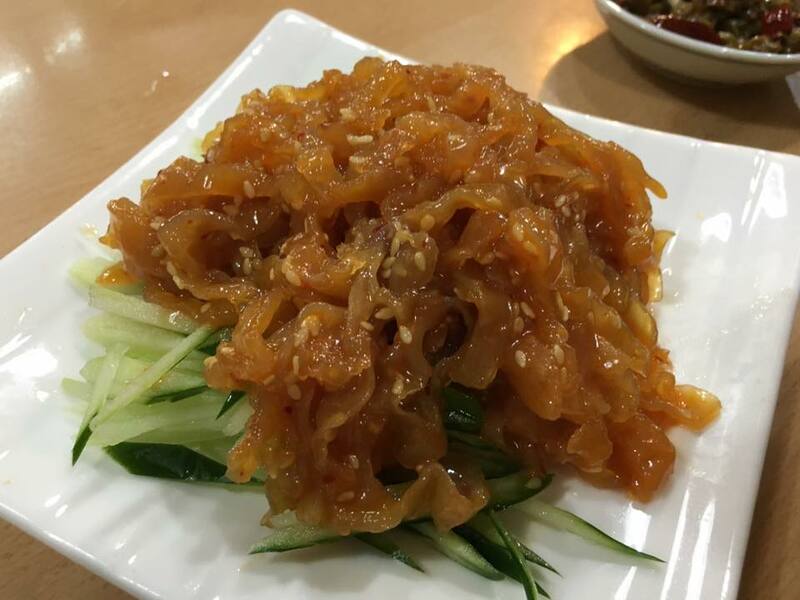 the julienned potato strips 土豆丝 was good, very competently done, excellent crunchy texture & sweet. 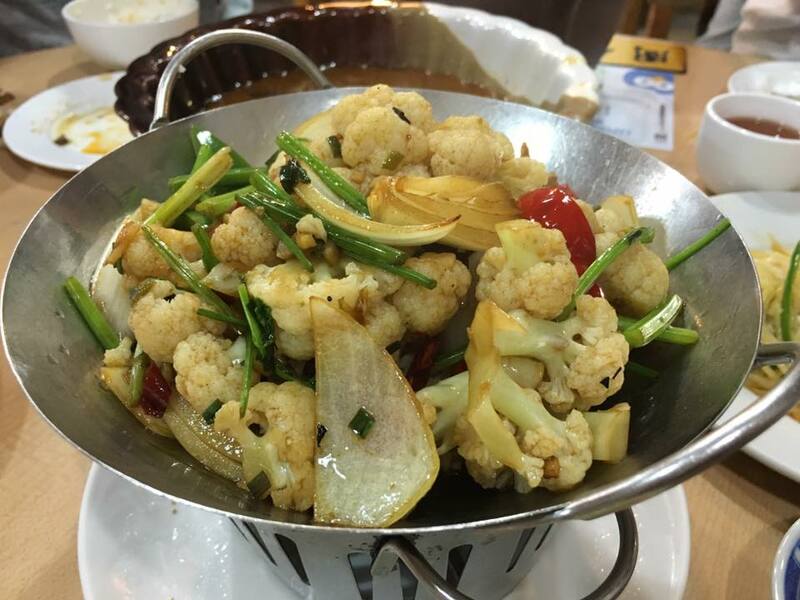 the spicy veg 干炒时蔬 was a bit wet, not so 干. veg were ok, good enough, the flavourful mala taste only at the bottom. 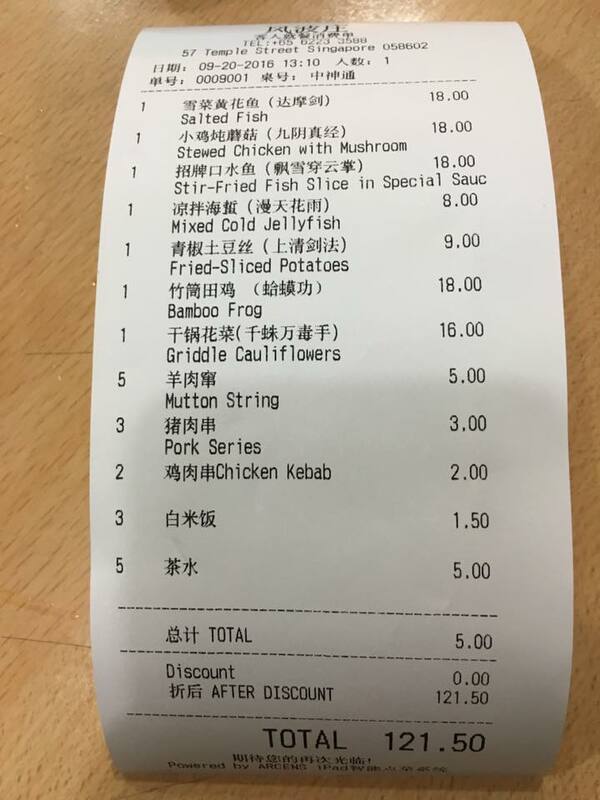 the bill for 7 dishes + the 10 skewers came to S$121. 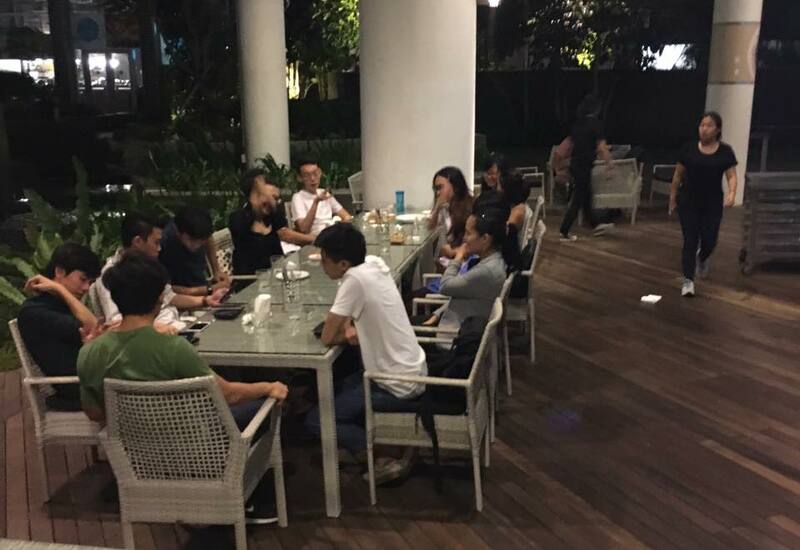 so with groupon voucher S$50 discounts (S$50 for S$100 voucher), it was S$71 for 8 dishes for 5pax. a really good deal in my opinion. today the lunch was very good. 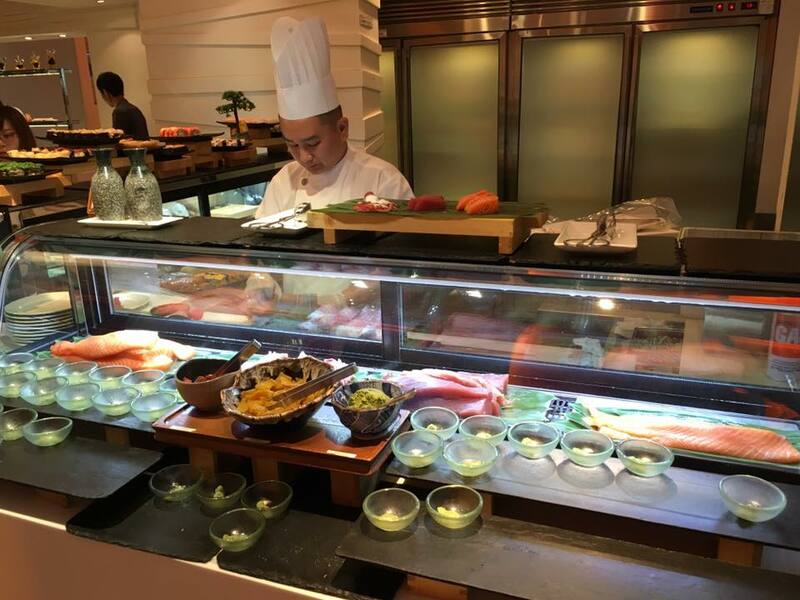 i enjoyed every dish (more or less), and the service was quite ok & pleasant. 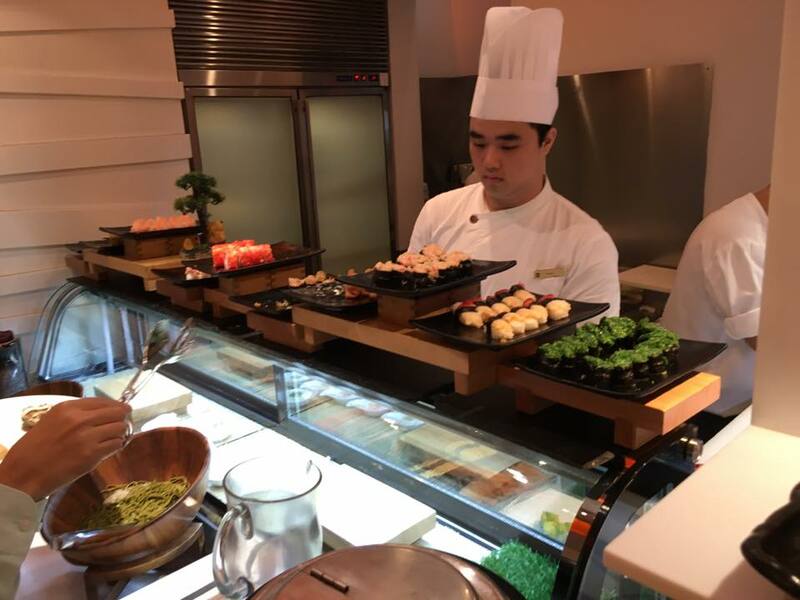 first we ordered dishes that was almost all good (for me only the skewers were food i didn’t need..), and service also…so ordering the right dishes make a huge difference. like i mentioned previously if you don’t need to ask questions, just order yourself the service was quite the usual & pleasant enough. after this lunch, this a place i will come again if there is groupon offer, just maybe not too soon. 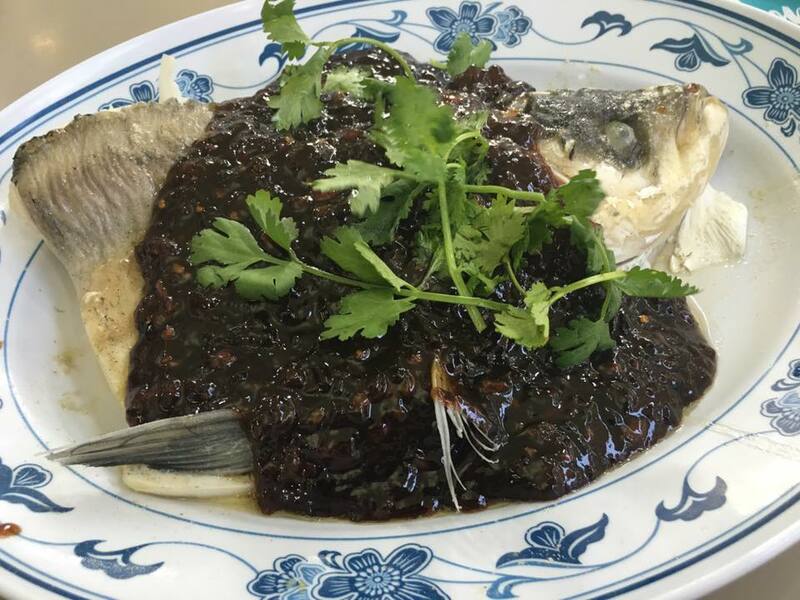 i made spicy black bean sauce-song fish head 松鱼头 a few times recently. 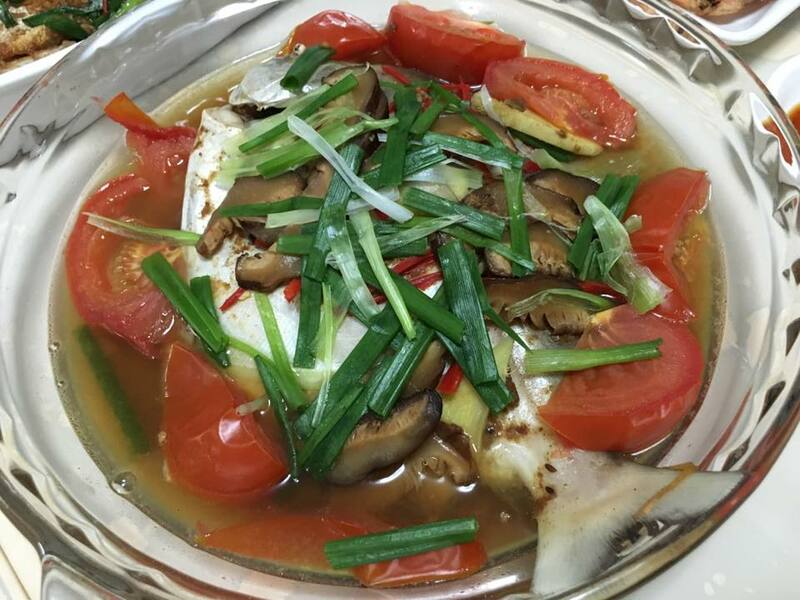 here is the recipe (updated using the best fish head i made on 10.9.2016). 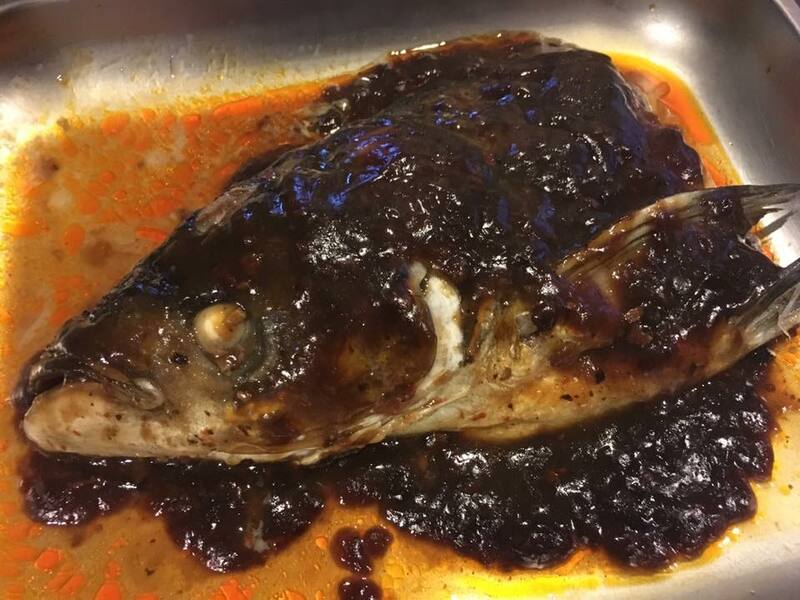 i was at sheng shiong the other day & bought one whole song fish head松鱼头 for S$8.90. 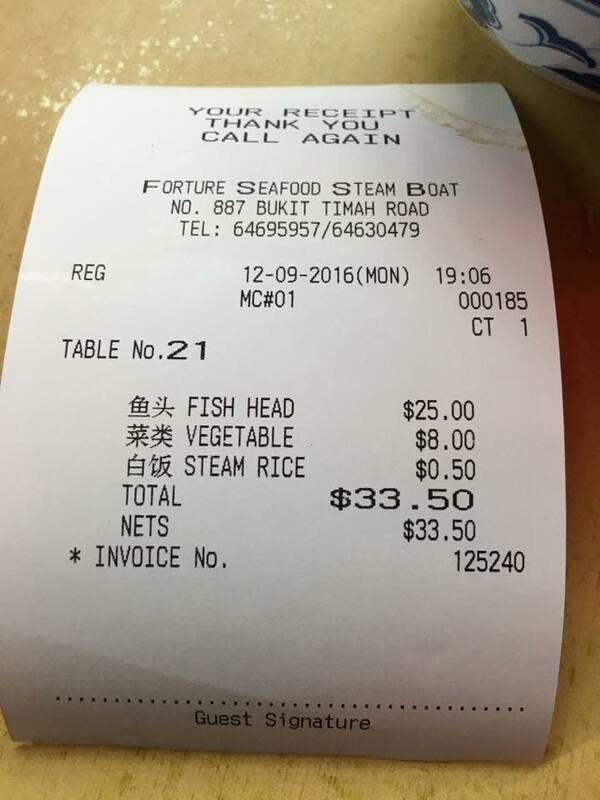 usually it is S$6.90 for 1/2 at sheng shiong so i don’t buy unless i go to chinatown market where they sell S$8 for one fish head. this evening i did the best one yet on 10.9.2016.
i mixed them cold to dissolve the corn flour & tasted the sauce. it was very good. i then heat up a bit & the sauce became slight clumpy. i addd to the fish & steamed for 13mins in the steam oven. 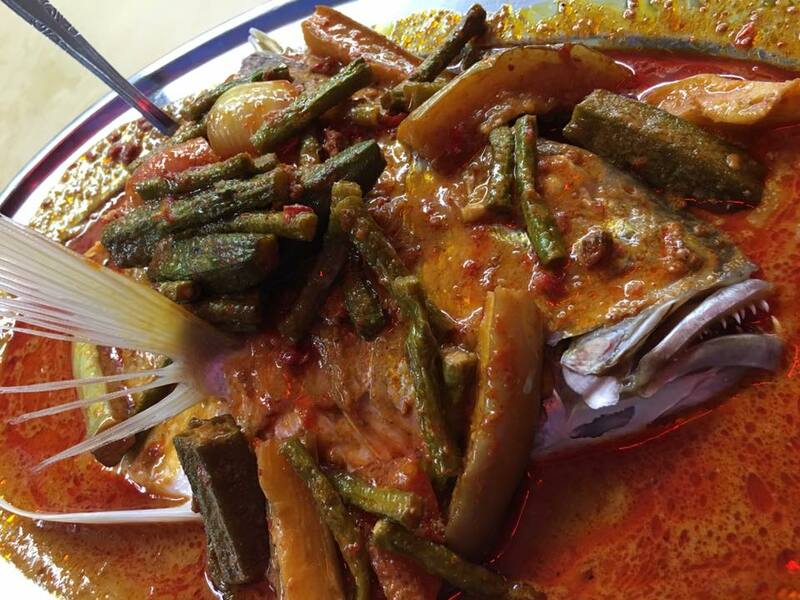 btw, this was also how hk street chun kee at commonwealth crescent food centre make their fish head. the dishes were planned by my sil & her helper the evening before, and cooked by the helper. 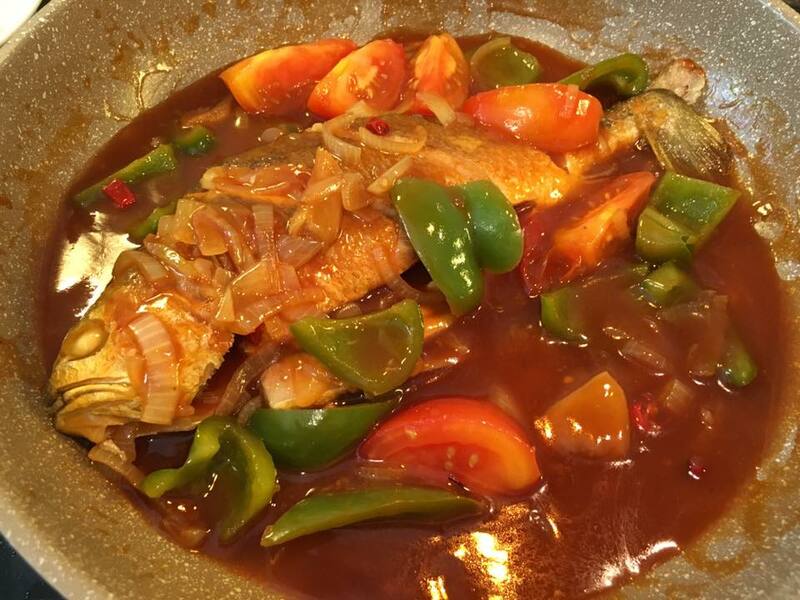 i did a braised mandarin fish 红烧桂鱼 2 days later when my sis & bil came for dinner at my place. my was not as good la… yet …haha! 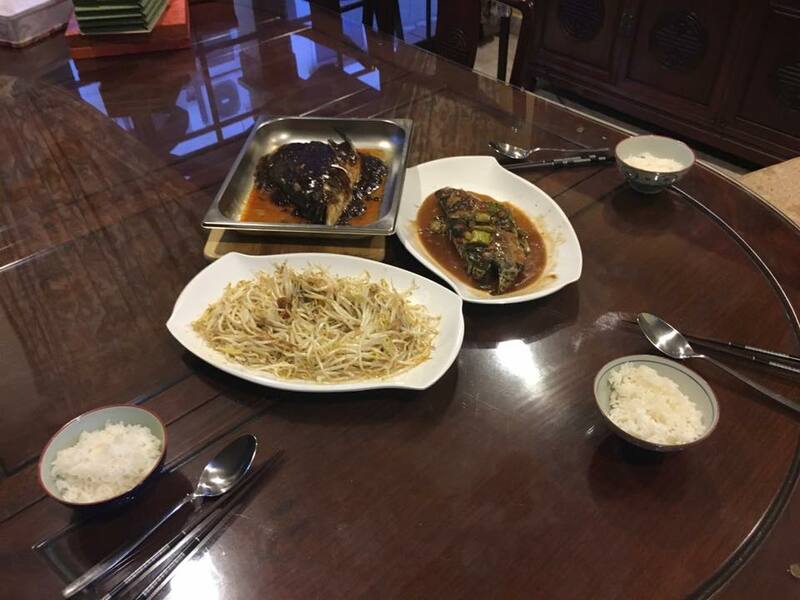 steamed pomfret the usual, fresh fish & a regular good teochew dish. 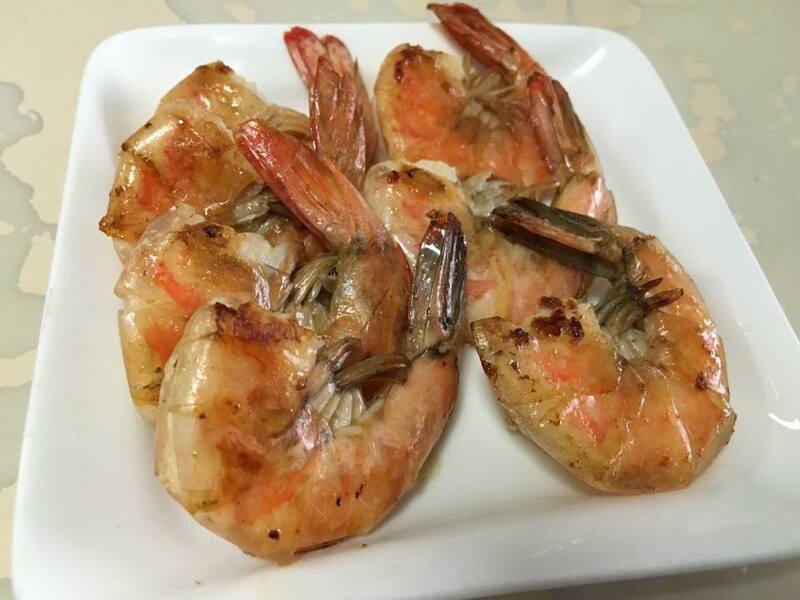 her prawns were good too. & the tau you bak was tender & nice. not elaborate like my tau you bak. a good pointer for me to find the simplest way to cook a good tasty dish. 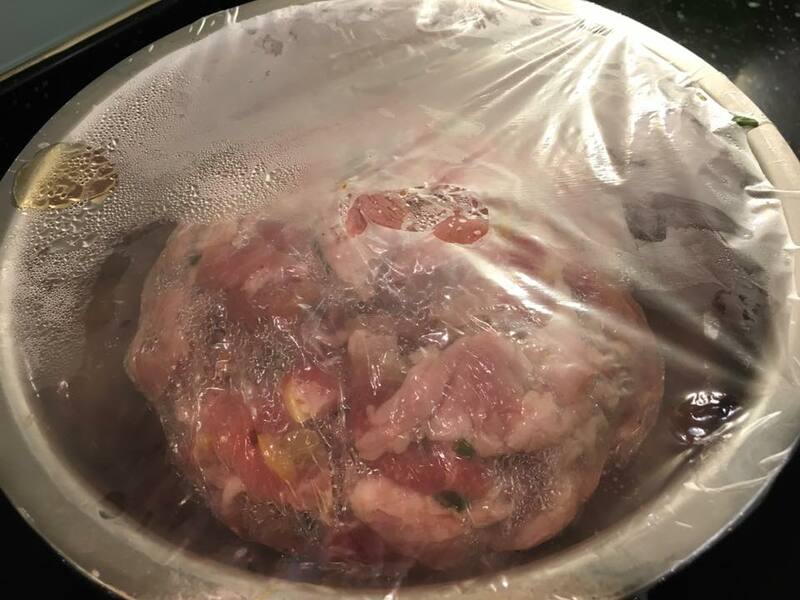 i will try out this dish without the oven slow braising. brocoli also a simple comfort food. 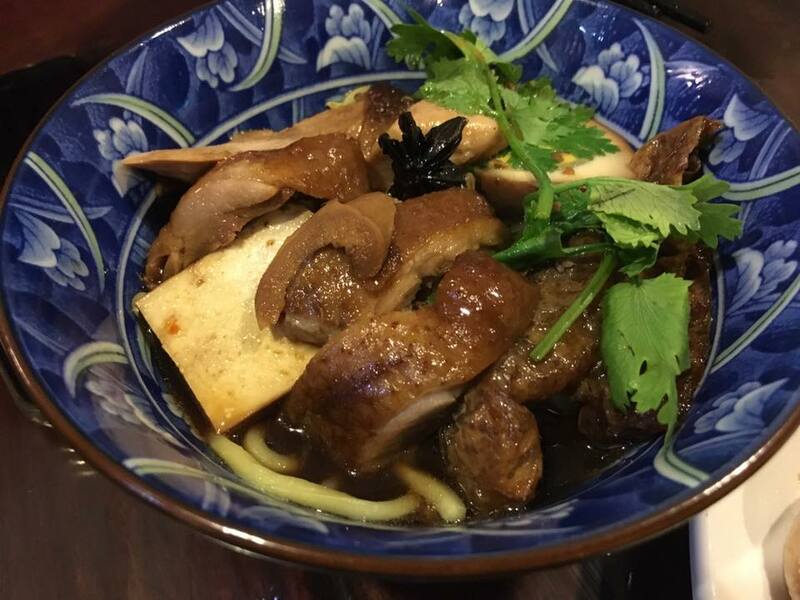 it was done nicely poached (or lightly fried) with nice enoki (golden mushrooms). 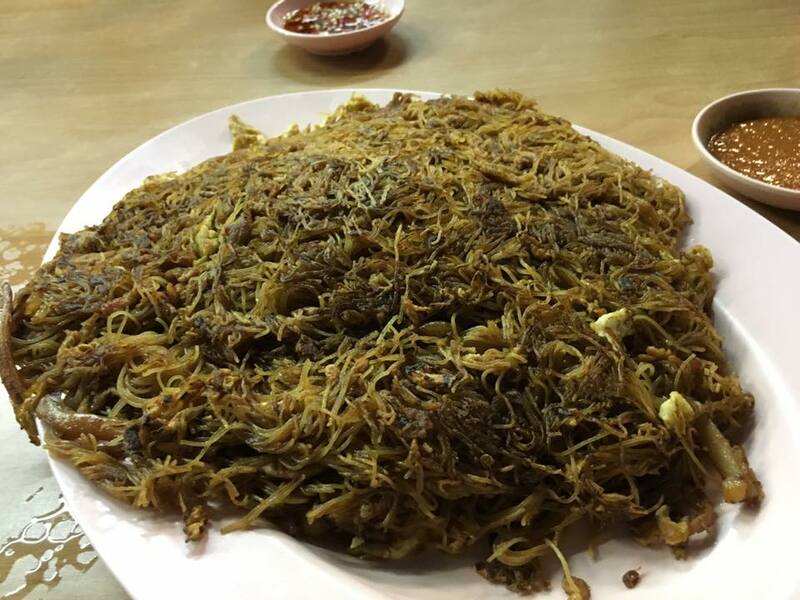 the fungus tanhoon tau kee dish again simple & good. the hard tau kua i have not taken for eons, almost didn’t remember them. my mom/grandma used to cook them. 2 different type of sauce. 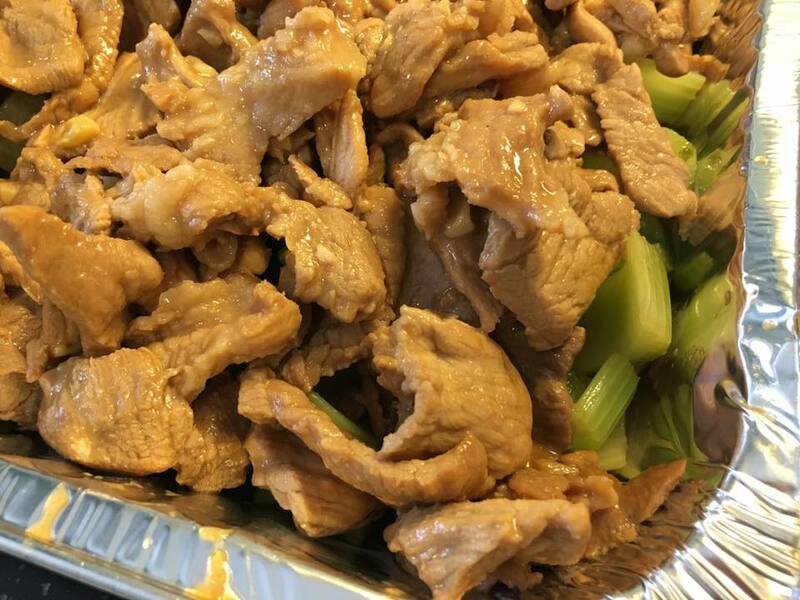 i like this dark soy sauce one better, but this not my preferred tau kua dish. 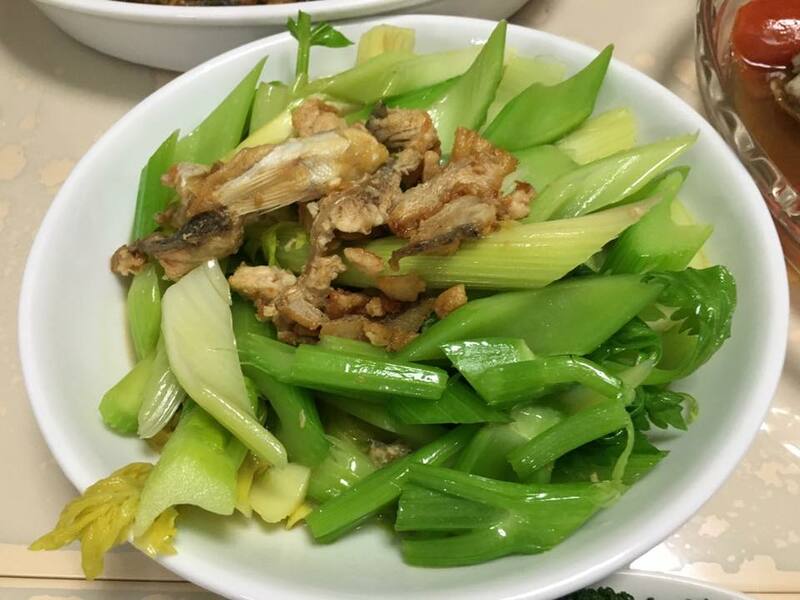 & my sis’ salted fish with celery was simply wonderful! 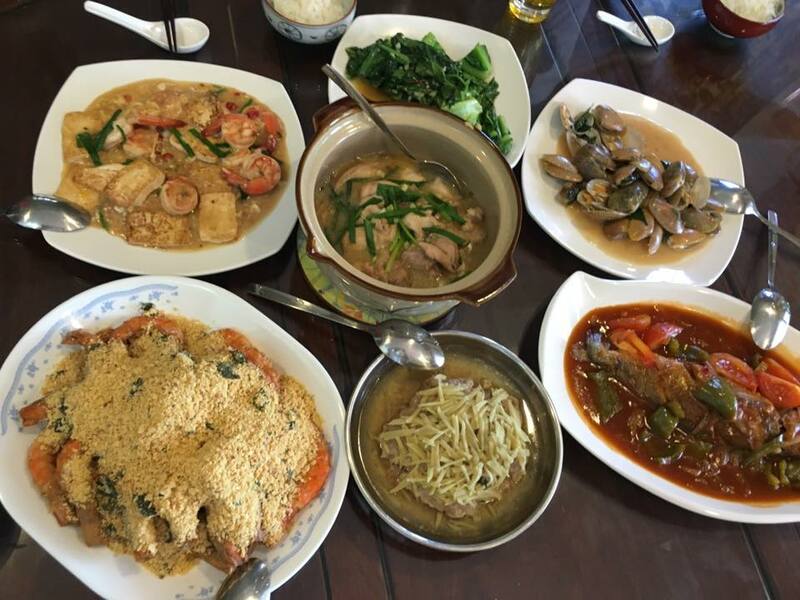 a very nice meal with family. after dinner, brother called & talked with our relatives in china. 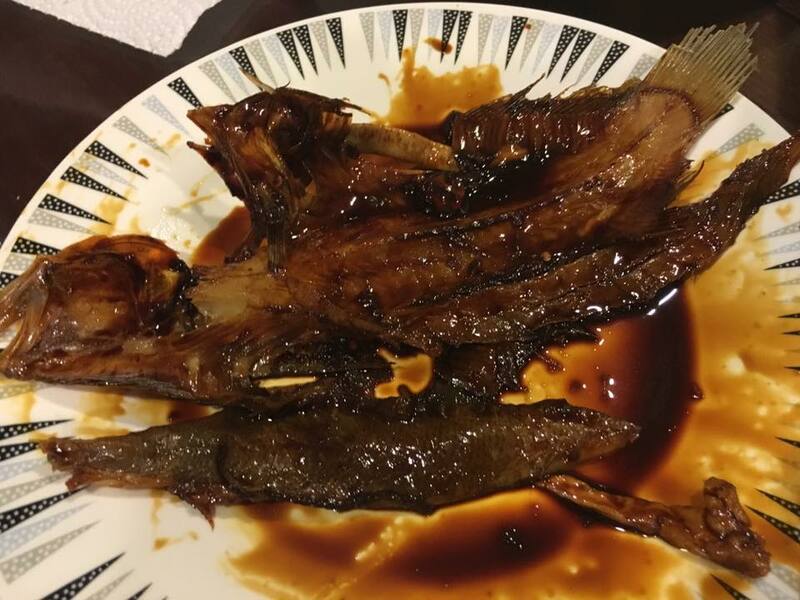 i had 1/2 song fish head 松鱼头 leftover in the freezer from last week. i made one HK steamed mandarin fish港蒸 桂鱼 at the time on 17.3.2016.
my sis & bil have been frying the vegetables the few times they ate here recently. 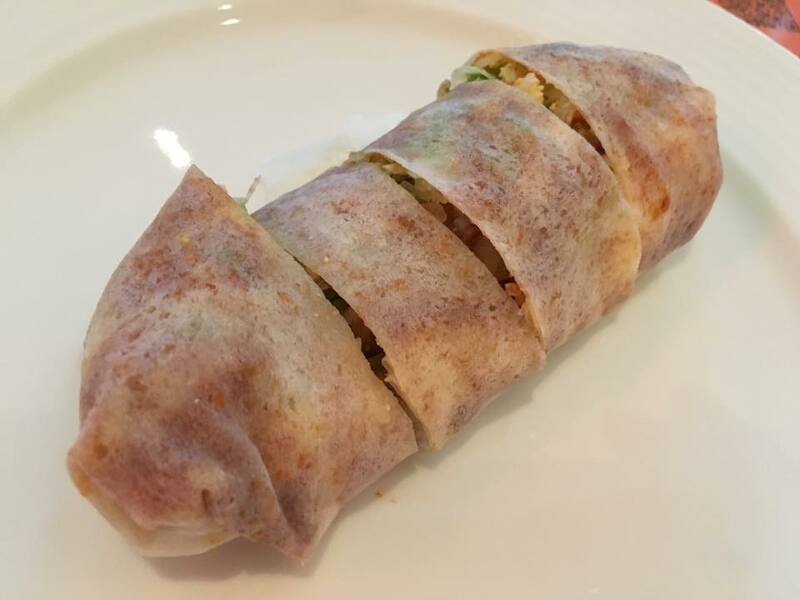 the paste was still quite good, but it was not as good as the last time on 10.9.2016. that one was like perfect la. 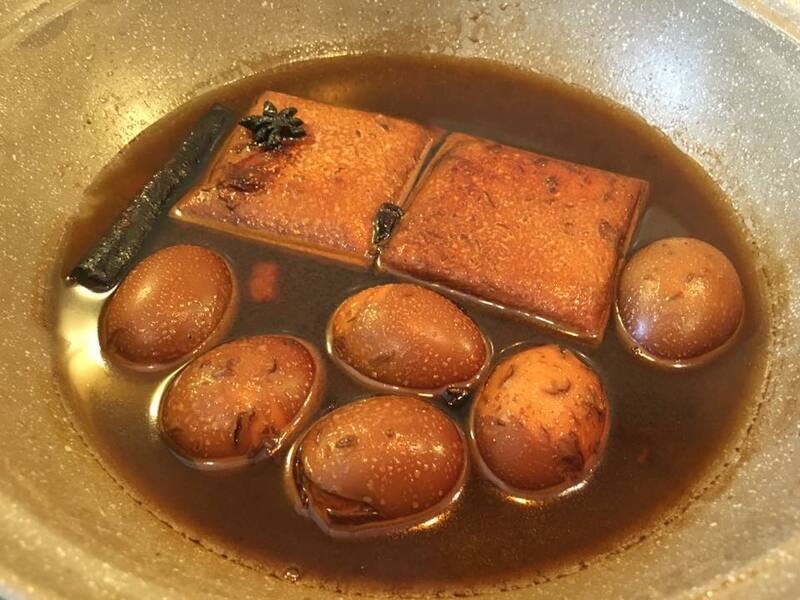 i am thinking maybe 2 reasons- (1)i experimented by adding 2 tbsp shaoxing wine (ie should not add) & (2)i added a bit more black vinegar. 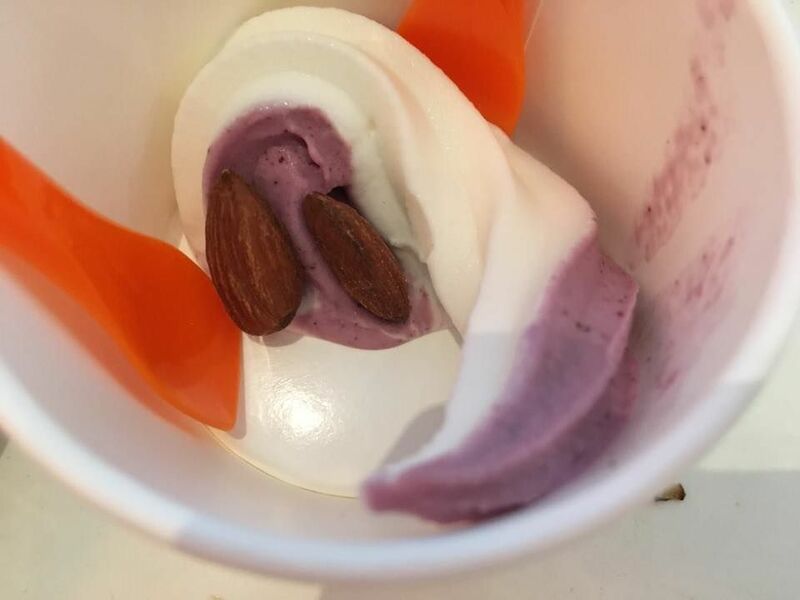 there was another hiccup with the texture. for some reason texture was soft. 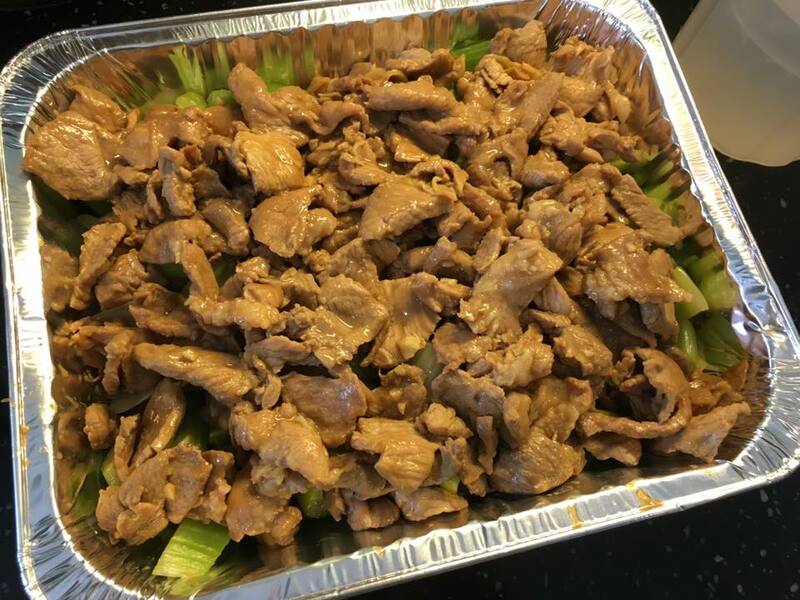 it did not feel like bad or not fresh & though texture was soft the meat still held together. 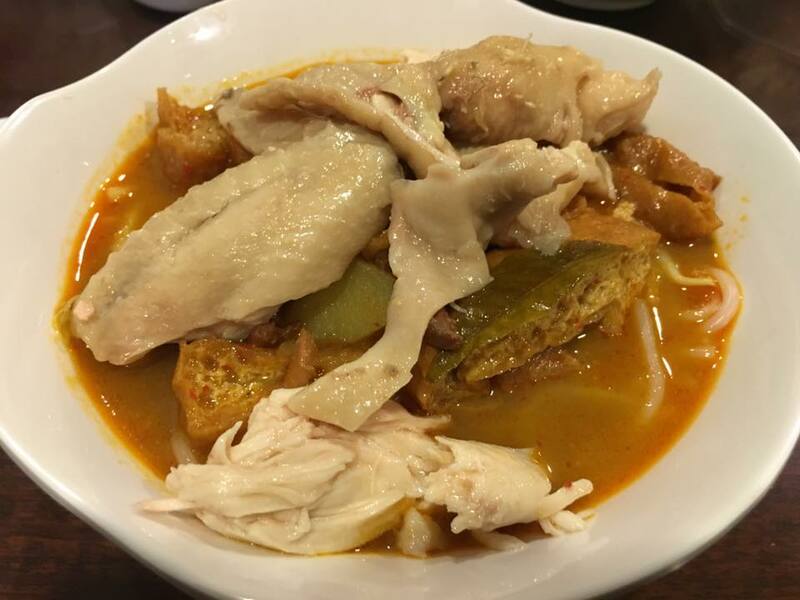 but it di dnot feel as shiok as the usual firmer texture we are accustomed to. 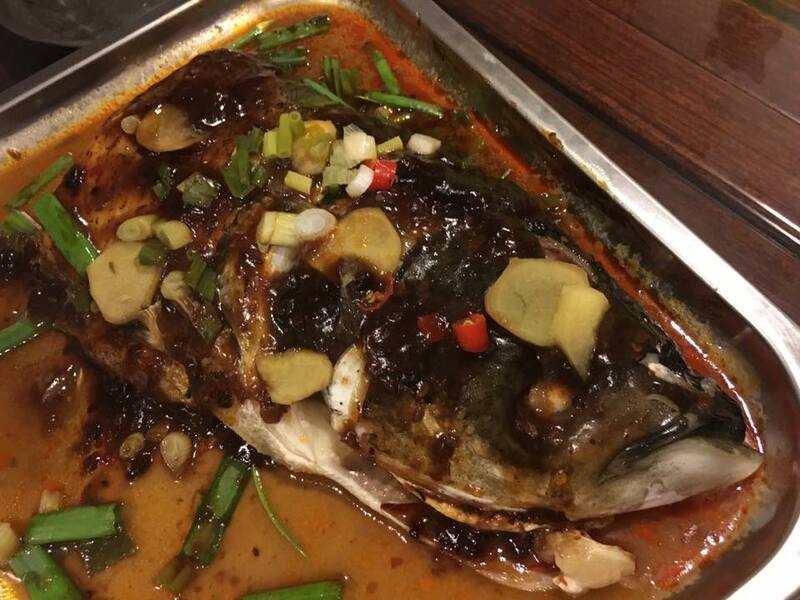 i am guessing it was because i put the paste on the fish head earlier like >2 hrs waiting for my sis to come. next time i will only add the paste at the time of steaming. of course i have done this 红烧method many times. 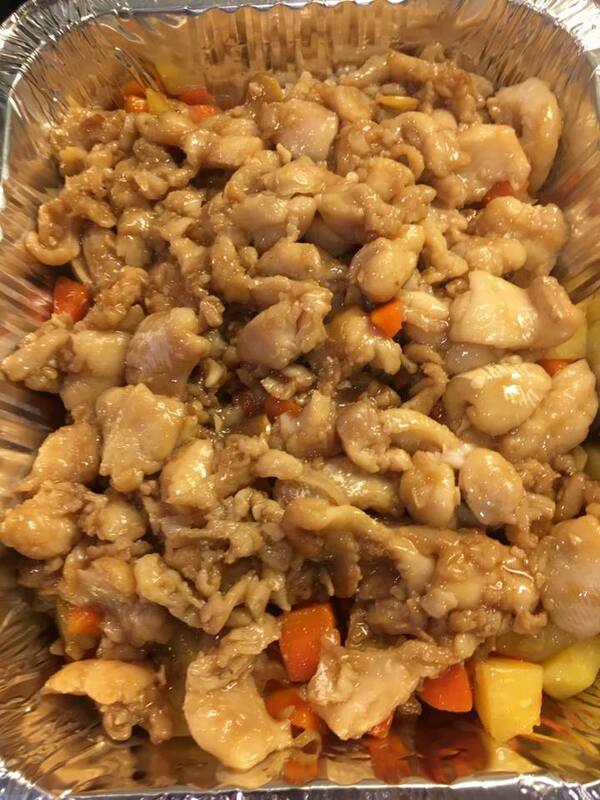 basically teriyaki is 红烧. 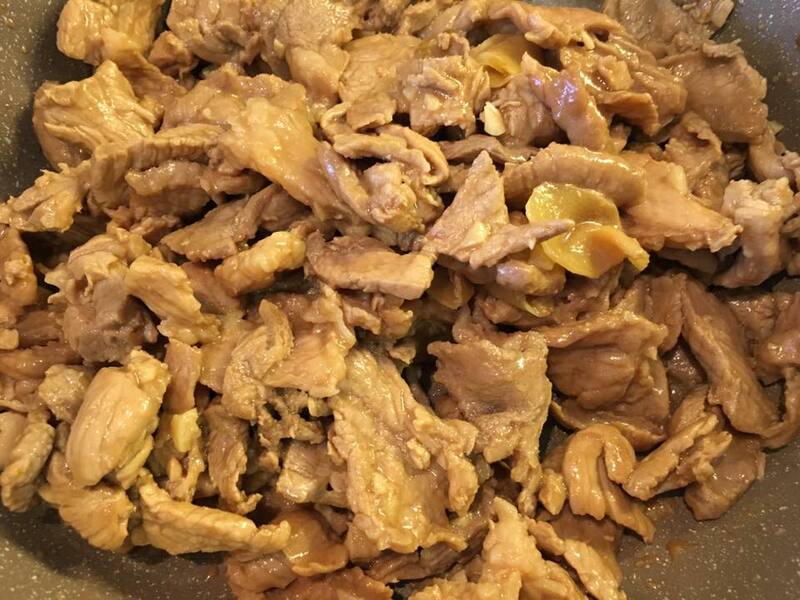 any dish you add a marinade or braising sauce & let it cook while the braising sauce reduced is 红烧 la. 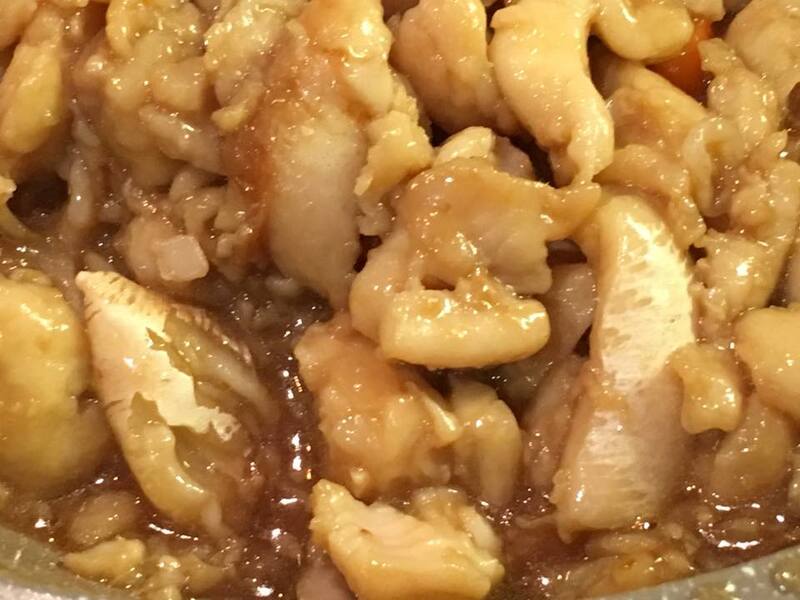 in the case of (say) teriyaki sutchi fillet, you let it reduced to almost dry & caramelised the fish fillet. 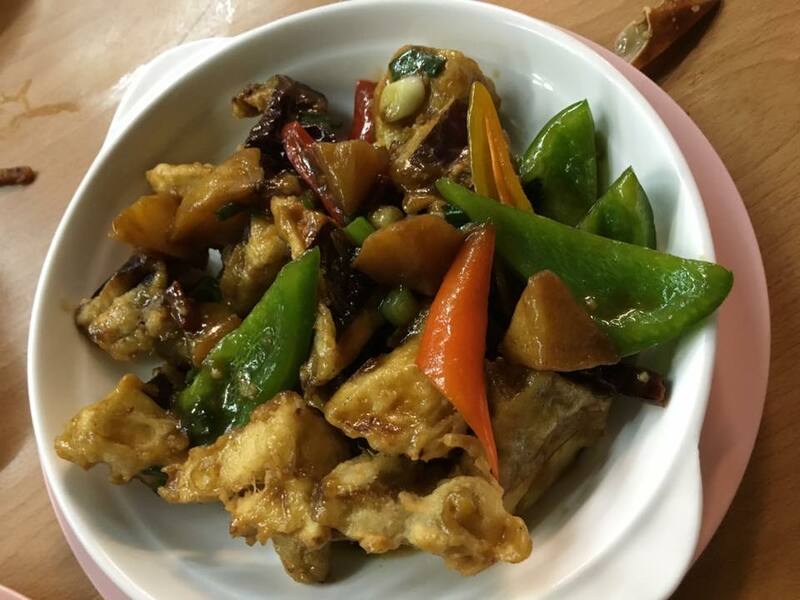 for this evening’s braised mandarin fish 红烧桂鱼, i made slices on the fish, dusted a bit of corn flour & fried the fish first. 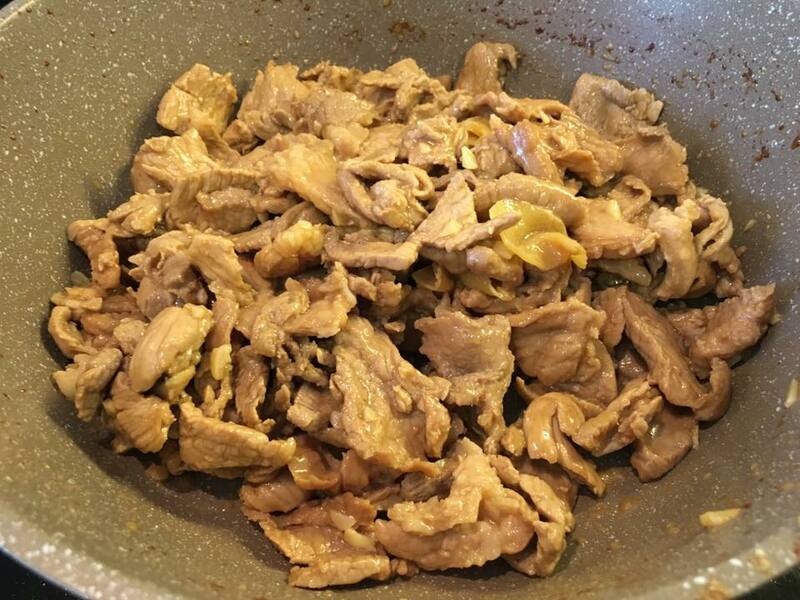 this method we say 半煎煮i have not done myself before, so just read up a few online recipes. the fish was pretty nice. great tasting sauce, good, fresh fish (after 6 months in freezer), great texture. 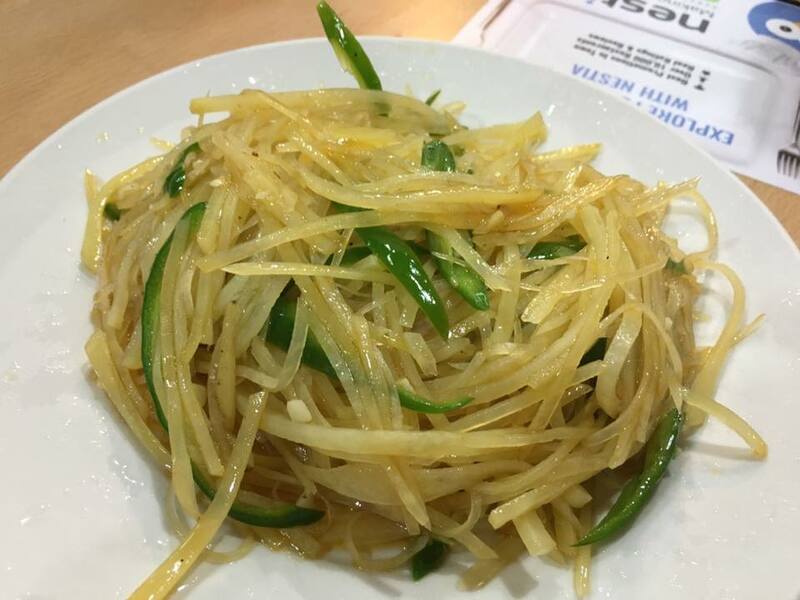 quite nice overall, but not quite the best 红烧 dish i have tried. need to experiment a bit more. 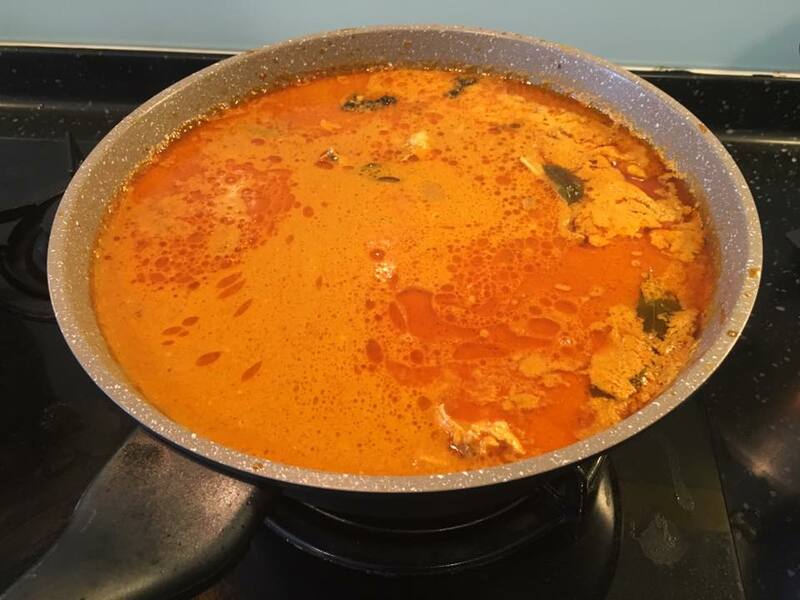 will also ry adding some tomato sauce & also tomatoes, green peppers & red chillies. 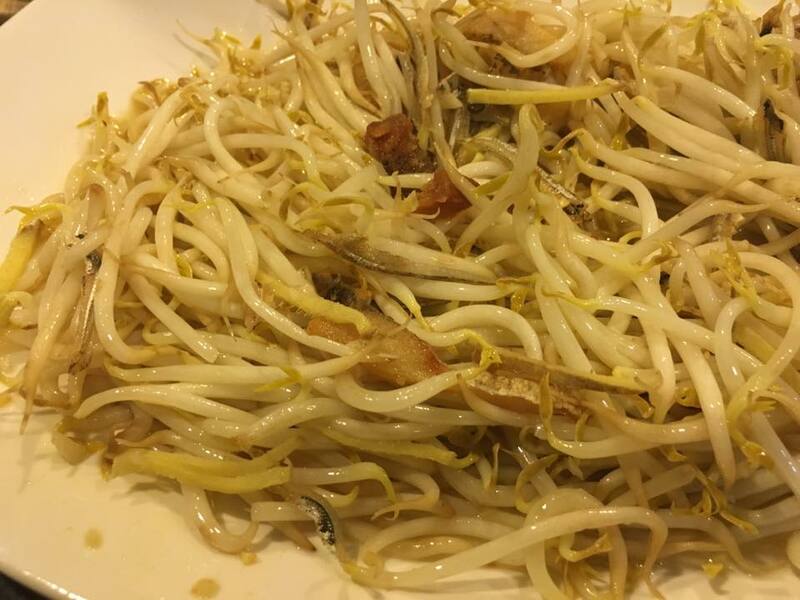 sis’ salted fish bean sprouts was nice. 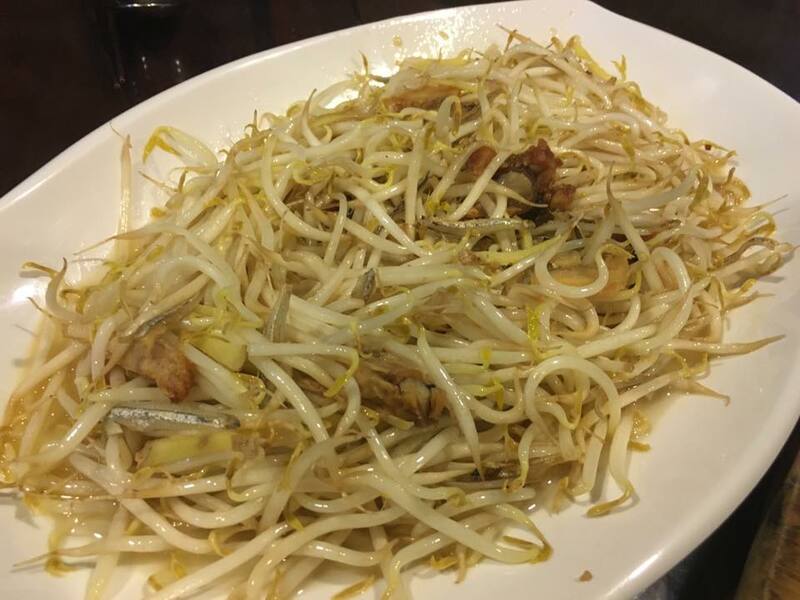 bean sprouts were crunchy & the salted fish very tasty. good stuff! 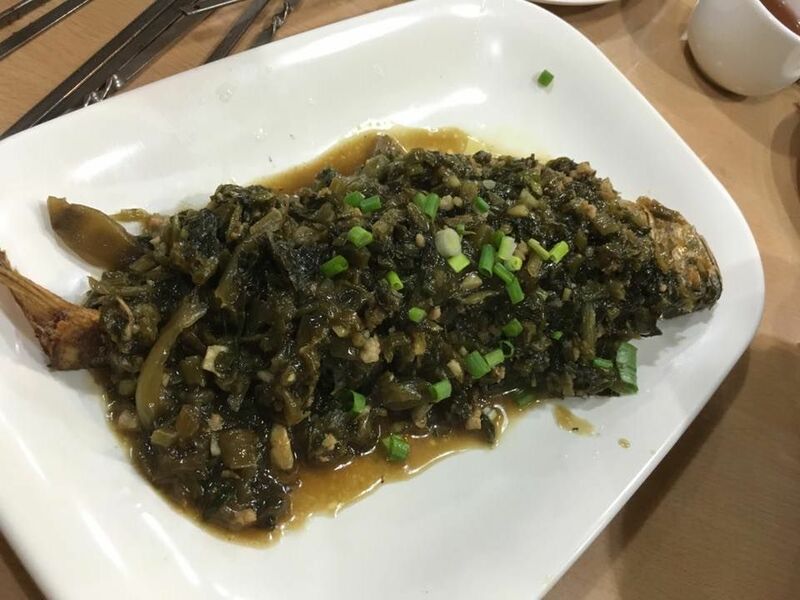 our relatives in china sent us sent ti por (dry flat fish). 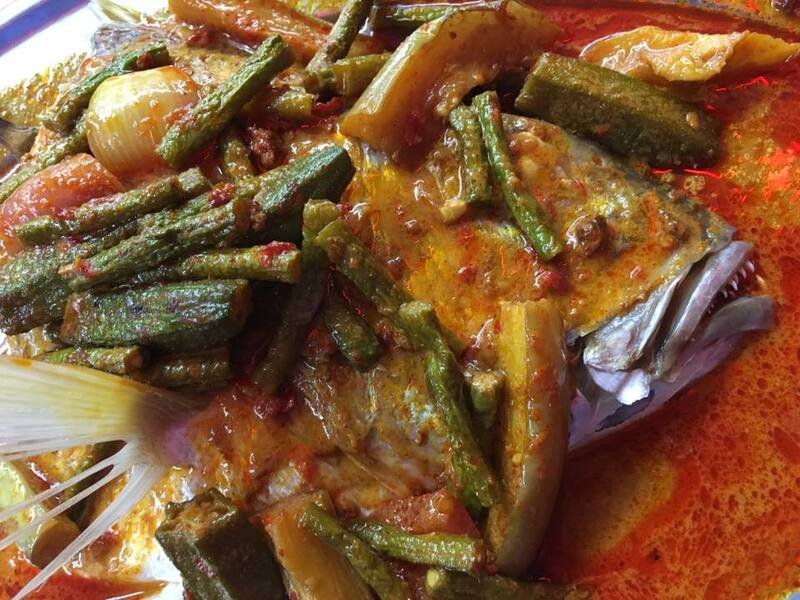 it is of course very good for soup, fih head steamboat, frying vegetables & even bakchormee. 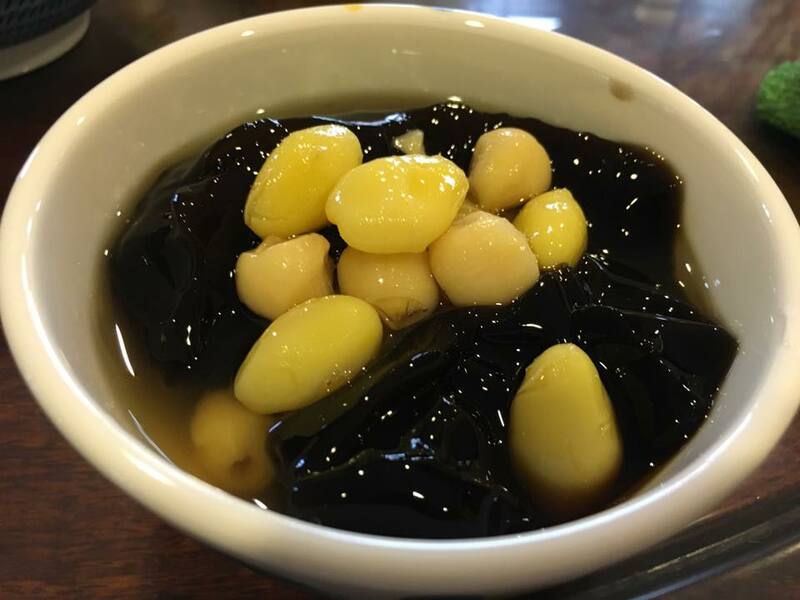 for us though we were nostalgic of the dark soy sauce ti por which our mom did 50 years ago. my sis tried steaming it for like 50mins the last time. but it was still very tough & hard. 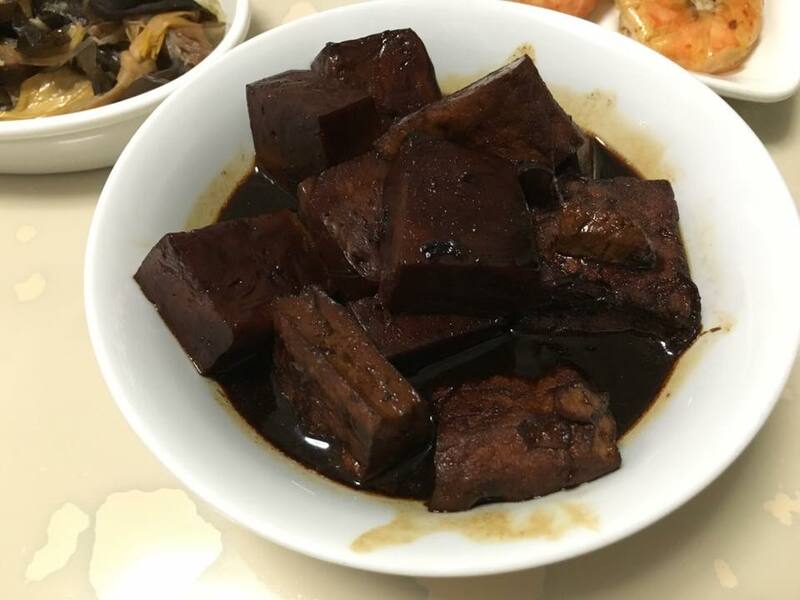 so i boiled it instead for like 45mins to 1 hr, and then basically reduced it just like 红烧 till very little liquid was left then added 1 tbsp datk soy sauce. i made curry chicken noodles. 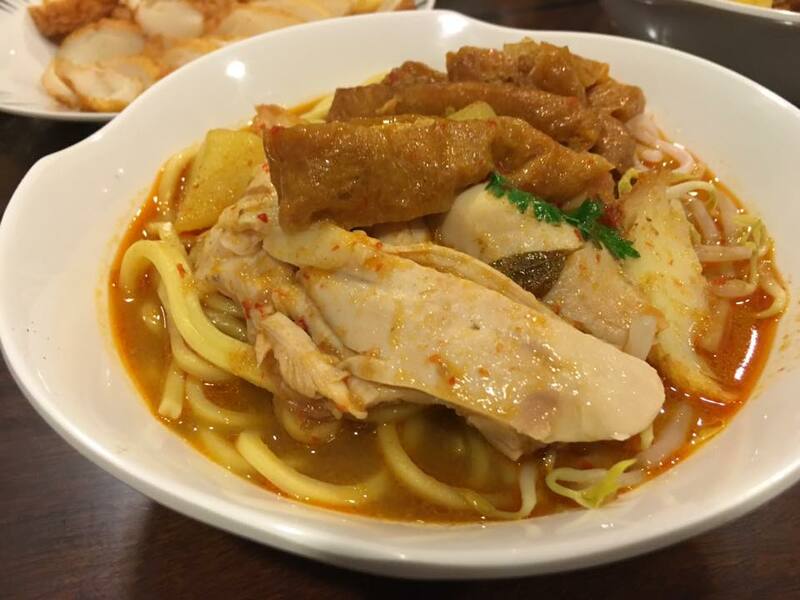 shiok home lunch for 9pax friends on 9.3.2015.
the curry chicken noodles were good on both counts. i guess they were served in very small amounts with more of other dishes provided. 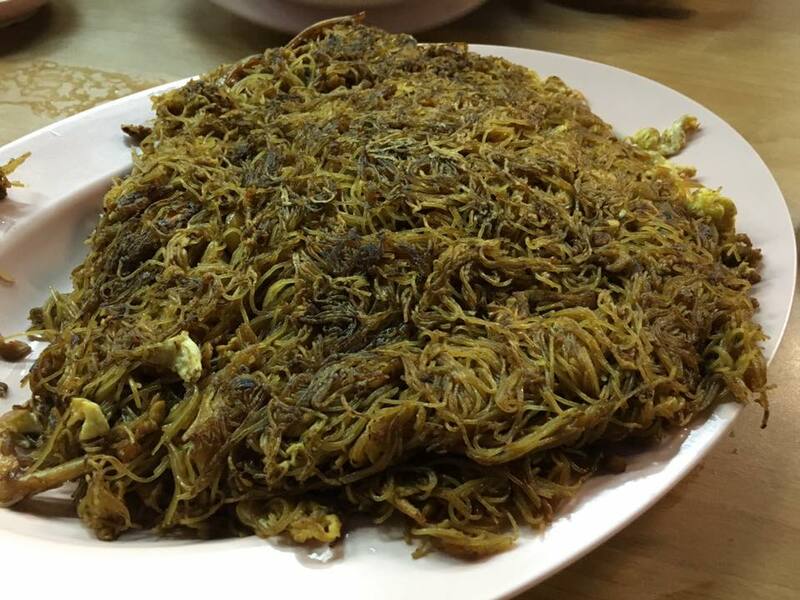 for this evening, i also had braised duck, egg taupok tau kua, tau you bak, fried leeks. 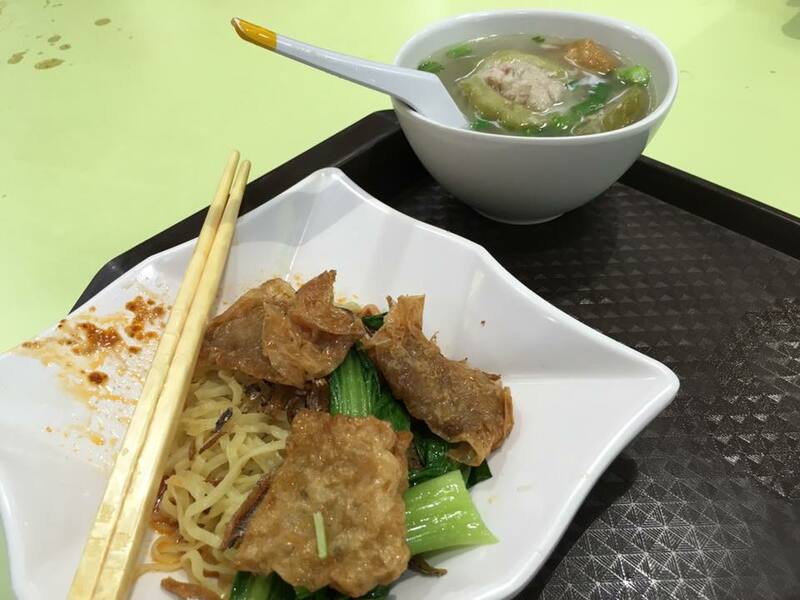 chicken & duck were good but noodles a bit disappointing, not enough soup & not spicy & tasty enough. taupok & egg good, tau kua ok, tau you bak quite good when i took some leftovers, but last evening some parts skin were tough. i used 18 dry chilli..nearly double c/w my usual nonya curry chicken..this though is like a soup NOT gravy so quantity is more than 2x usual probably 3x (my usual gravy)..i used bones from 3 chicken as stock..the soup was actually very tasty though (still) not spicy..however when noodles added taste much diluted..actually the taupok though infused & tasty seemed to take away & dilute the taste of the soup oso…so looks like got to have double the amount of soup or 1/2 the amount of noodles in order to get the taste right. braised duck was good this evening. 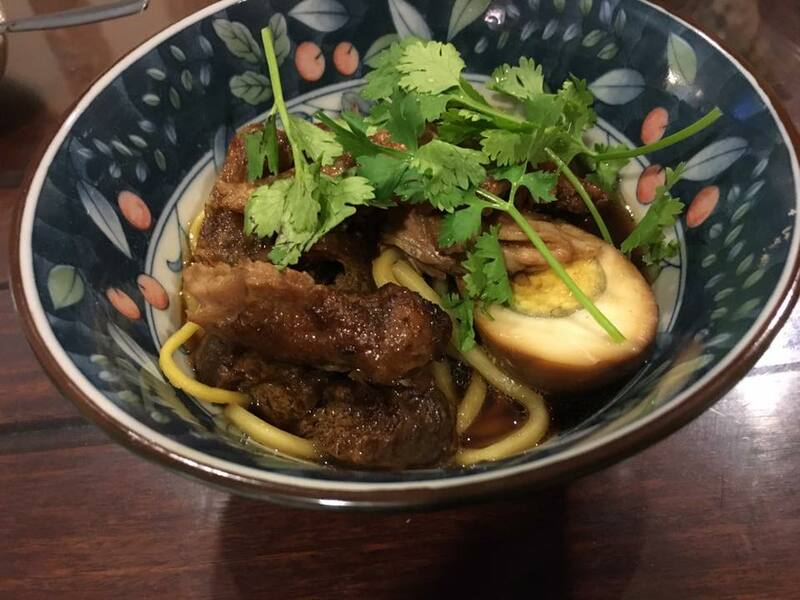 i took out some noodles from the curry chicken noodle bowls & served 2 bowls of duck noodles to 2 friends. 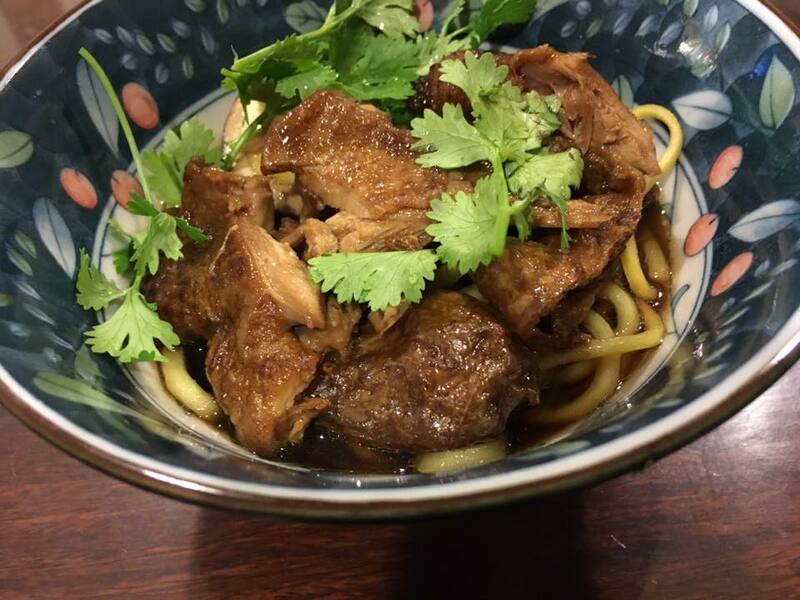 i think duck noodles were very good. 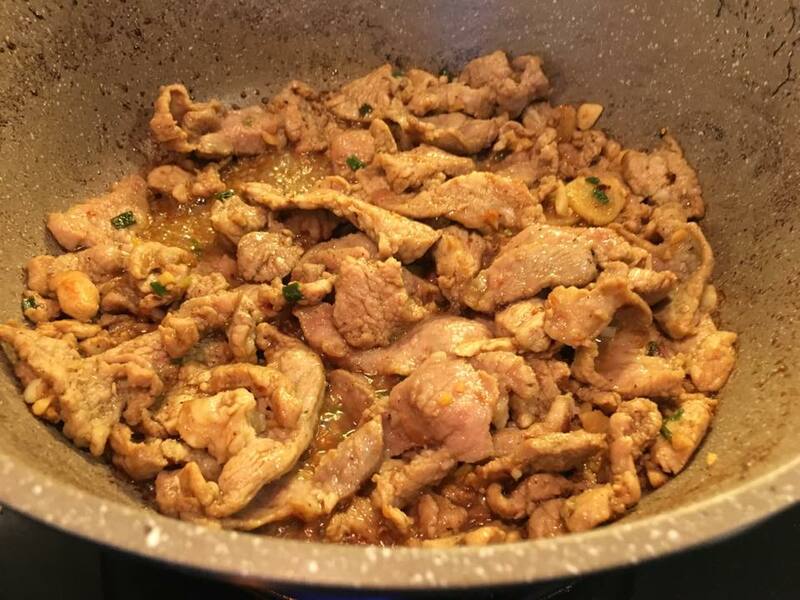 i just used ready made Tai Wah chicken marinate (大华鲁鸡汁) to braise the duck. 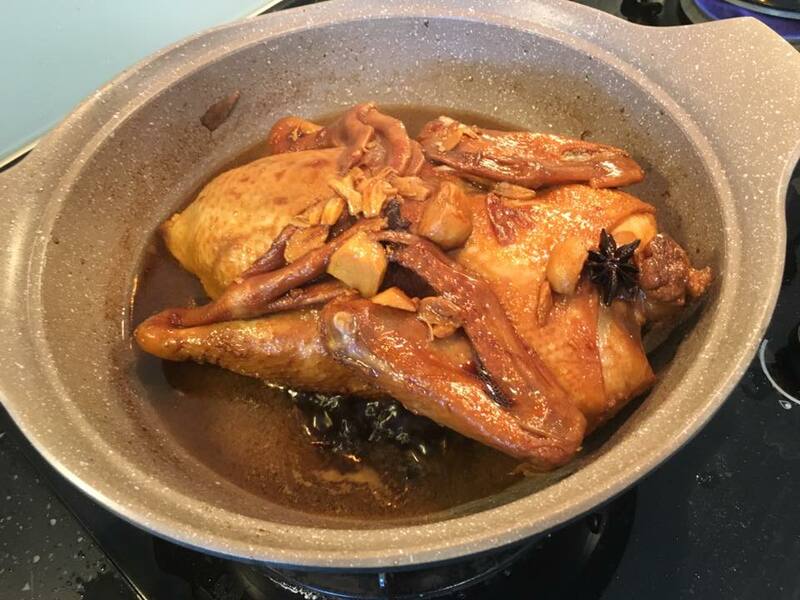 so just need to rub the duck inside & outside with 2 tbsp sugar, add whole bulb of peeled garlic plus cut ginger, cover & baste the duck (about 2kg from giant) for 1hr 10mins. 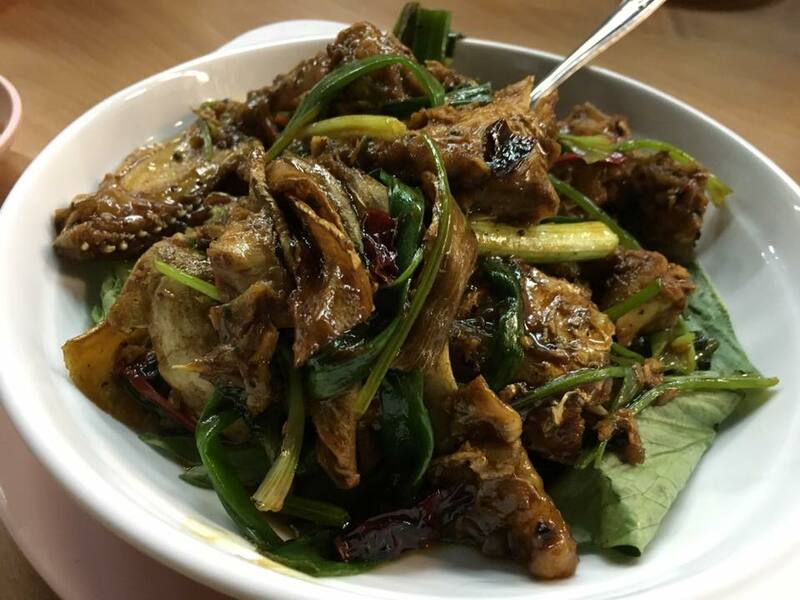 duck was tender & flavourful (the lor was very “pang”). & i used that to make the lor nerng-braised egg and tau kua. lastly cooked the taupok strips & placed over the tau kua. 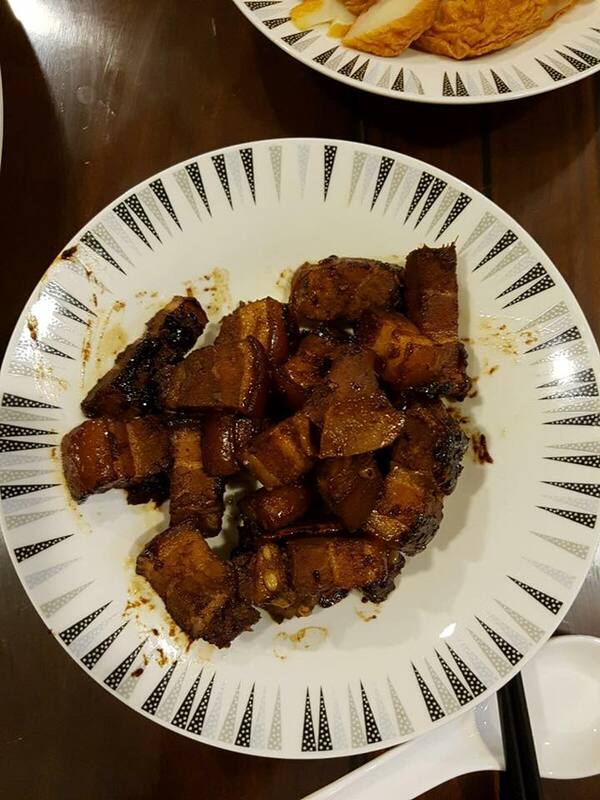 tau pok was well infused & very tasty. for tau kua i think they need to be taken with some sauce, so i should add more sauce when serving next time. 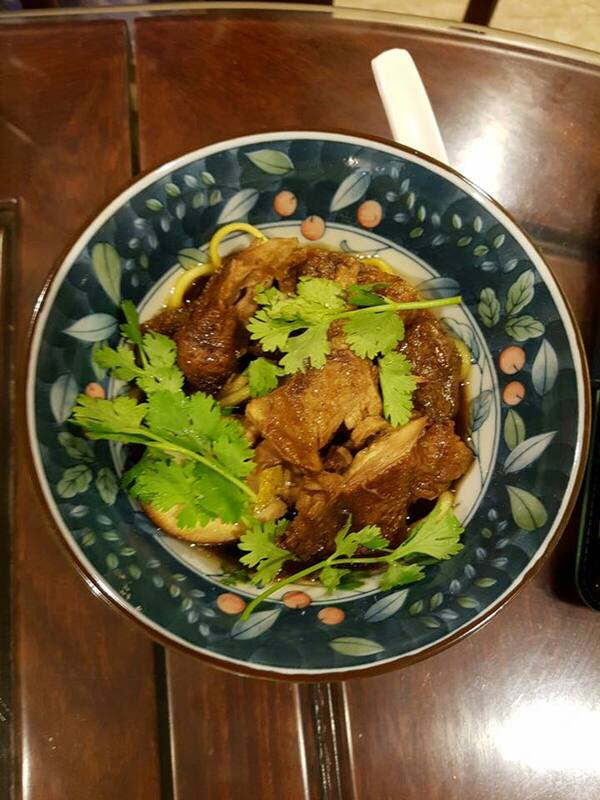 i used some of the sauce to make 2 bowls of duck noodles. so basically the trick is to add enough soup for the noodles so taste would not be diluted=either more soup or more achievable, less noodles. tau you bak today also not ideal. 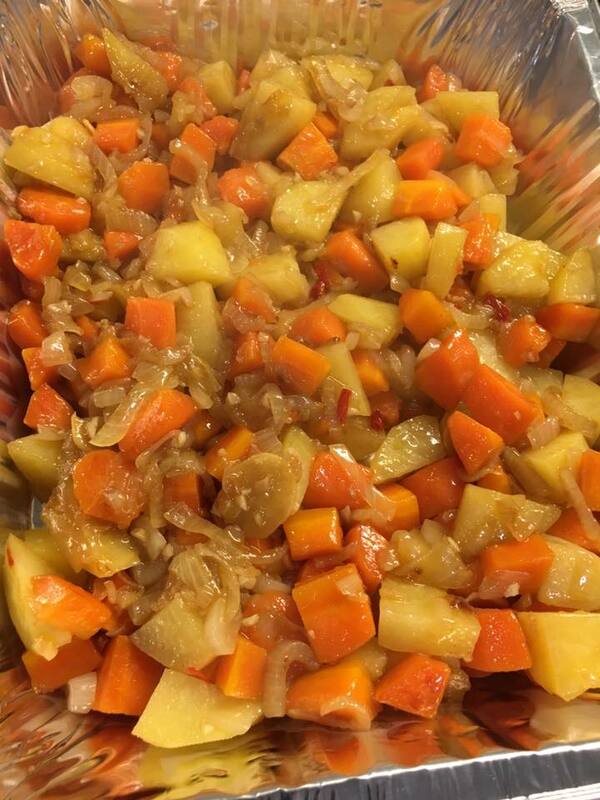 though i have made i knew were excellent very tender tau you bak in large quantities for teban gardens & also bread of life community meals, today one piece i tried the skin was tough. though i had 2 pieces the next day & they were all good & tender. chicken as usual was good. i added a bit of tumeric to make it look yellow. 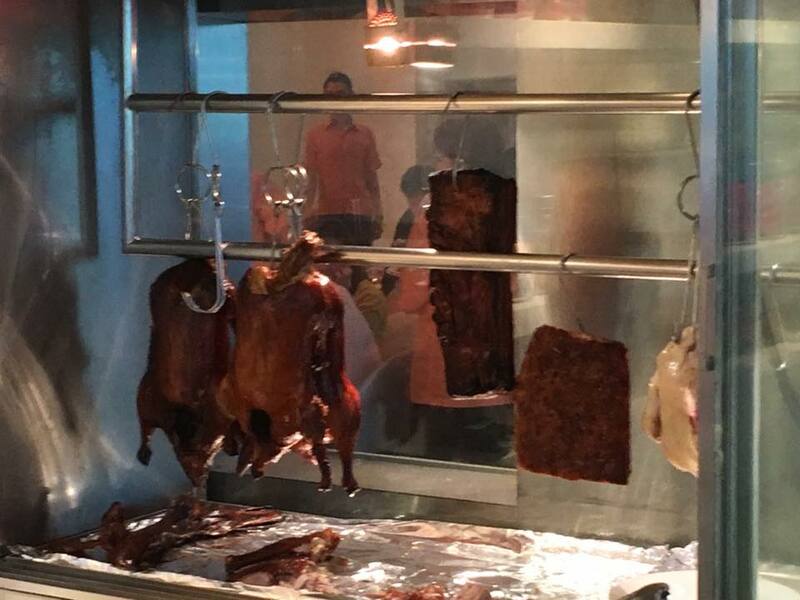 this what the hk chefs did for the 黄姜鸡 say at crystal jade kitchen. & plated it for adding onto the curry chicken noodles. 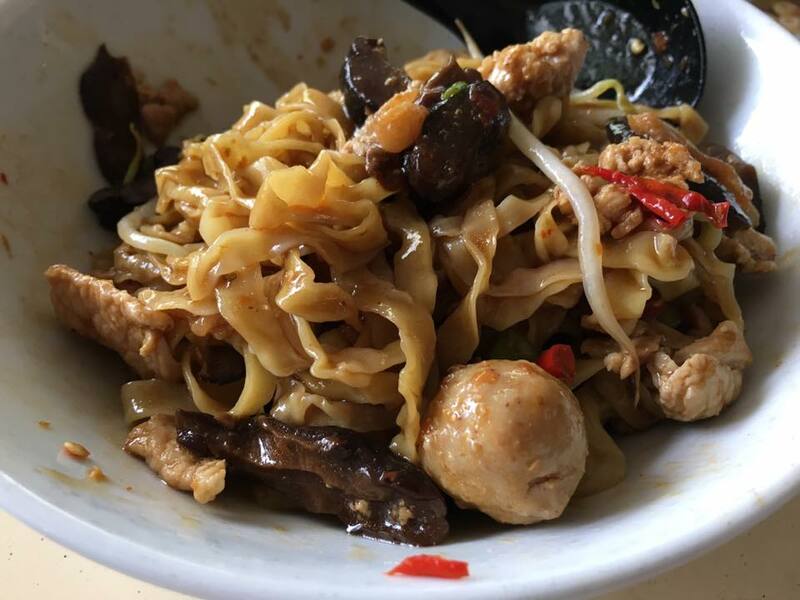 as shared earlier, i had 18 pieces of dry chilli (& 300ml coconut milk), so colour was good, but still not spicy so i will have to add chilli padi next time. 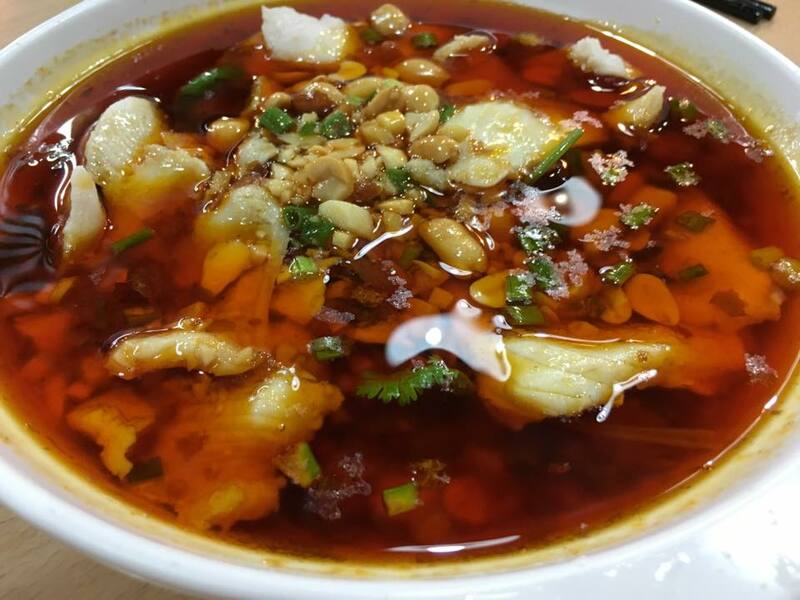 the soup was actually very tasty, but because there were not enough for the noodles, it became quite ordinary. this part need to manage & i will have to reduce noodles to 1/2 or 1/3 for serving in future. 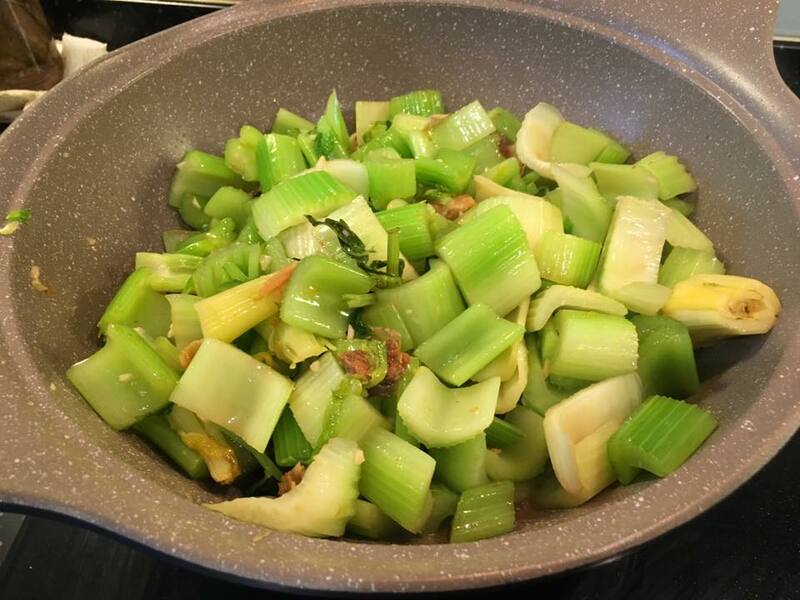 it is difficult for me to make more soup. it was not really a bad noodles. 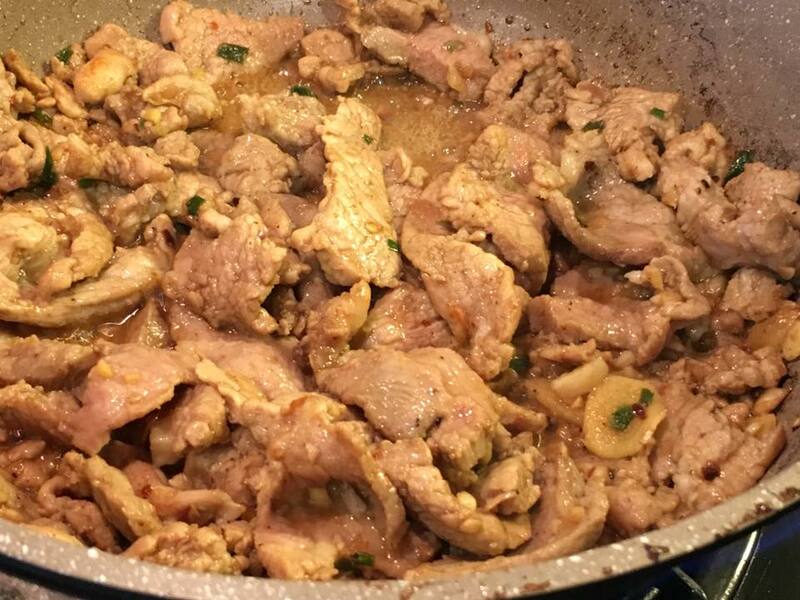 but i was not worth the effort, & boiling the bones of 3 chicken for like 15hrs over 2 days. my friends brought many things. one brought 2 pomelos & very nice spanish melo (from australia??). 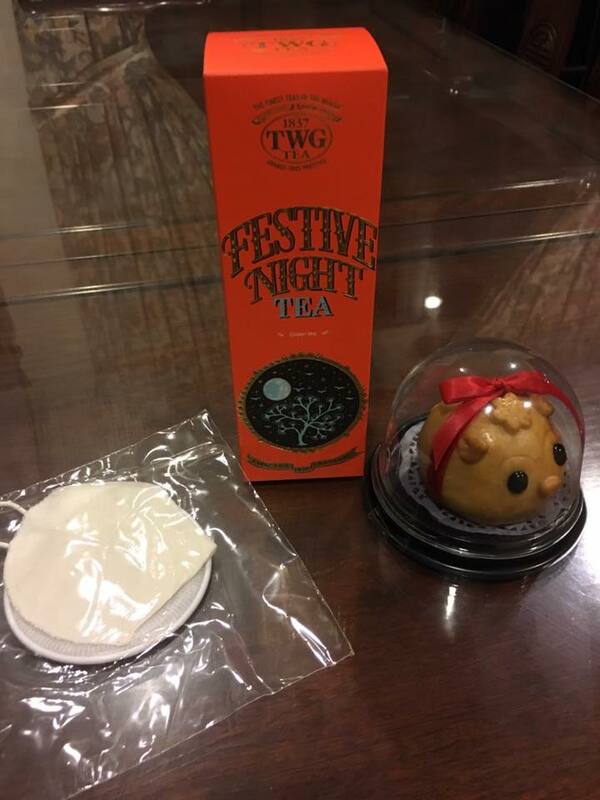 & another the tea & cutie mooncake (above photo). we had karaoke afterwards just connecting the pc youtube to tv. had lots of fun. 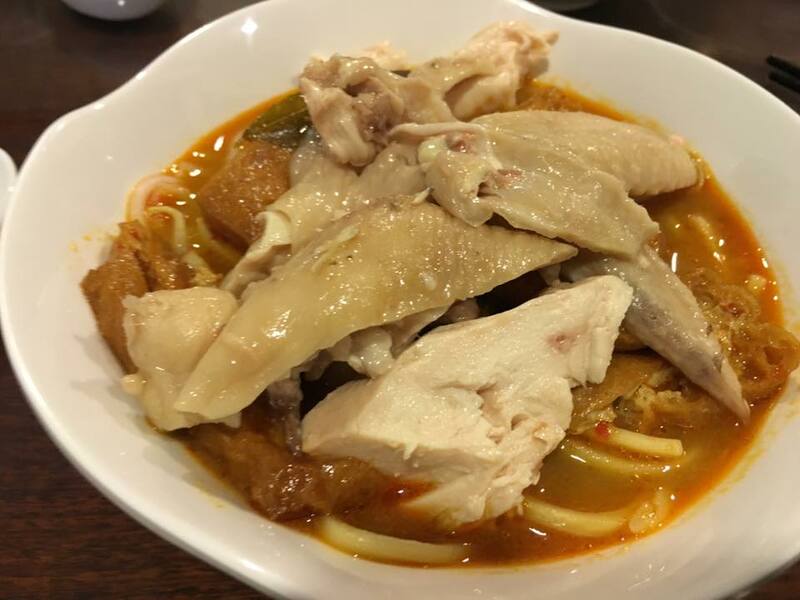 curry chicken noodles not to my satisfaction, but overall still great fun to get together with good friends & primary school classmates of 51 years from OPS. another unsuccessful attempt to have frog porridge at G7 sinma this evening. no parking lots, lots of cars. running out ideas where to go for light makan, then remembered i have groupon vouchers. 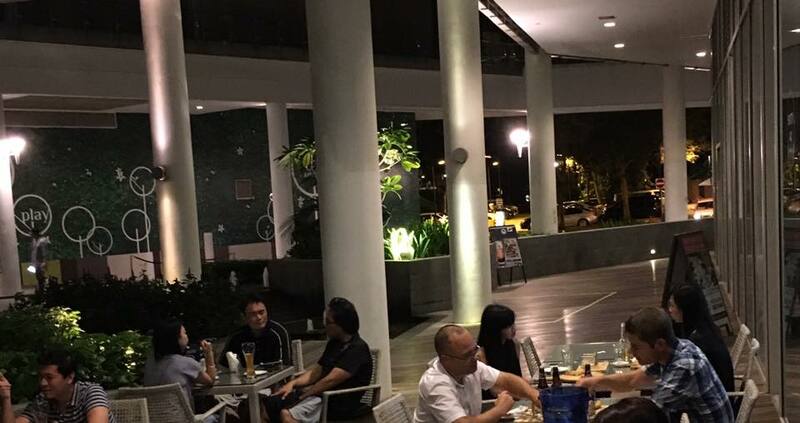 so called up & got an outside table for 2pax at sixty40 @ rochester mall on 16.9.2016. ^^. groupon voucher for 2pax entitled us to 2 alcoholic drinks, but not cocktails. i got a ballantine whisky & wife got a white wine. both are lousy, quite expected for the groupon price la. 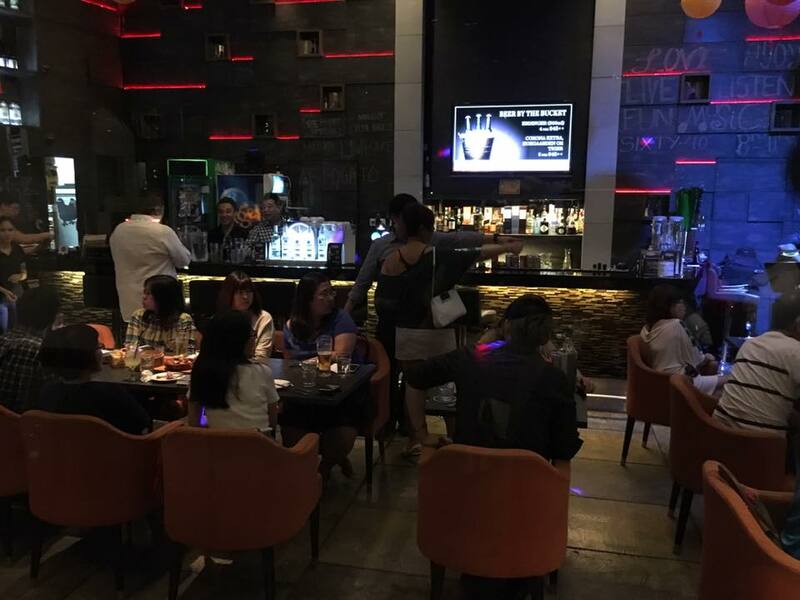 place has nice ambience, both inside & outside. there is life music wednesday to saturday. it was more fun to sit outside. we ordered 3 tapas for the applicable menu. 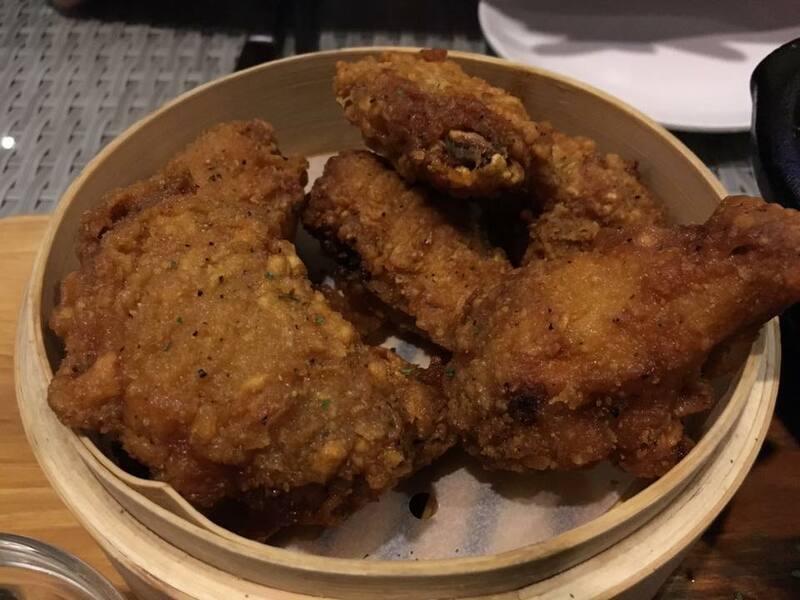 chicken drumlets were good, good flavour, wings still juicy, nice vinegar dip. we also asked for chilli. 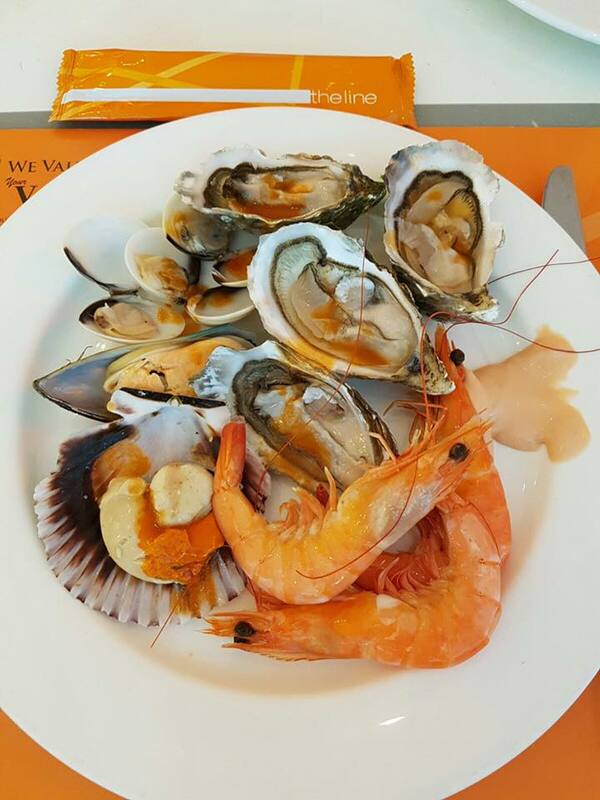 they had the cheap local mussels which was tough not so succulent. but soup was great. so preparation ok good standard just the ingredients not the good mussels. 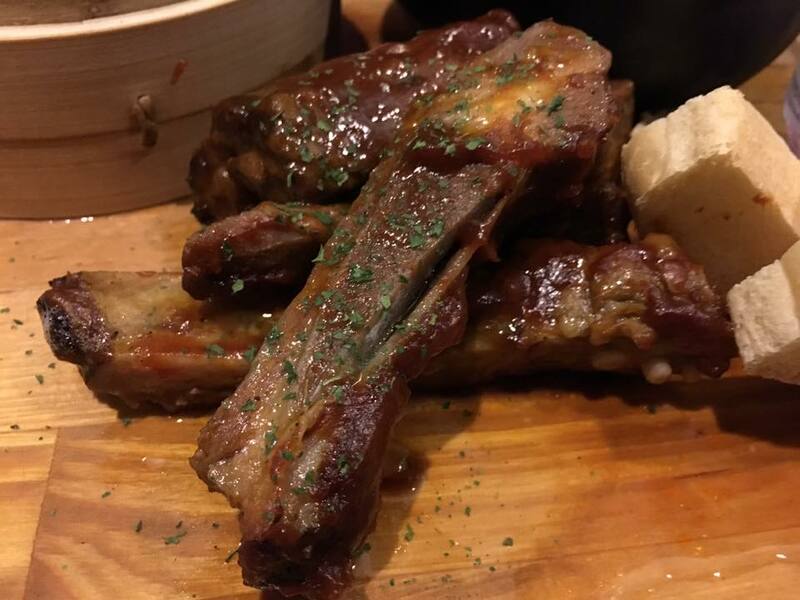 don’t know if i can make this pork ribs. i think louisiana. pork rib was tender & very tasty, smokey flavours. 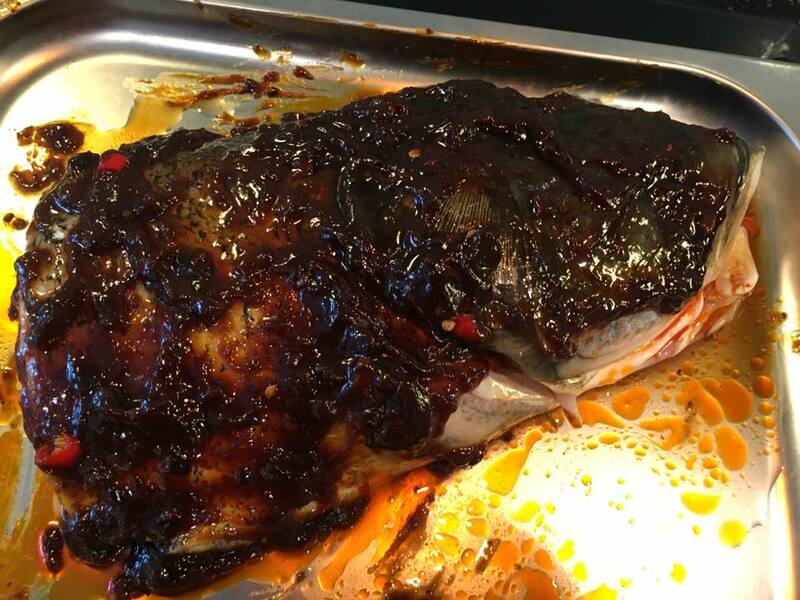 not sure if it was just marinade or because of using a smoker or bbq. 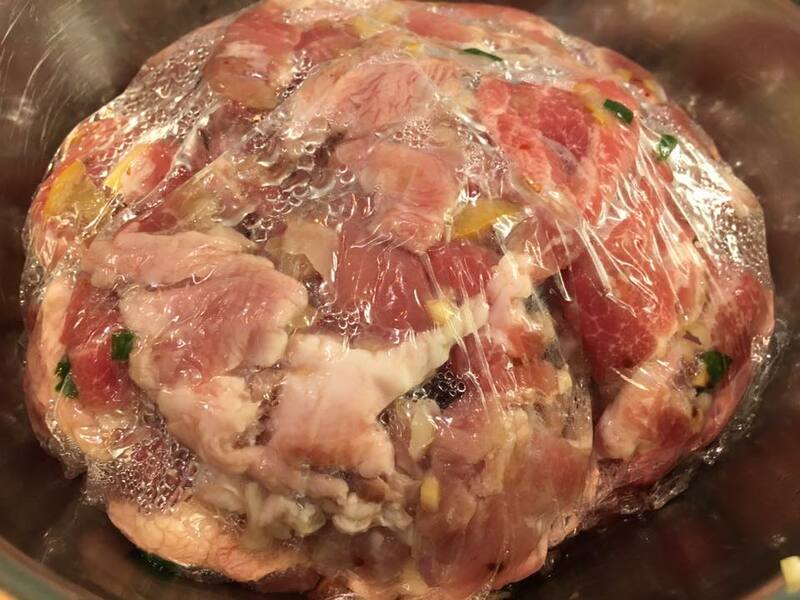 i can experiment the marinade & recipes but not do the smoking. 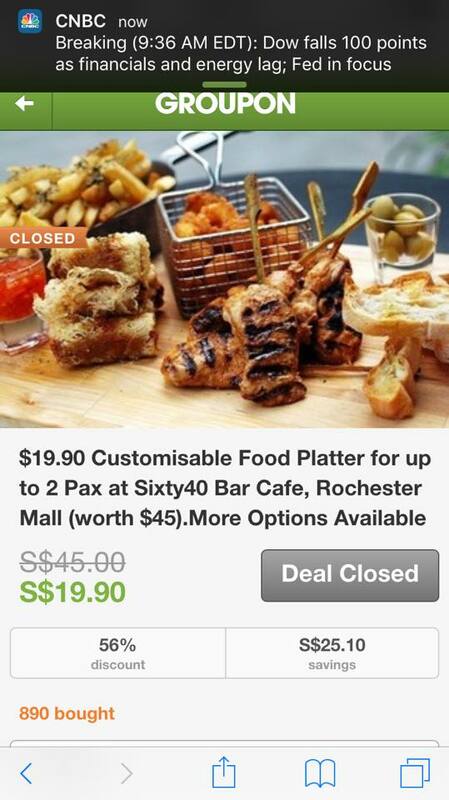 groupon deal was quite genuine = S$19.90 for 3 tapas, which would have cost up to S$40++. what i bought included 2 drinks for S$10 more at S$29.90. 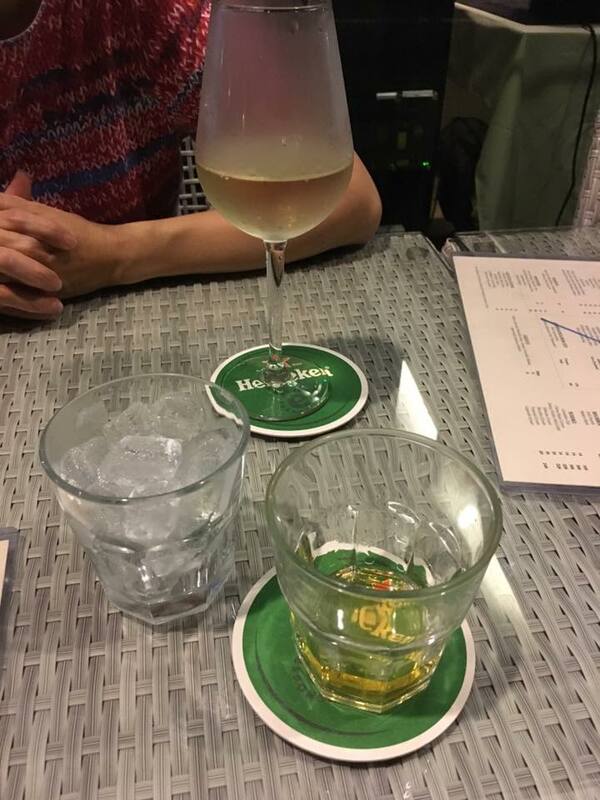 & we had the whisky & white wine at S$12 & S$11 outside happy hours (we were at at 8.45pm). the deal expired now but guess it will come back. won’t mind having it again. 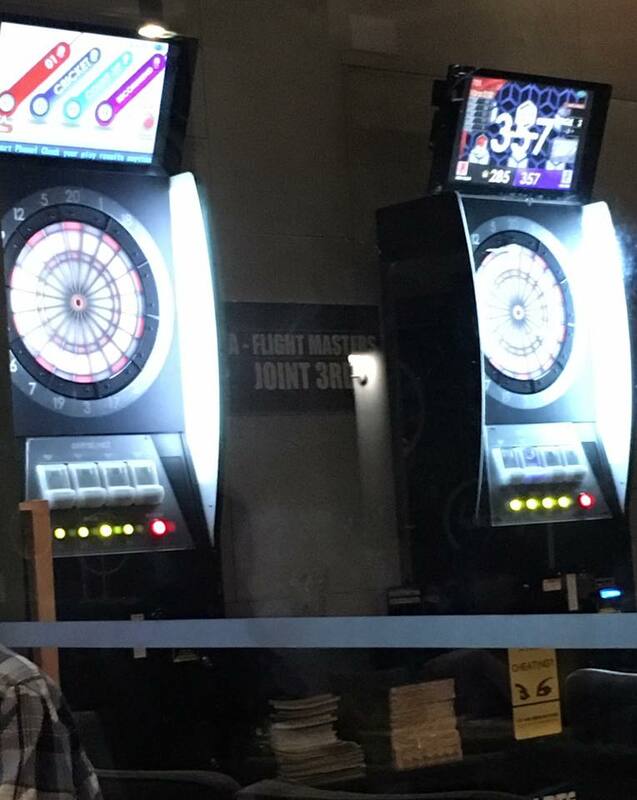 they have dart boards inside. some people were playing. & nice ambience at the tables outside. bar food not exactly my most preferred. but i quite enjoyed this evening. 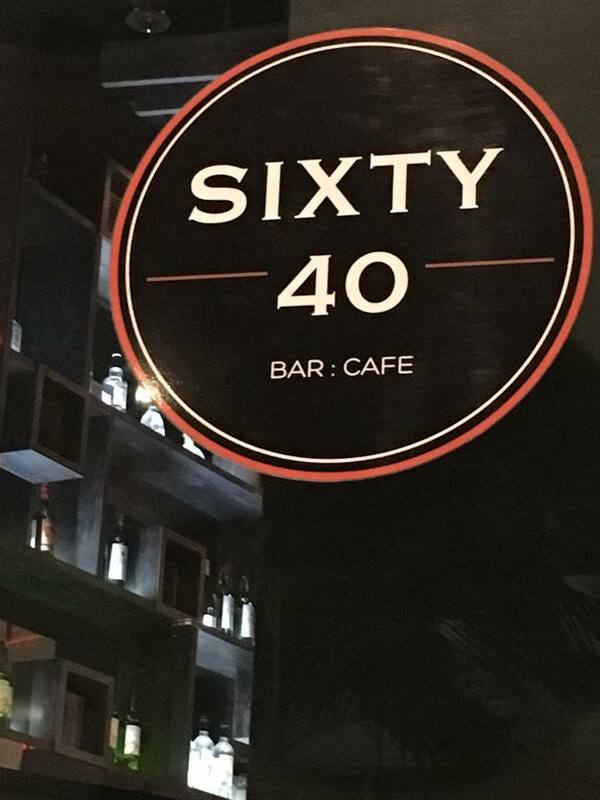 good tasty food with wonderful ambience. 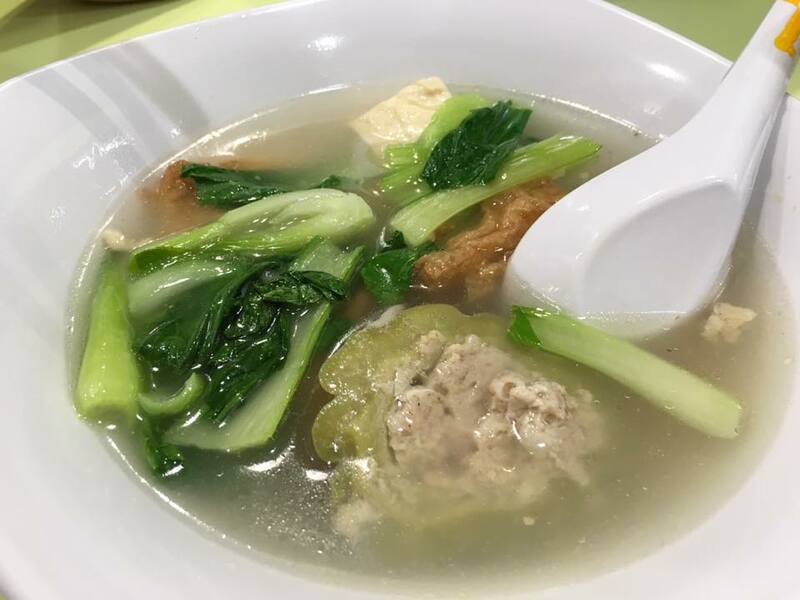 was looking forward to this, especially after the below par, actually quite disappointing seng kee bak chor mee at serangoon gardens yesterday! we arrived about 10.30am. there is not much queue, just 2 pax before us. 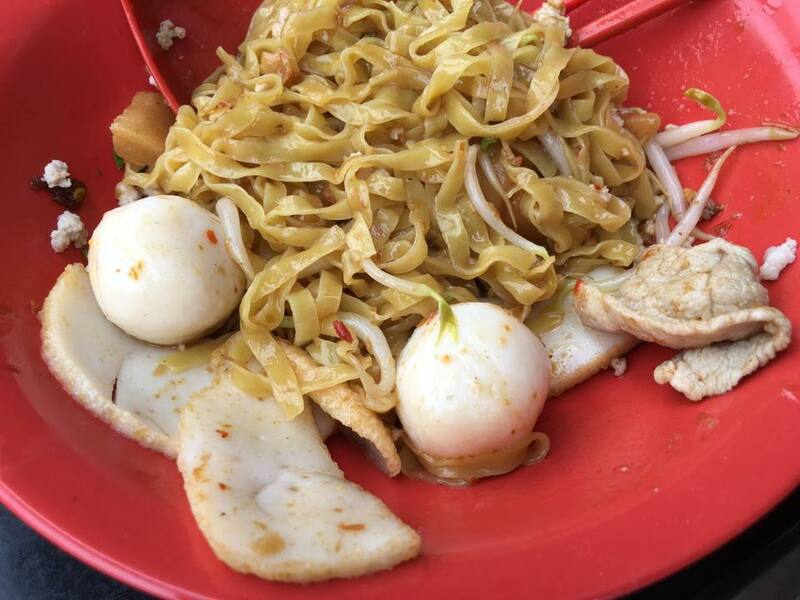 the mee pok was qq, quite perfect (unlike the quite unacceptable soggy mee pok i had at seng kee yesterday). 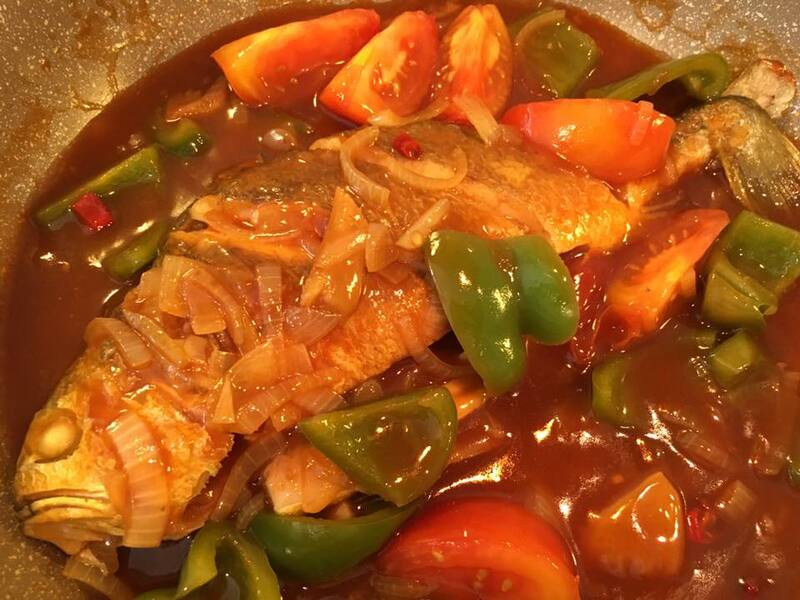 the chilli sauce over taste was very good, just not spicy enuf, not enuf kick for me,i took some chilli paste from them but that was not enuf, so i added a bit of chilli padi without the fish sauce. they also have the garlic sauce like what they used for ramen in japan, but i quite ok without that. 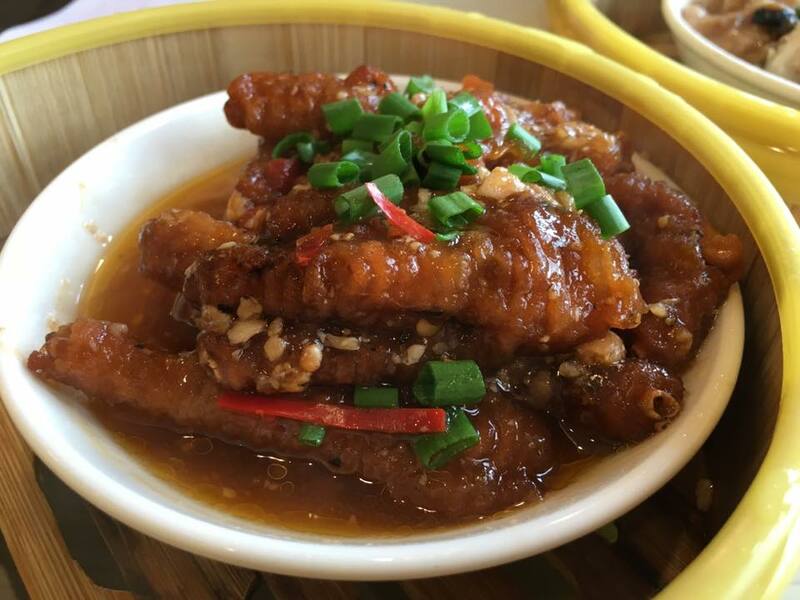 today i tried the ter kah braised pork trotters. 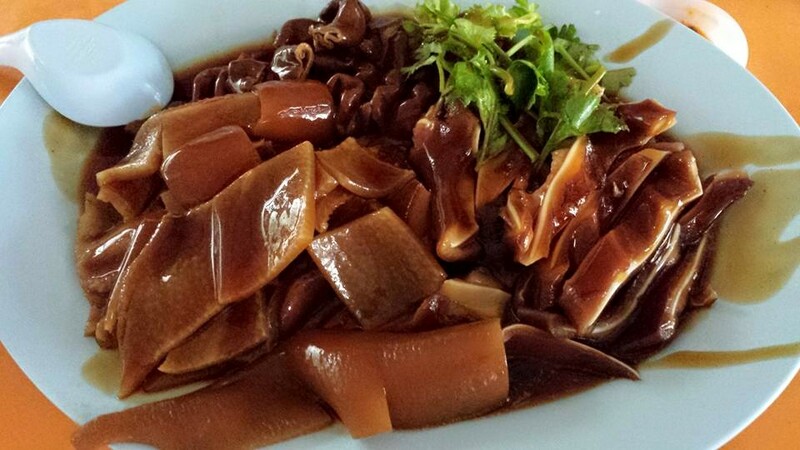 the skin gelatinous part texture ok. the mushroom sauce taste not my preferred style. 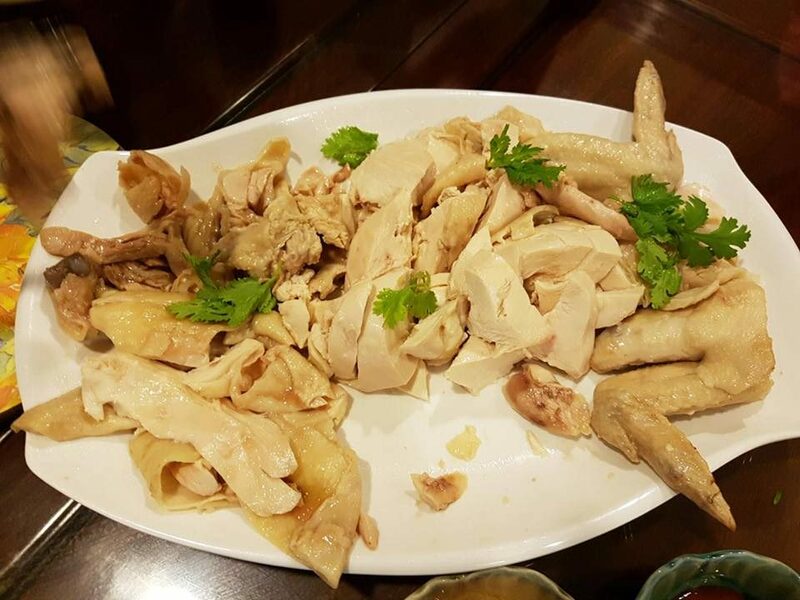 i liked both the common styles the lor 鲁 type seved in most bakuteh & other trotter stalls, and also the vinegared trotters. both are more “pang”. 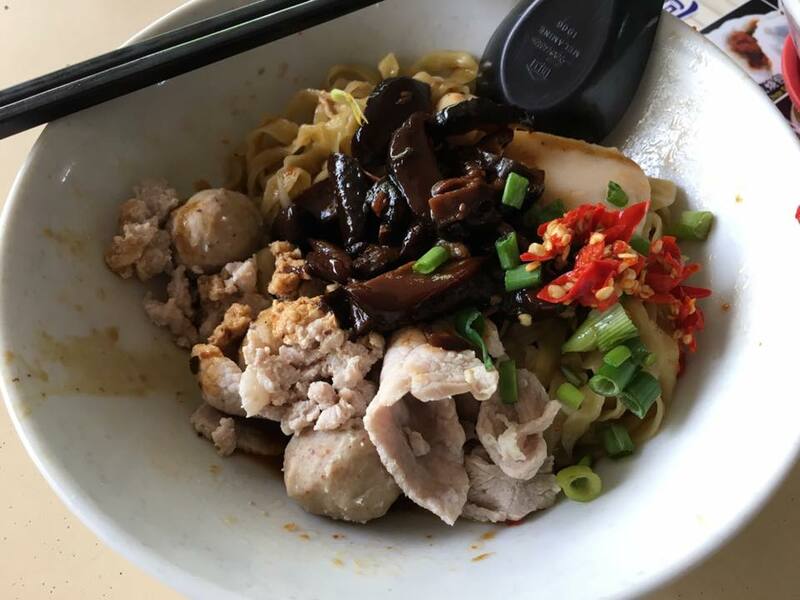 this one the sauce is just the similar mushroom sauce for the bakchormee. & i feel the texture of the lean part is not as good. this my 19th friday breakfast community meal at teban gardens community service centre. 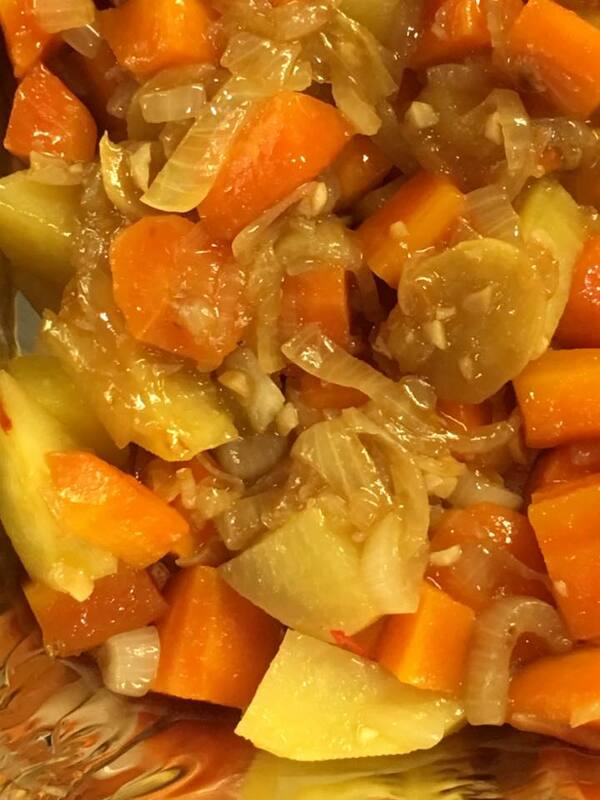 first onions & carrots. 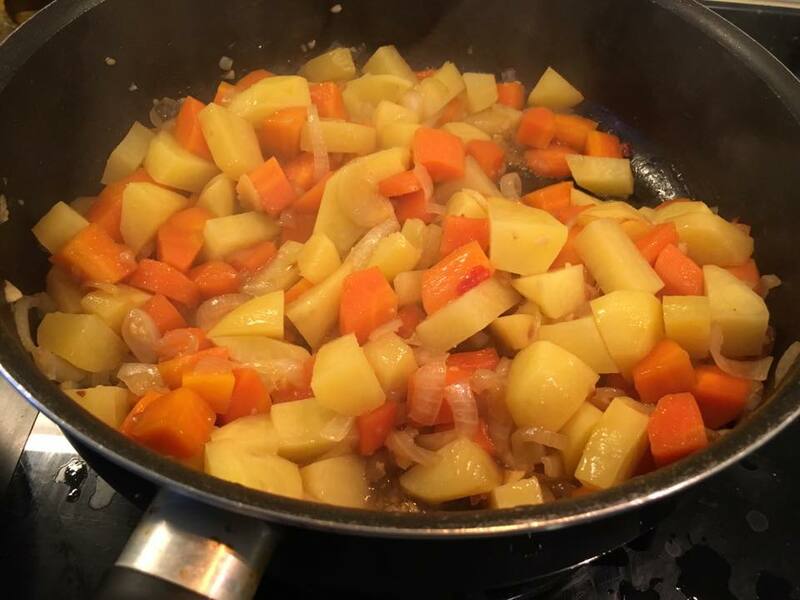 when softened, added potatoes. 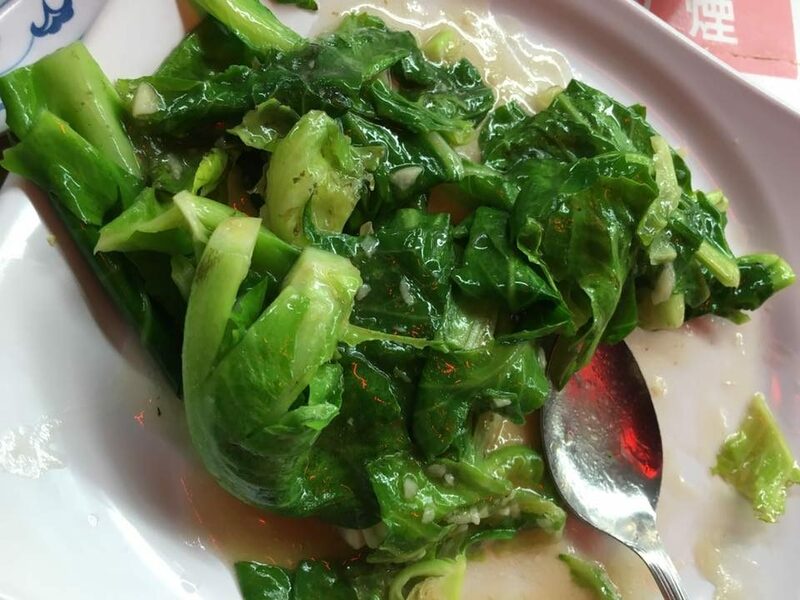 vegetable already very tasty. & making sure potatoes not overcooked. 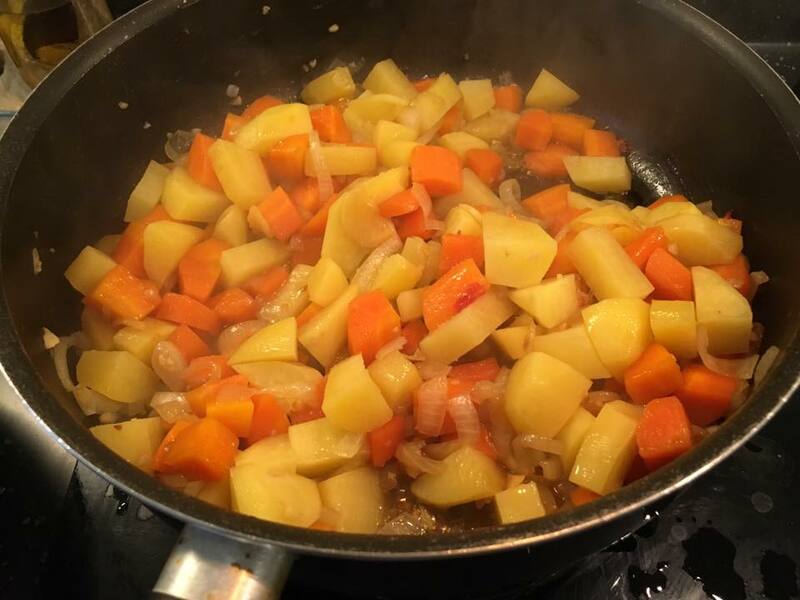 potato is cooked when ladle pressed on it & it separates. 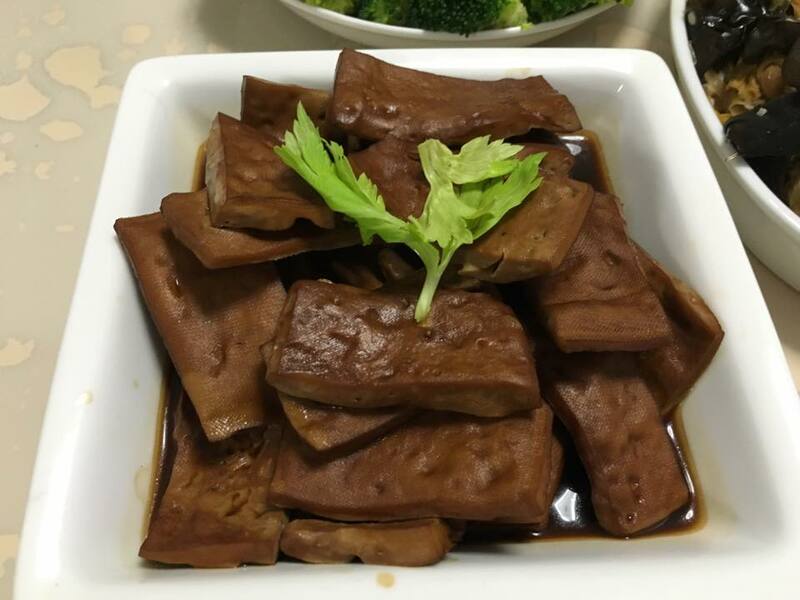 for红烧, i used 2.5 tbsp light soy sauce, 1 tbsp fragrant zhengjiang black vinegar, 2 tbsp shaoxing wine, 1/2 tbsp sugar, 1/2 tbsp sesame oil & 1 tbsp flat corn flour. coat filletwith corn flour first. 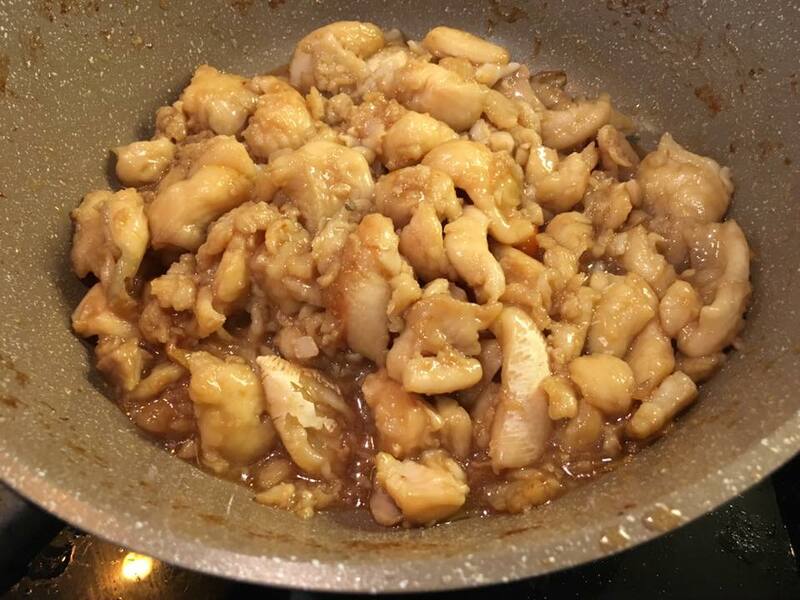 fry chooped garlic & sliced ginger till fragrant & beginning to brown. 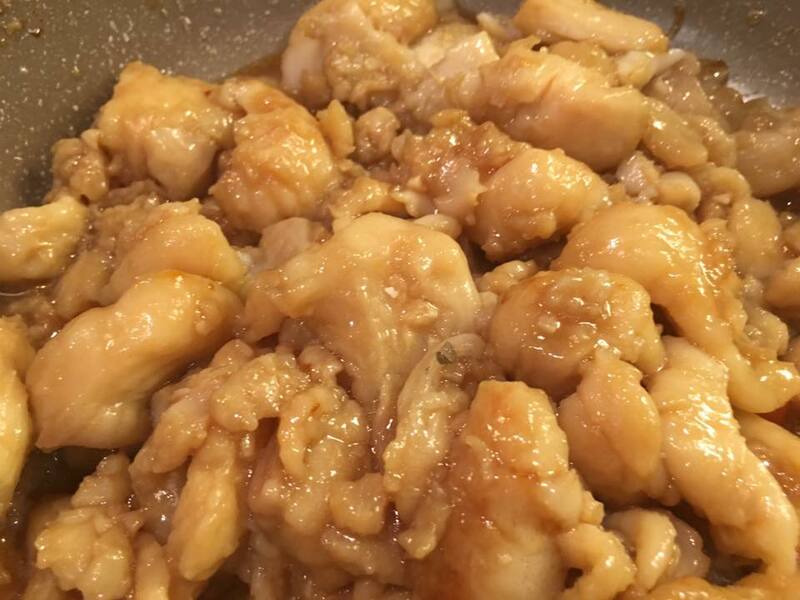 add sutchi fillet & fry short while, then add braising sauce & coat. i covered & cooked for 6 minutes, high fire & reduced. 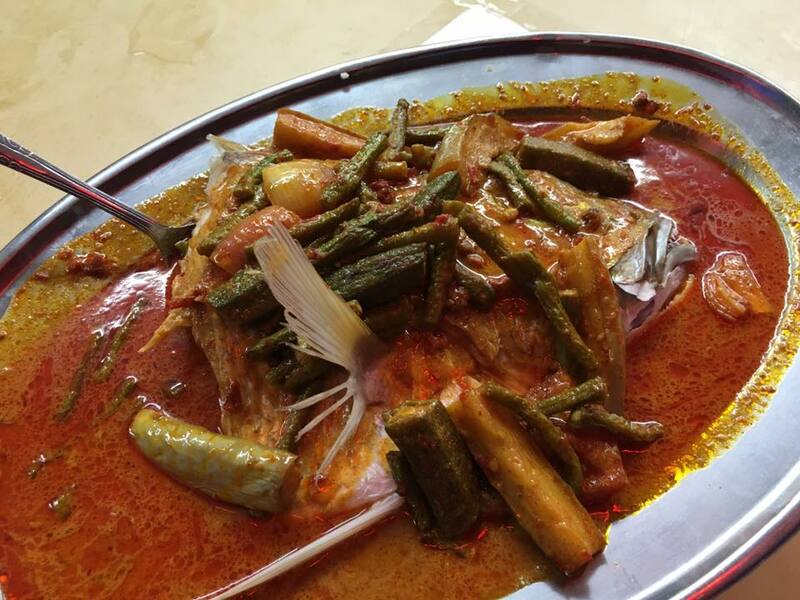 then i plated the vegetables in the aluminium tray & added the fish fillet on top. fish was very tasty & still bouncy not overcooked. 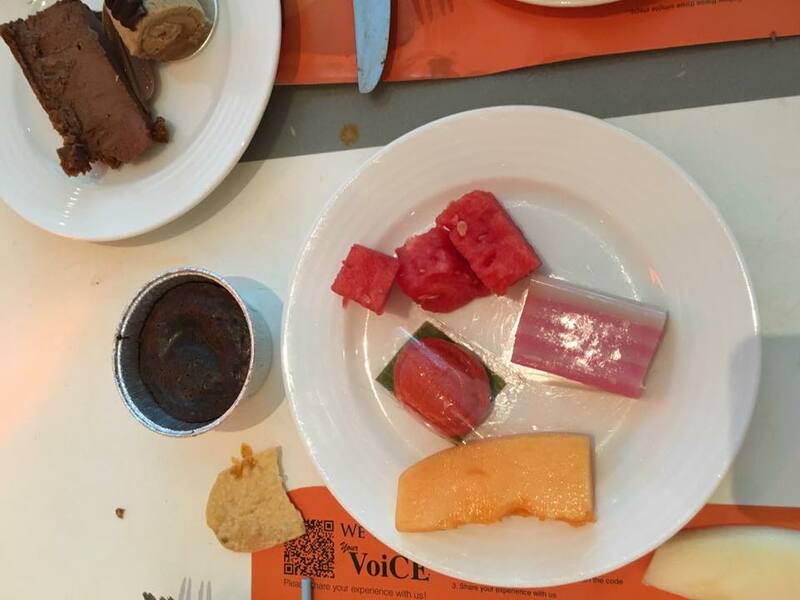 vegetables were very good also. 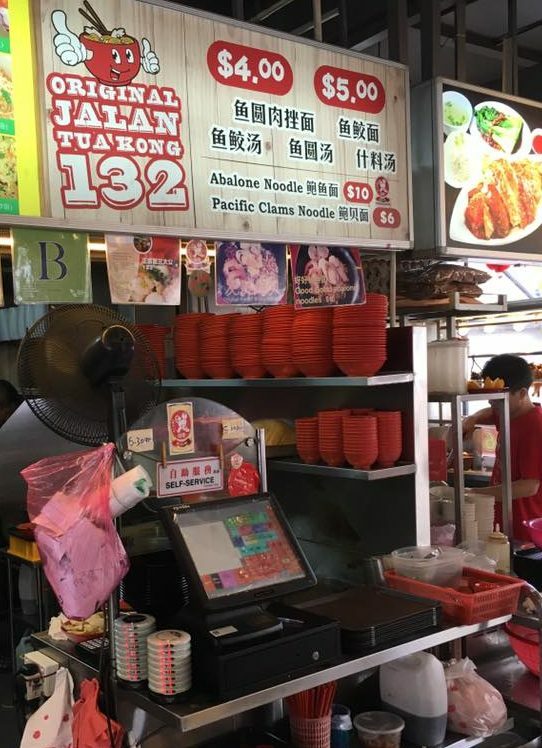 this supposed to be the famous stall at eunos then changi road before relocating to serangoon gardens. 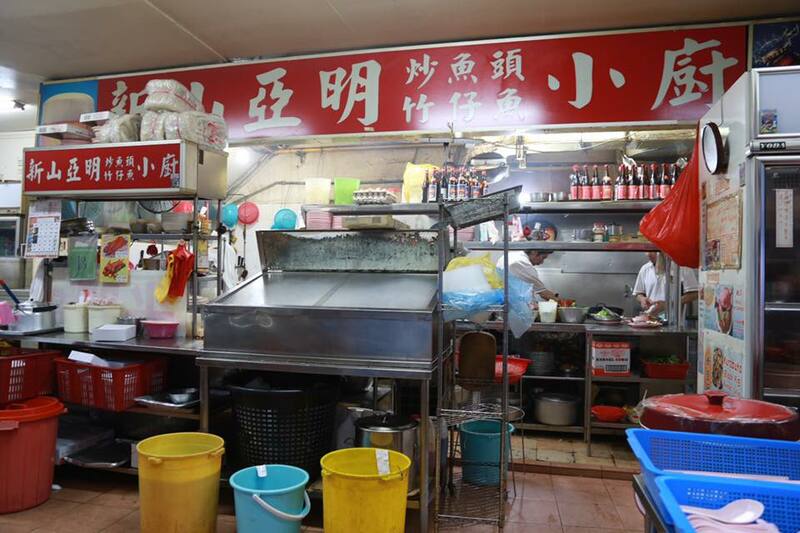 & the stall holder used to be known for clanging his ladle on a plate when he cooked his noodles. 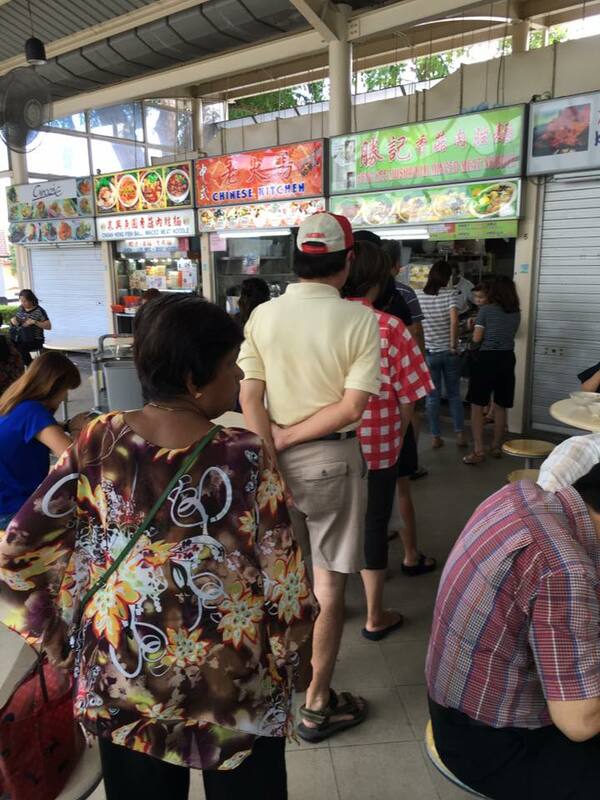 it was almost 12pm, & there was a queue of about 8pax ahead of us, though when we collected our bak chor mee, there was only 1 person behind us. queue was maybe 15mins. 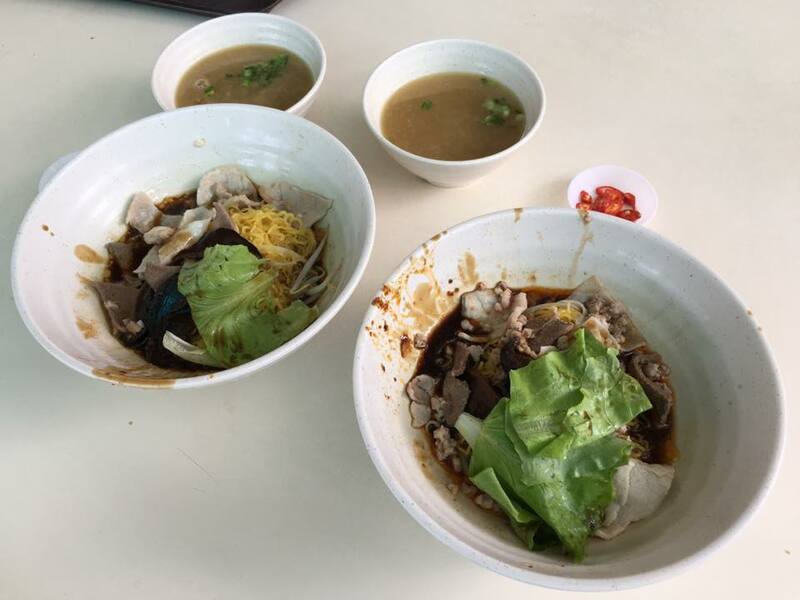 we ordered a S$4 bowl dry mee kia. the chilli looked potent & great. 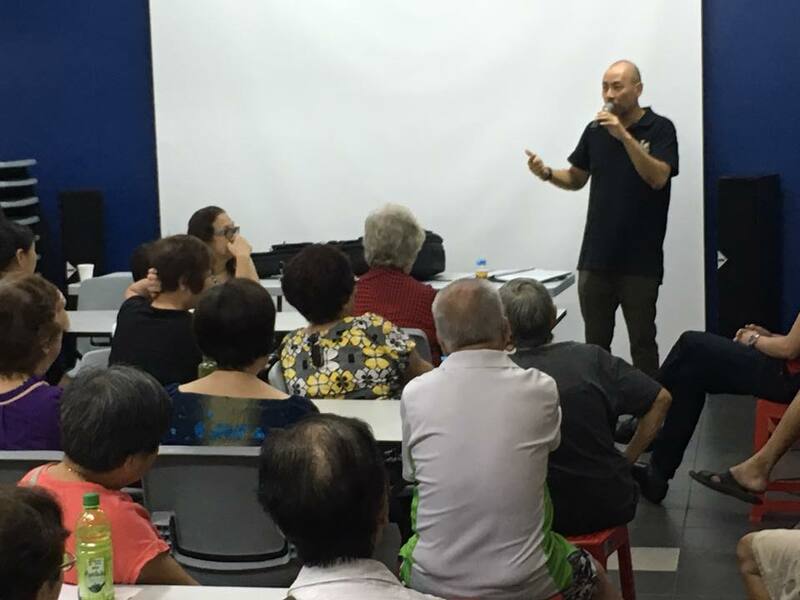 however after all these build up, the results was much below expectations la…. 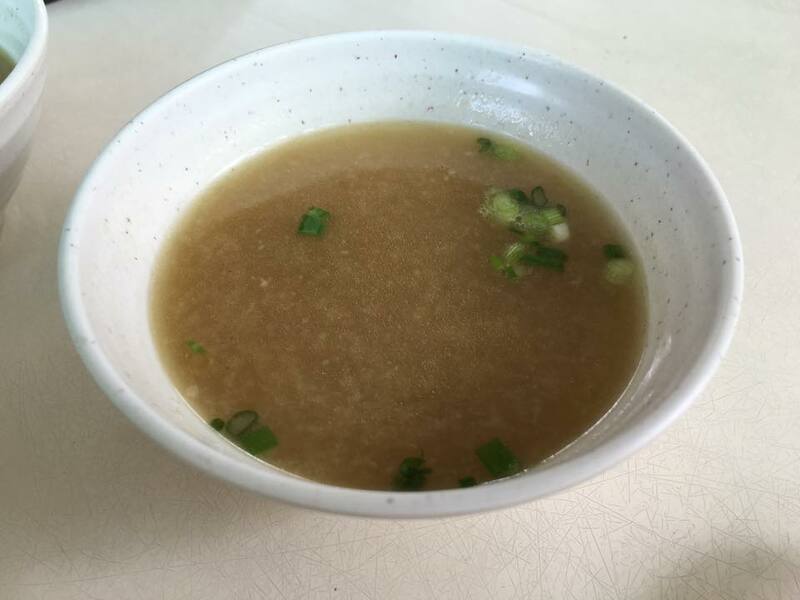 today the soup was quite tasty…. surprisingly i forgot to check my own blog post that i made 2 years ago on 19.11.2014. “that should have been promising, however the results were very disappointing. 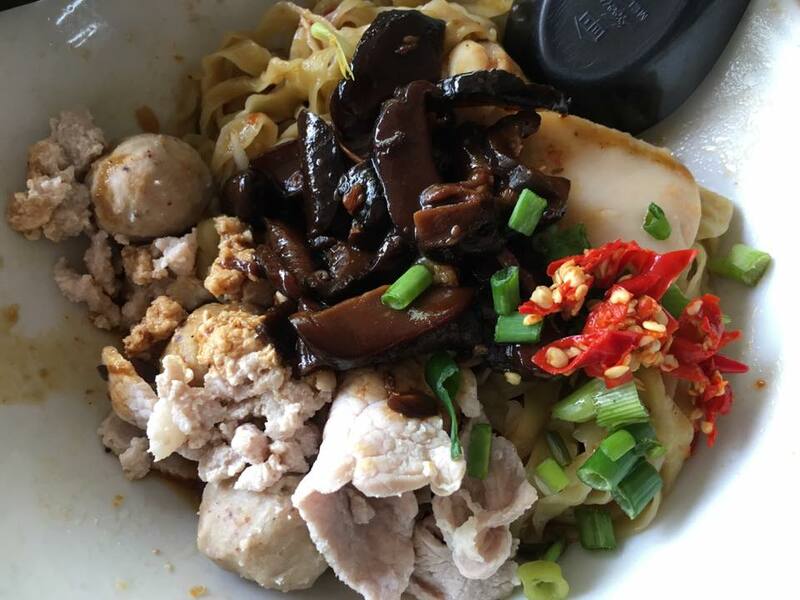 i would say the bakchormee was totally mediocre, can probably get better from any coffeeshop or hawker centre. for us, the main failure was the chilli. i went to ask for more chilli. chilli looked potent but it had no taste no kick. 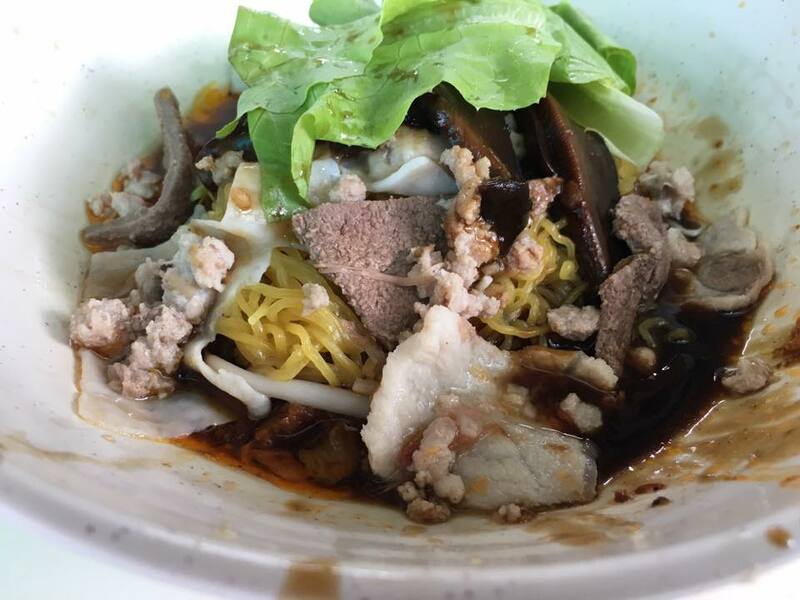 my wife’s mee kia (thin noodles) was still qq, my meepok was becoming soggy. 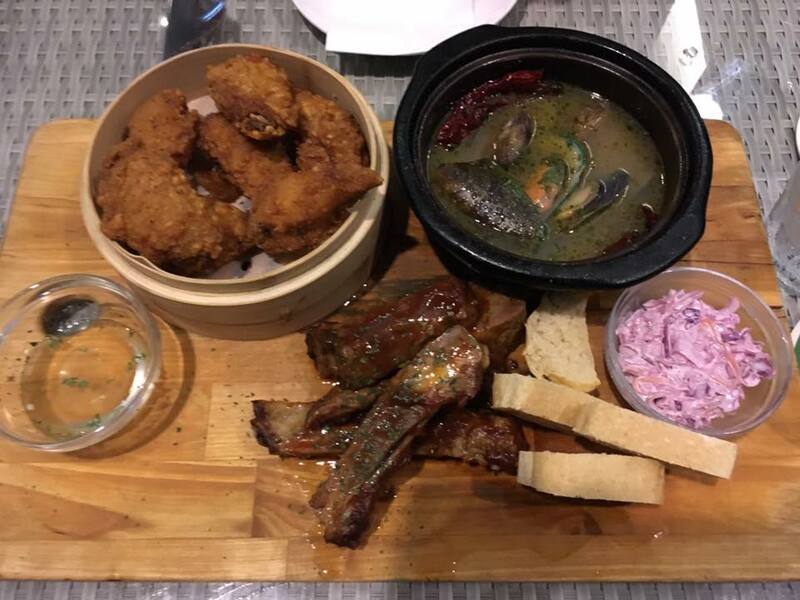 the ingredients were quite good, with teepor (dried flatfish/sole) & her kilo (fish dumplings), mushroom sauce, liver, lean meat etc”. 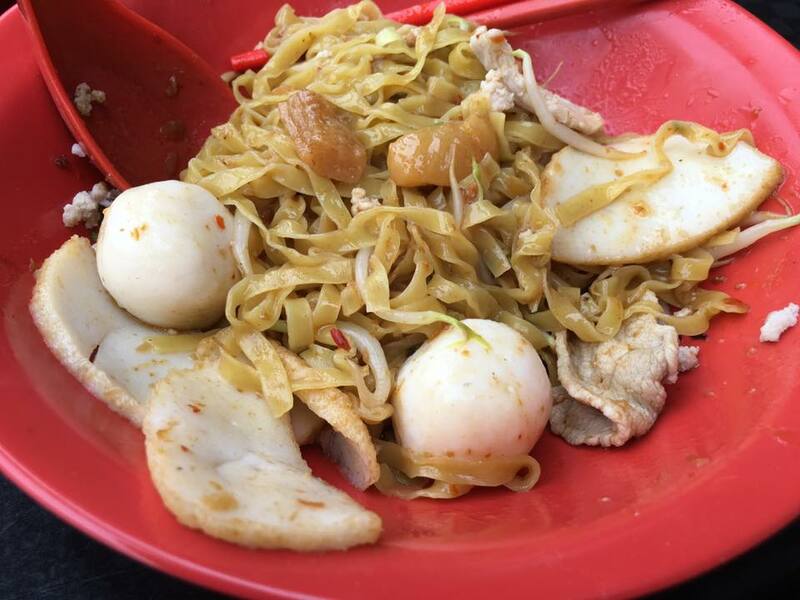 Quite surprise noodles soggy not qq …I thot any body can make qq noodles nowadays??? 2 times over a 2 year gap the same mediocre experience quite enuf for me. 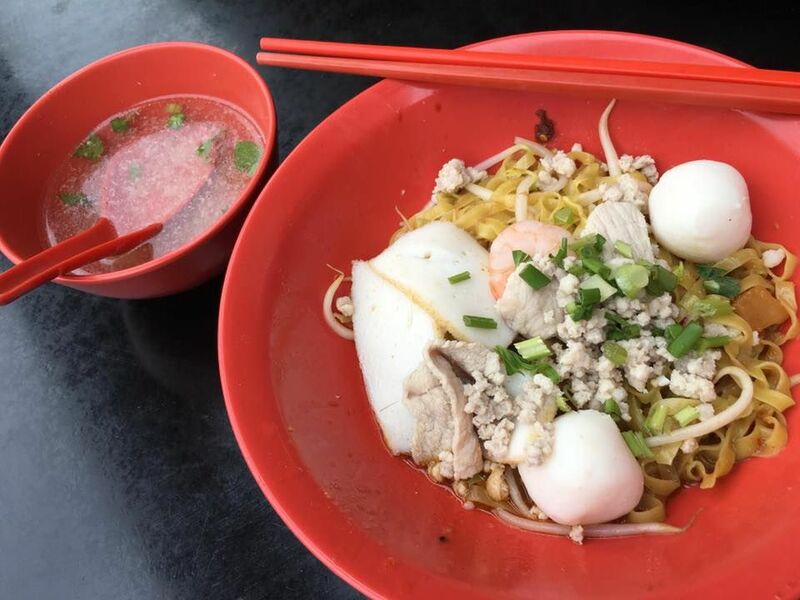 don’t think i want to try this bak chor mee again. 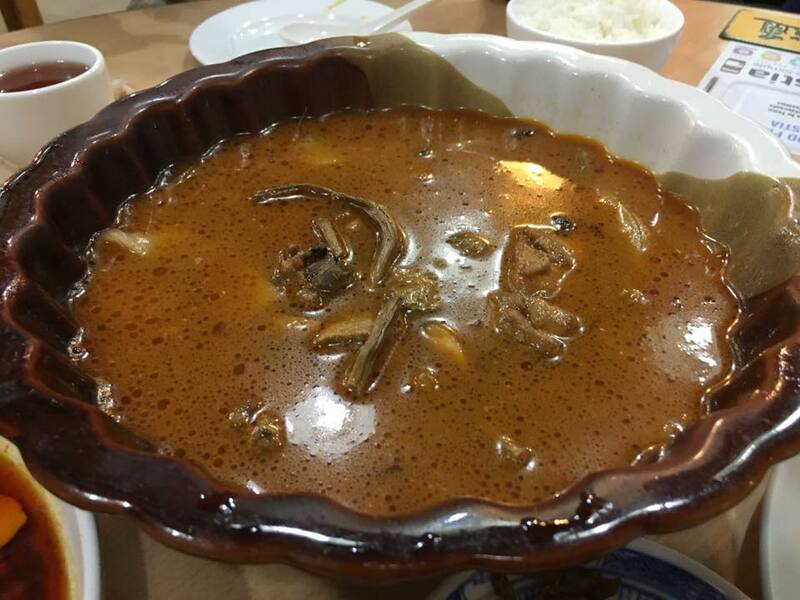 we had wanted to go G7 sinma for frog porridge. 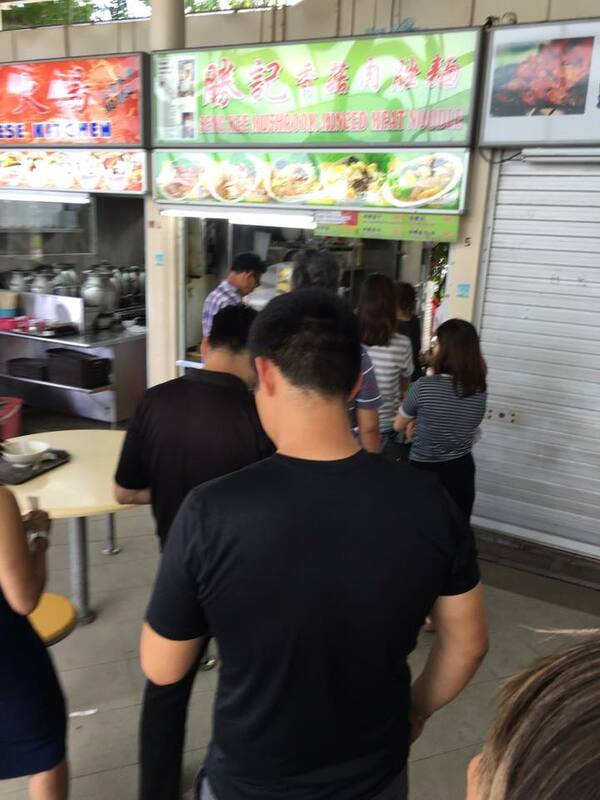 but there was a long queue. 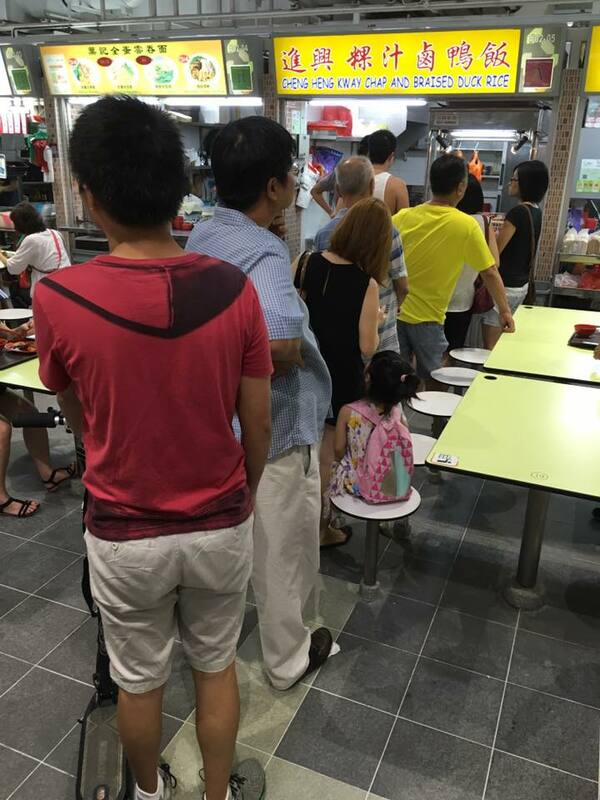 we not quite the queueing type, not for sinma frog porridge anyway though it is very good. only 2 of us. 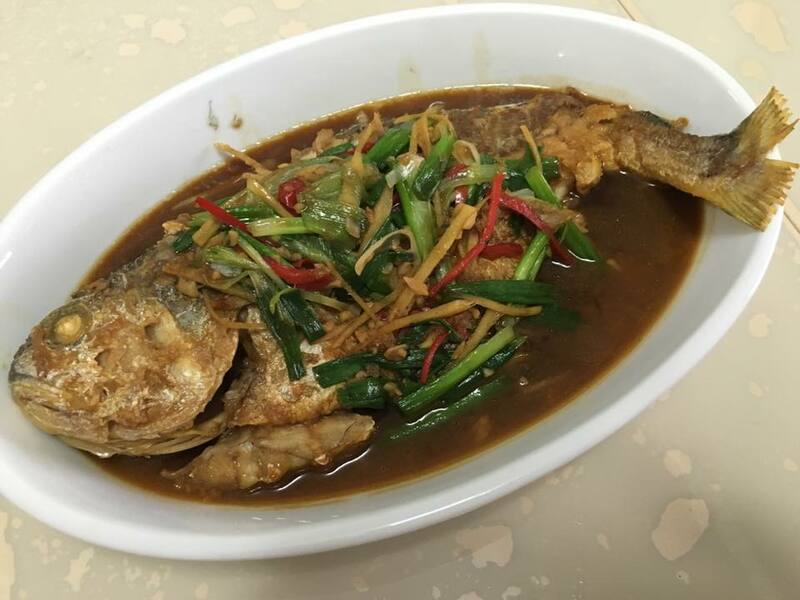 decided to just drop in at forture for thai style fish head curry on 12.9.2016. din have to wait long <10mins. 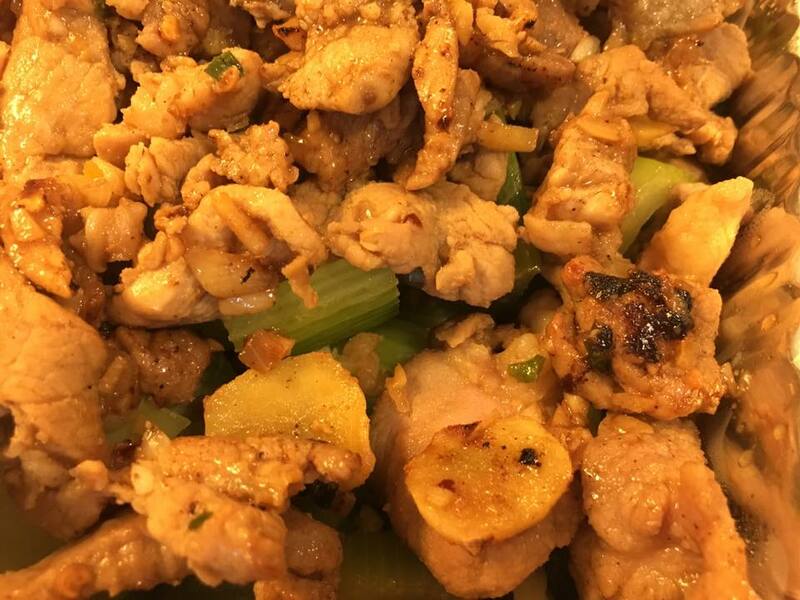 the special slight sour, tangy sauce is a winning formula. 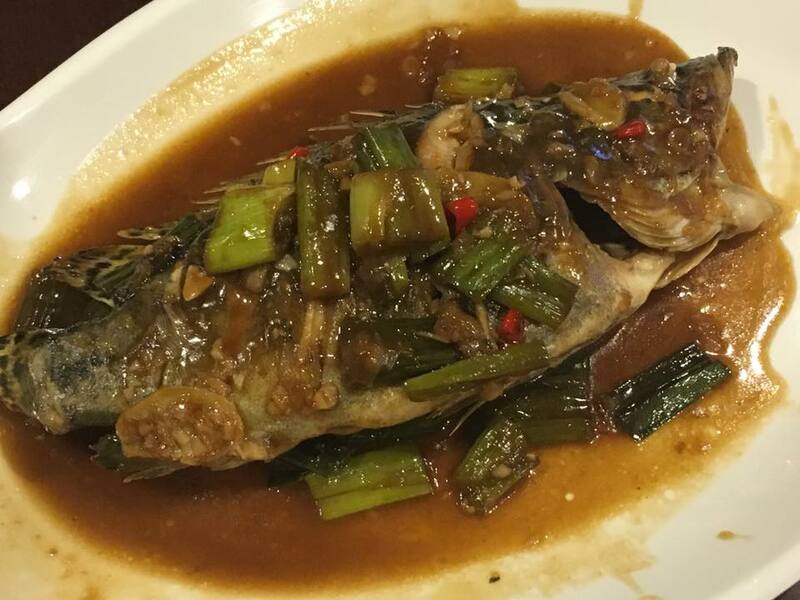 & of course the fish head is very fresh. & lots of vege. we eaten here many times. 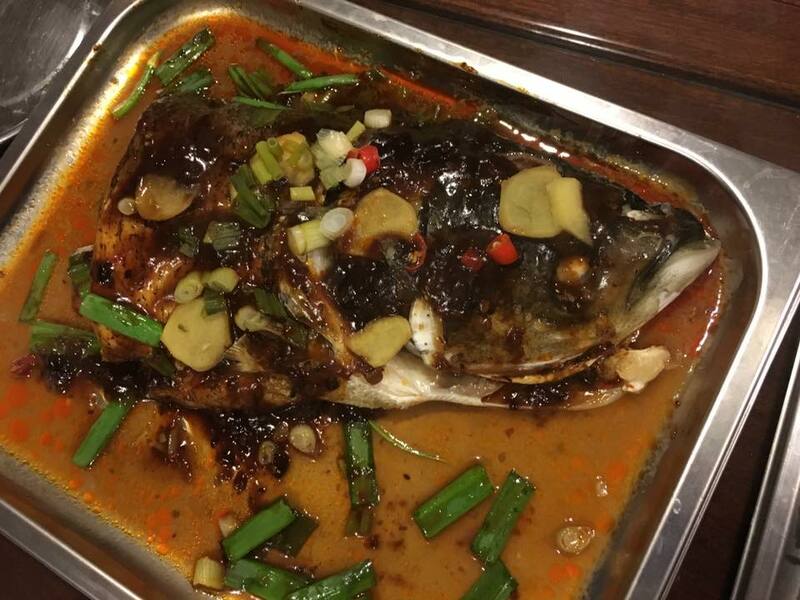 maybe only twice fish head not so fresh. 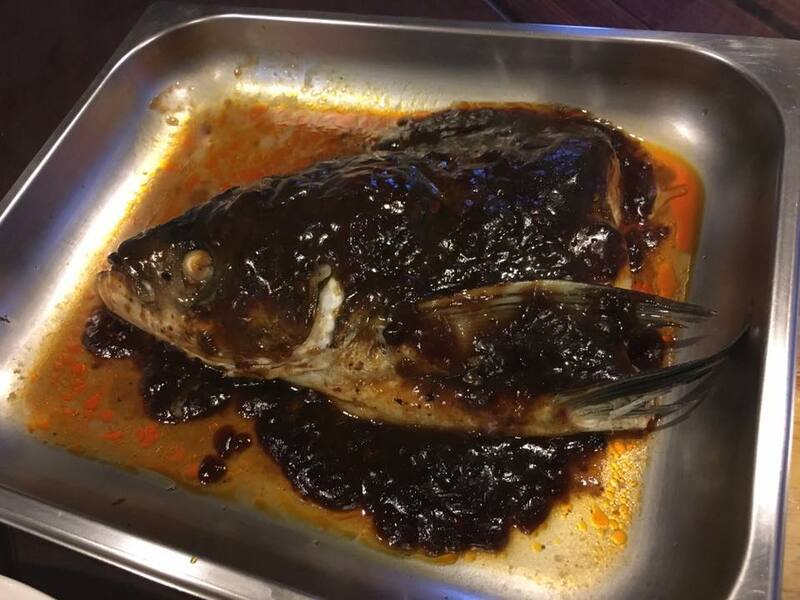 tired of sambal kang kong etc. 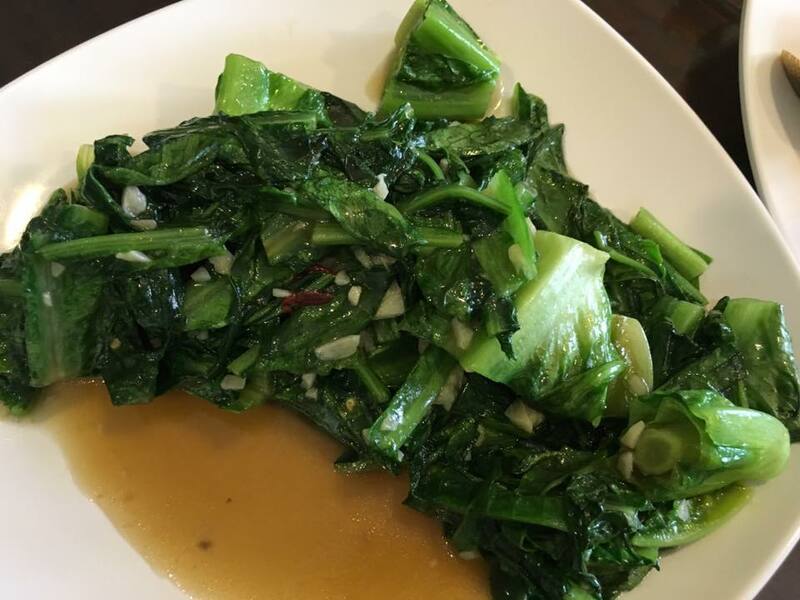 we decided to have a plain stir-fried thai kailan. it was very good too. 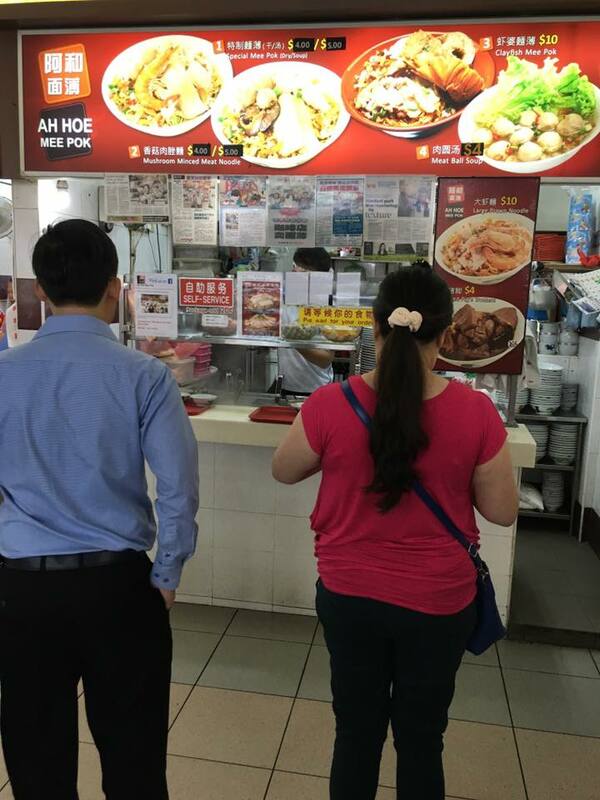 price was ok for zi char places these days. not cheap not expensive also. sometimes the restaurants give better deals with discounts etc. 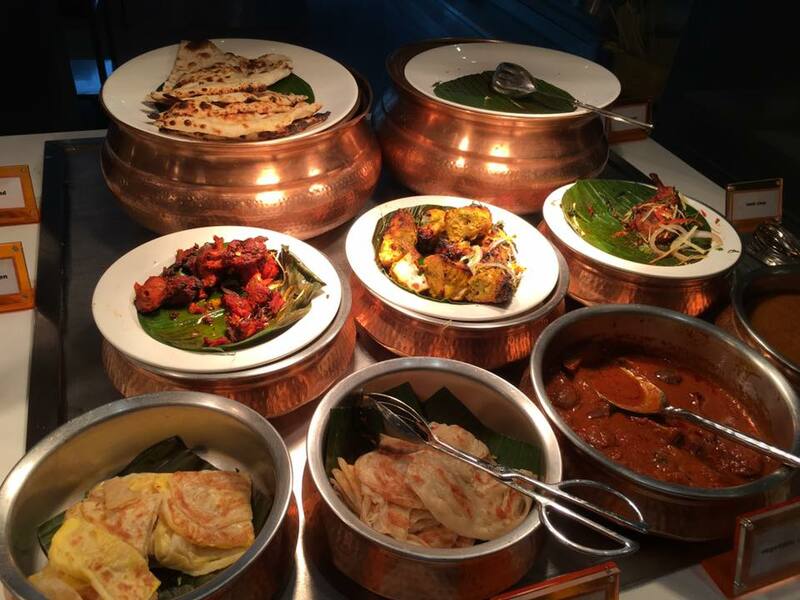 but we need variety of food, preparation, and also ambience & mood. it was a good dinner with wife. 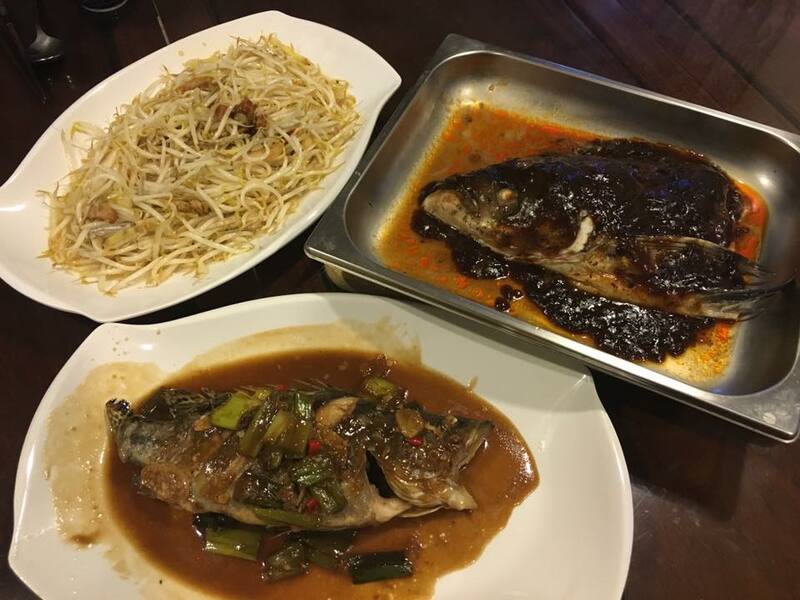 excellent fish head, good fried vege, ok prices.